The garden has been busy for the past few days. 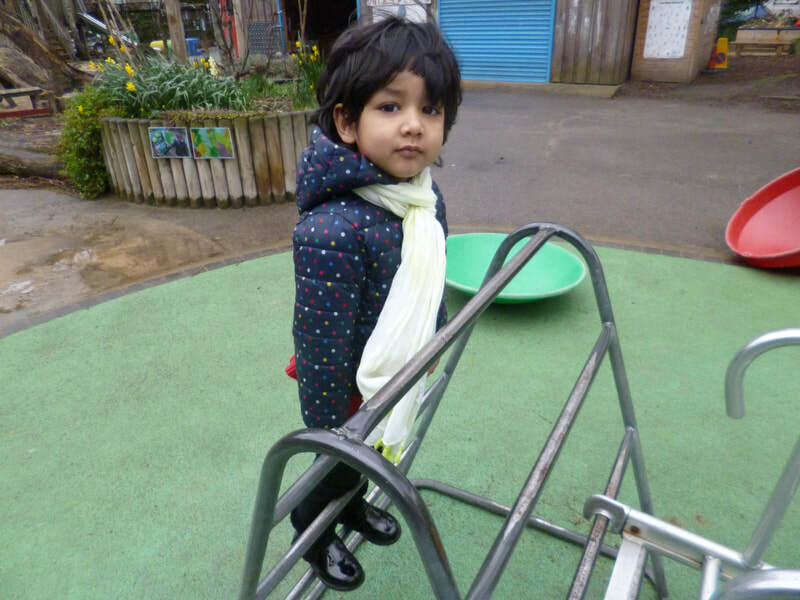 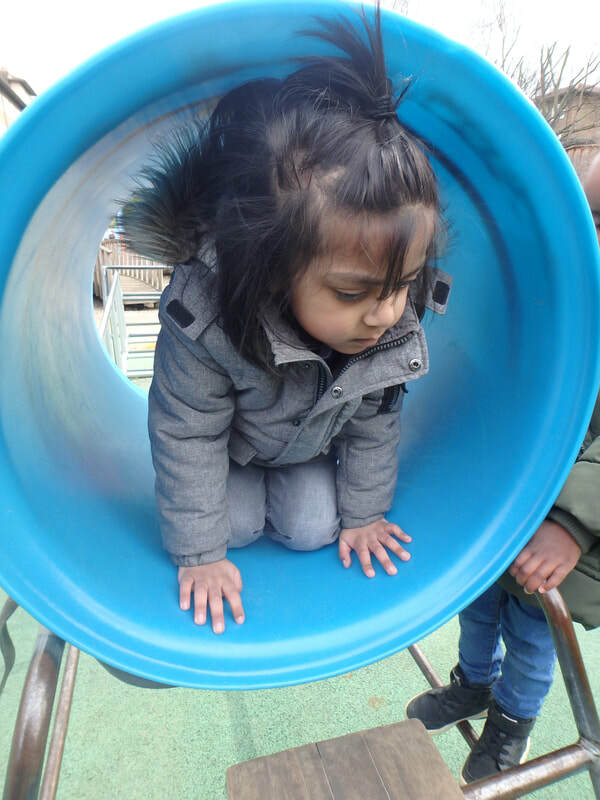 Our Rachel Keeling family have returned and enjoyed some sustained play and exploration between showers. 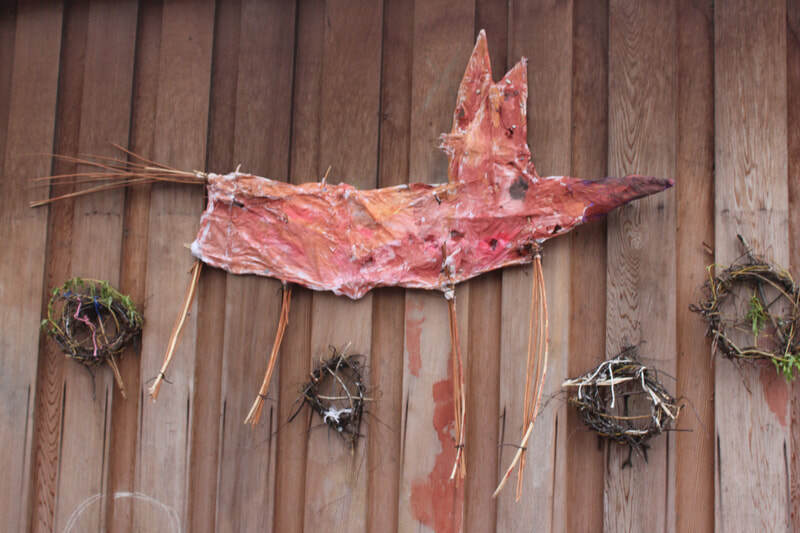 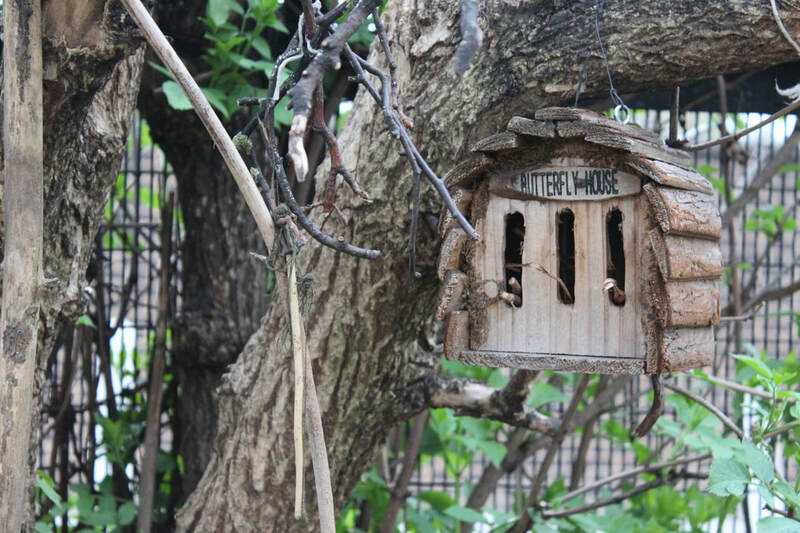 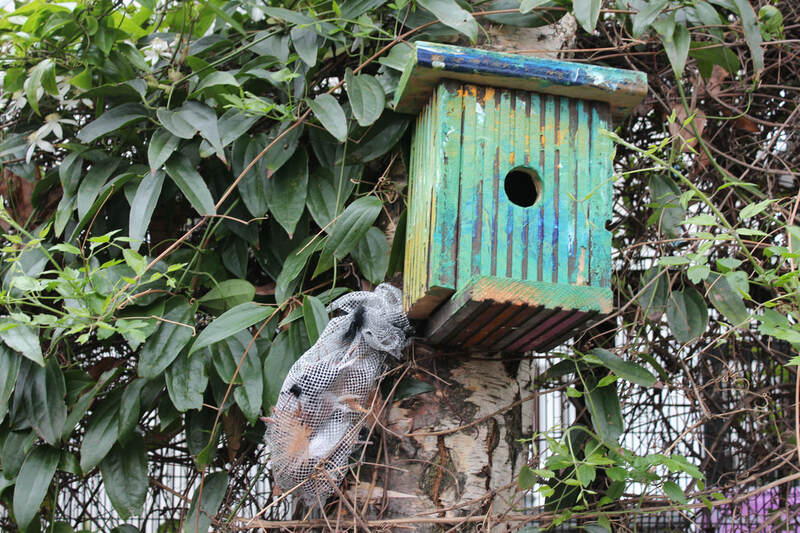 Our renovated bug's hotel, bird boxes and wicker fox are all up and in use. 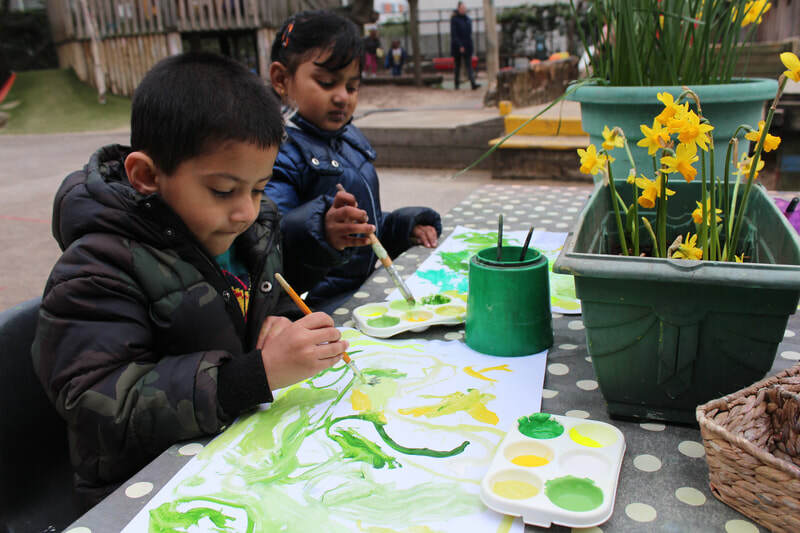 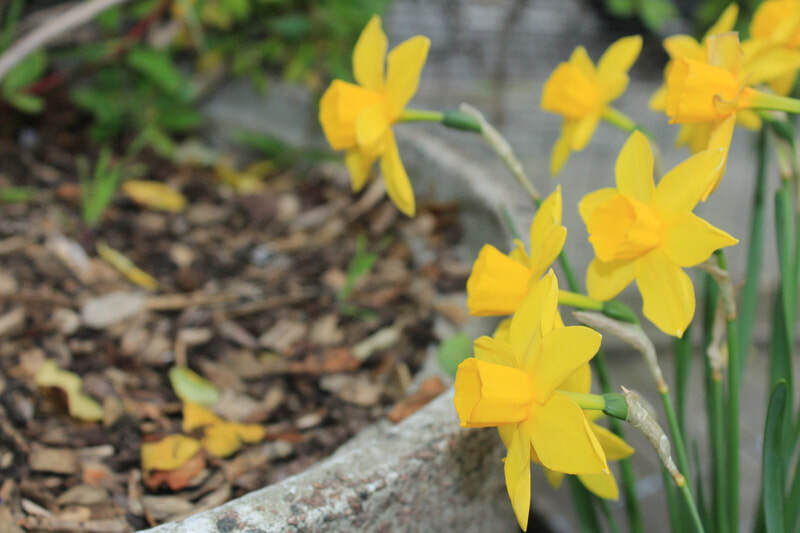 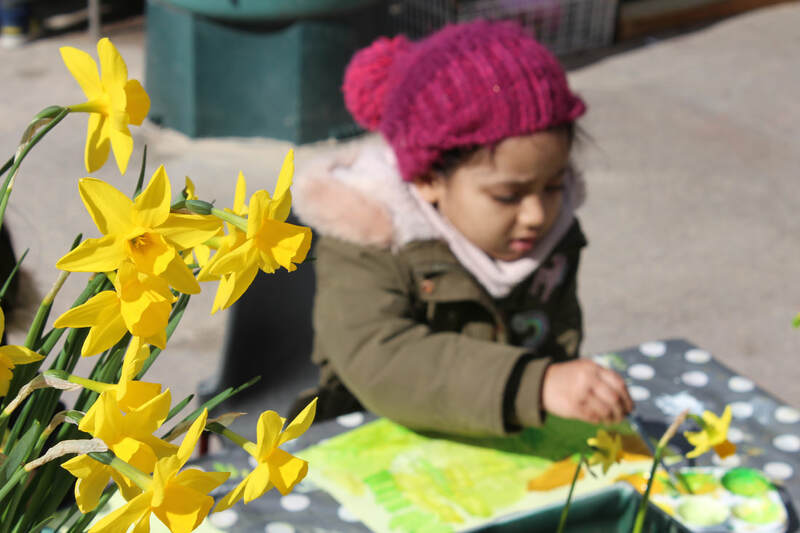 Children have noticed the daffodils they observed and painted have now wilted but signs of growth are coming through. 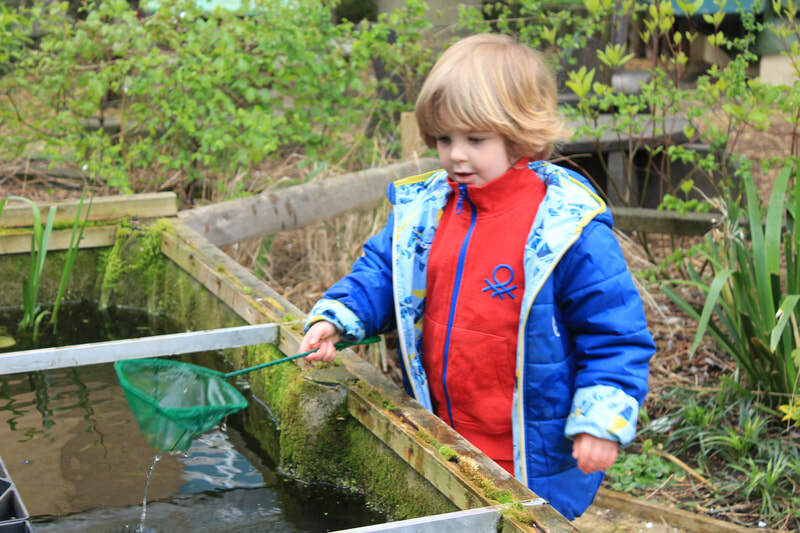 Groups of children have helped to clear the pond of debris and now we are researching how to care for the flora and fauna we have there. 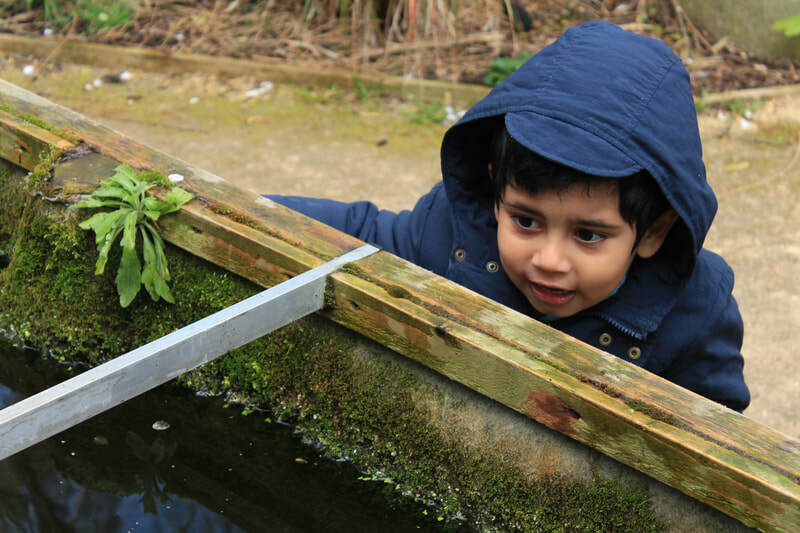 No tap water for us, it should be rain water all the way! 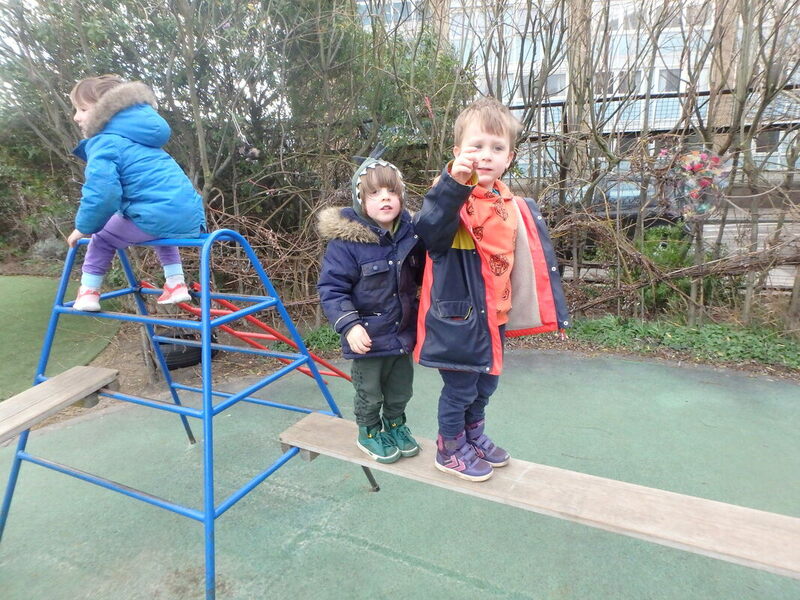 We are planning to talk to the children about rationing the water used in the garden for imaginative play. 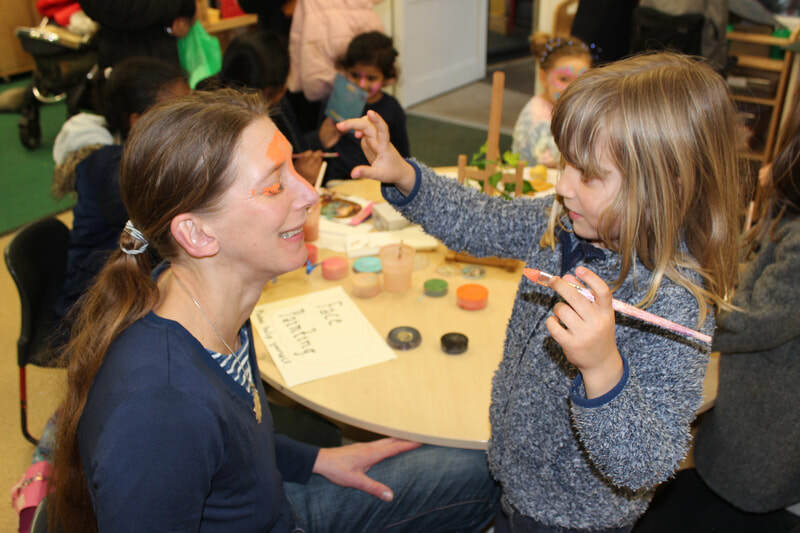 The #extinctionrebellion protestors have helped to focus thinking on our planet and the sustainability of it for future generations. 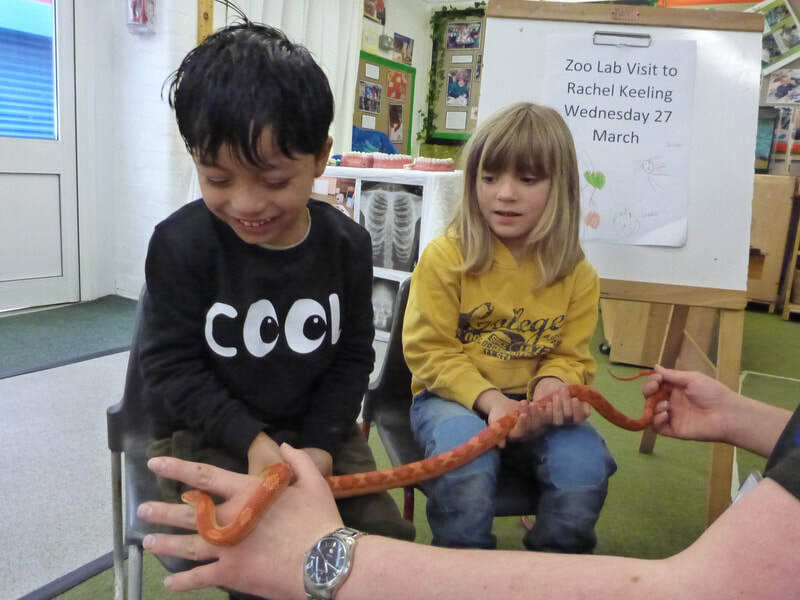 We at Rachel Keeling will be reflecting on this moving forward in everything we do. 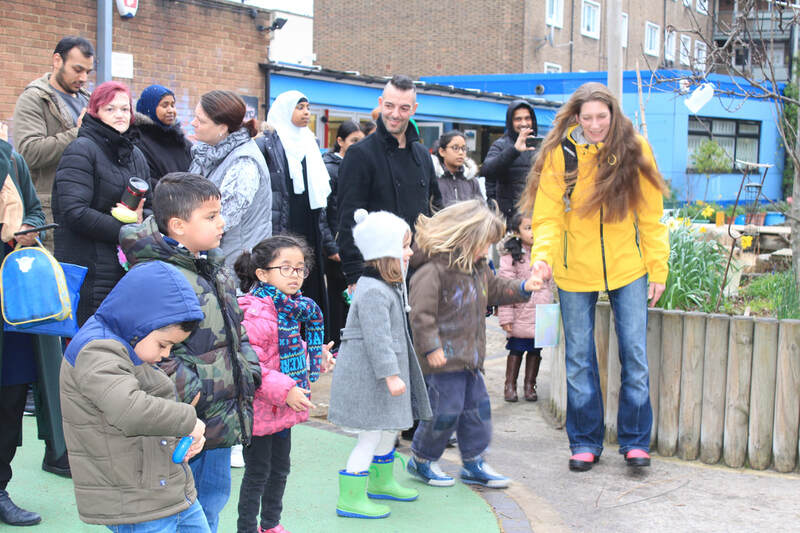 Starting with the bikes - let's get everyone cycling! 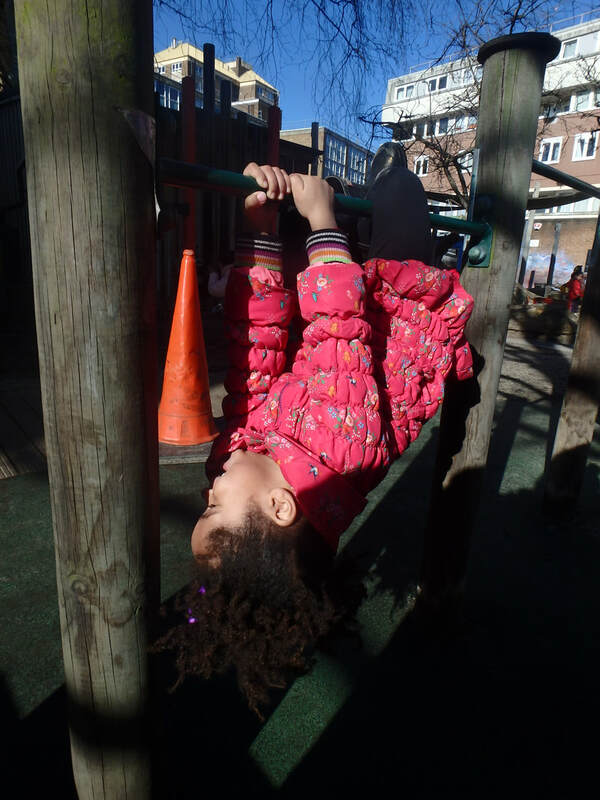 We know that a healthy body helps a healthy mind. 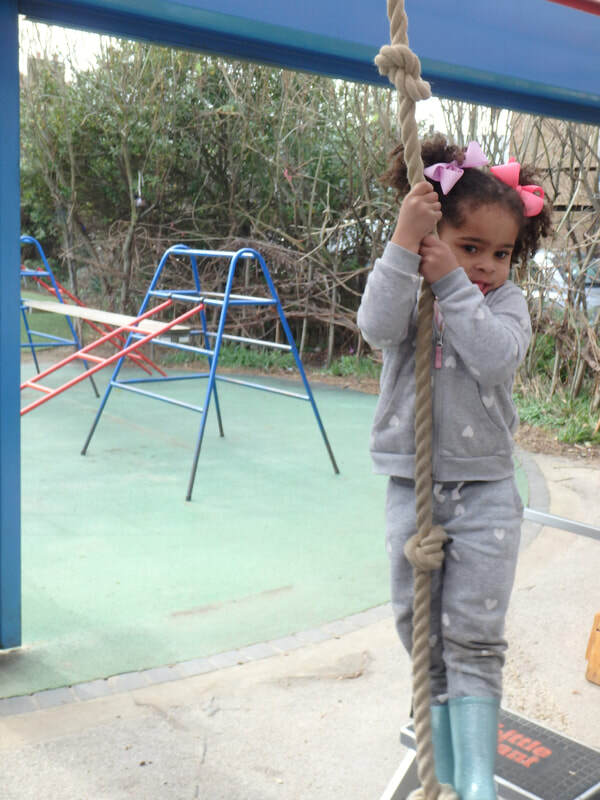 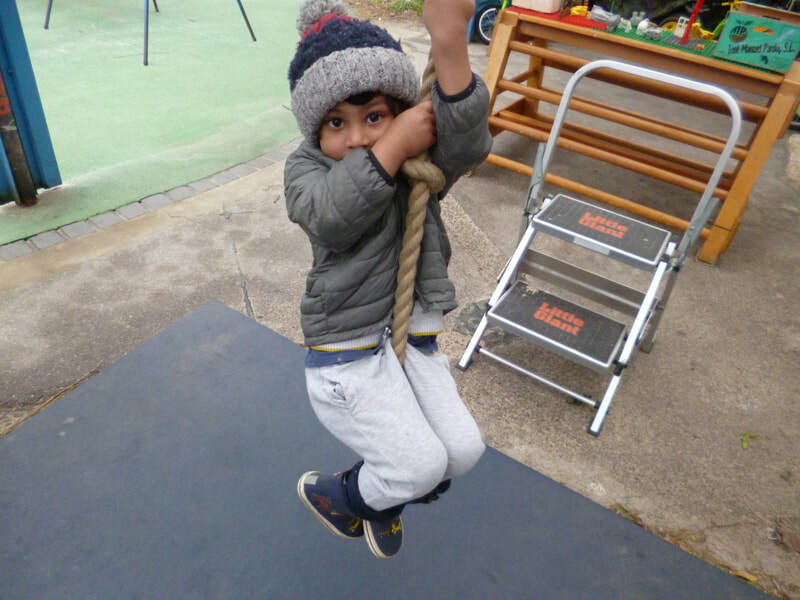 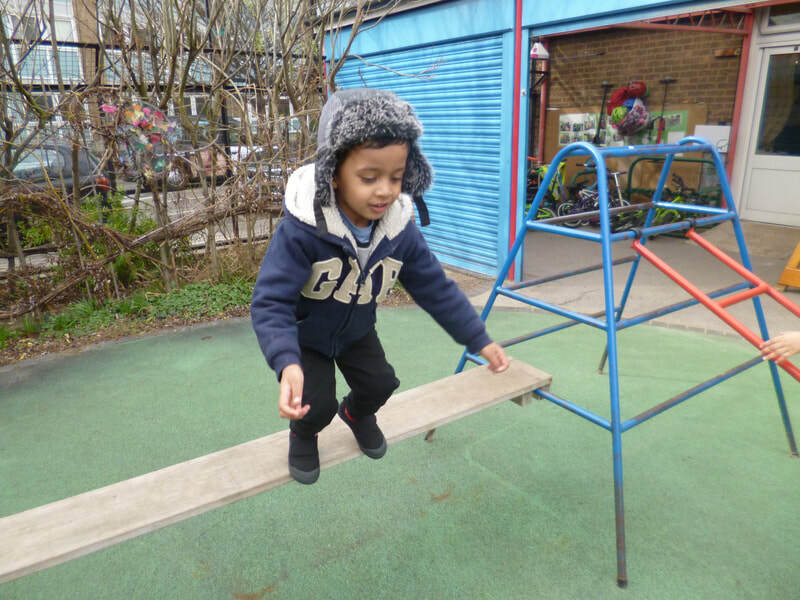 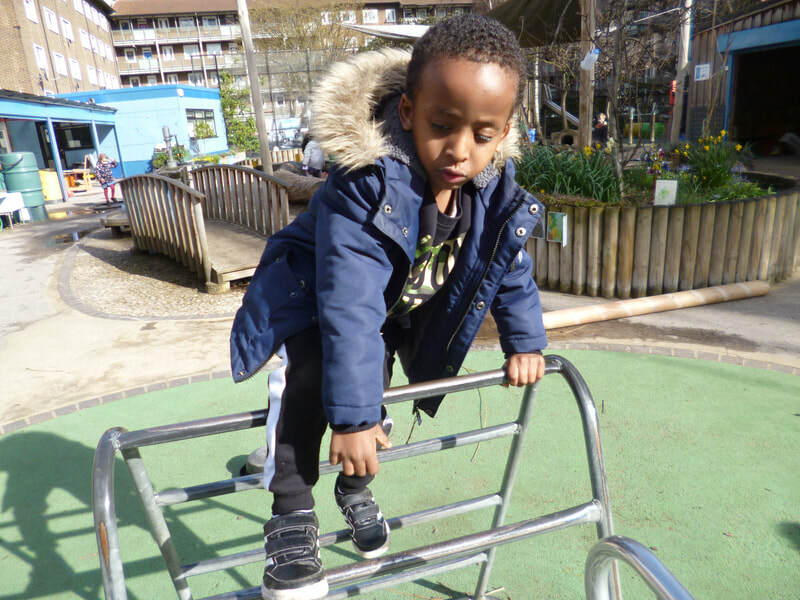 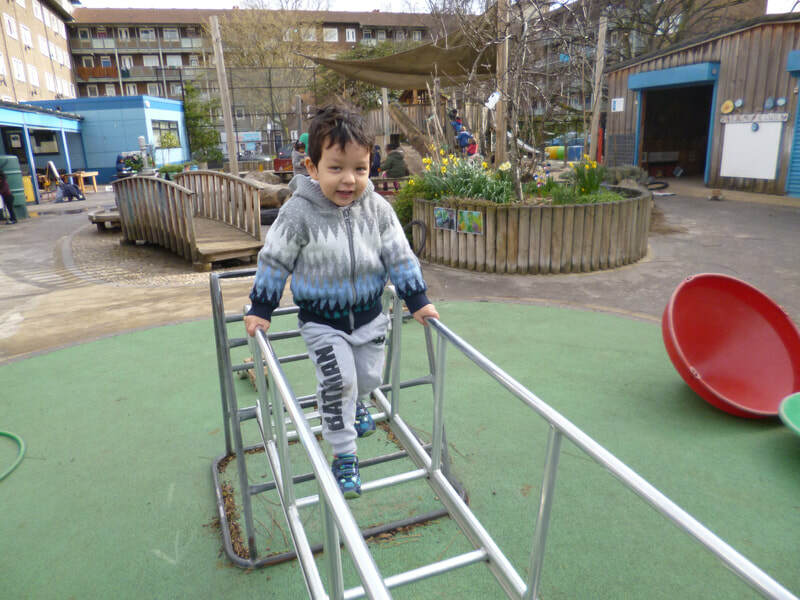 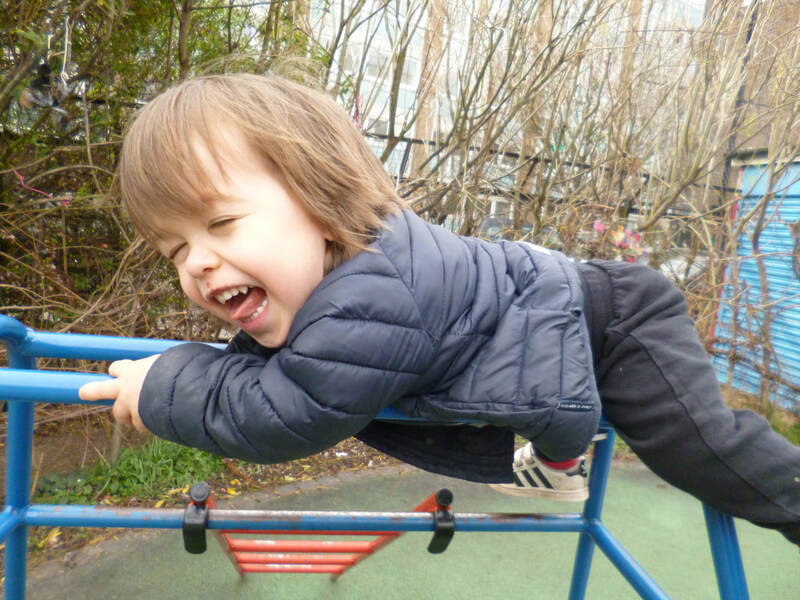 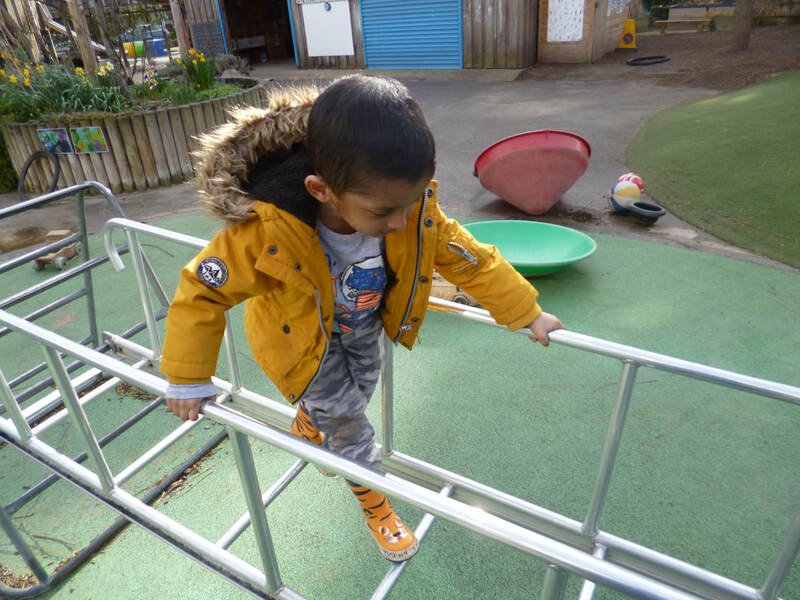 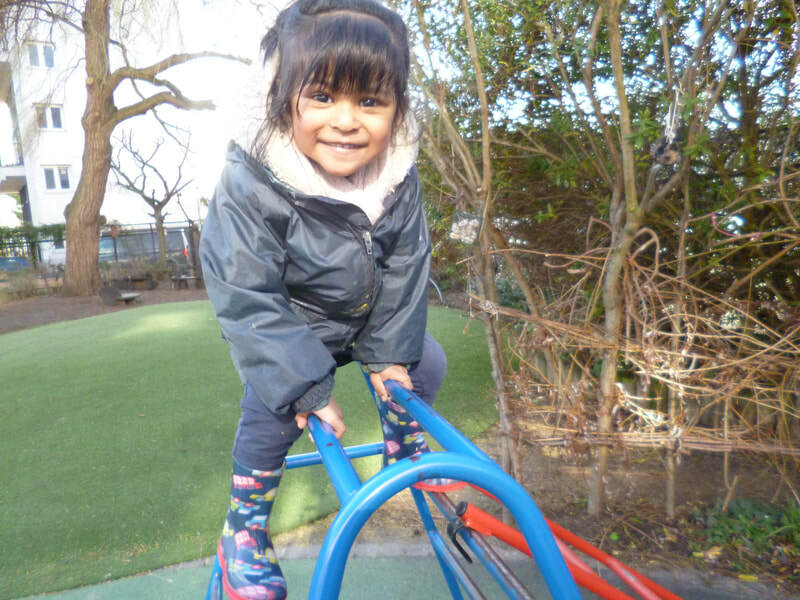 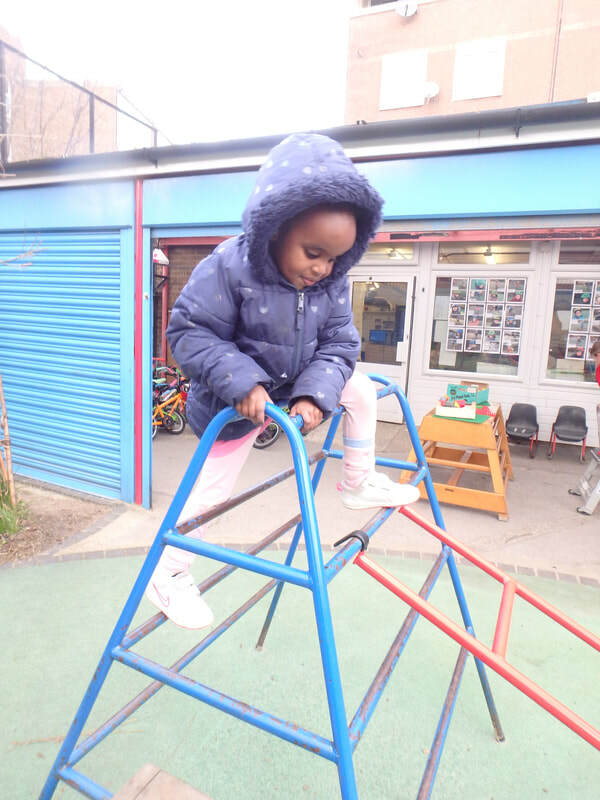 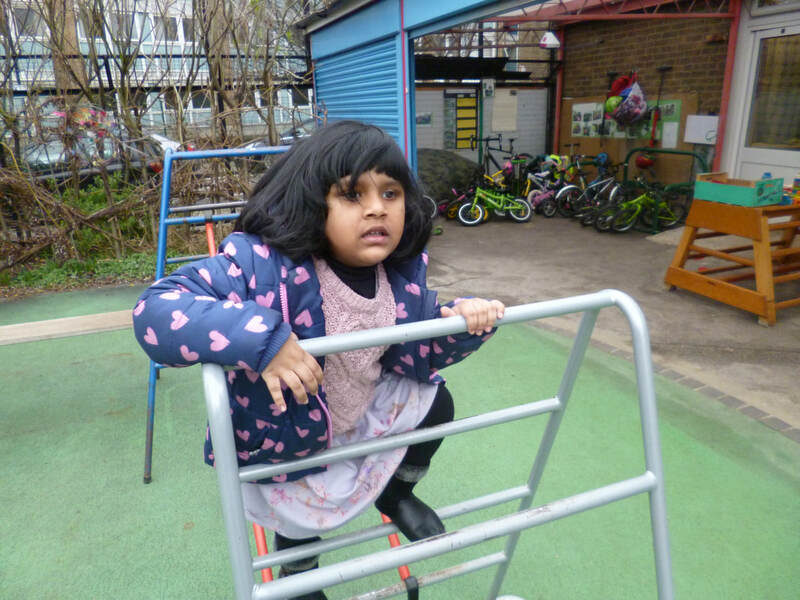 We also know that research shows children who develop balance and skill in climbing will often develop fine motor skills and writing when they are ready. 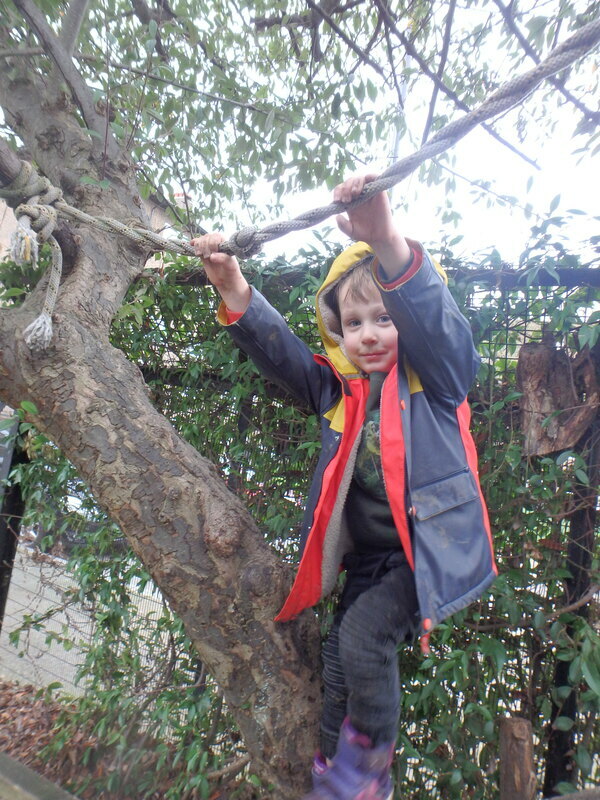 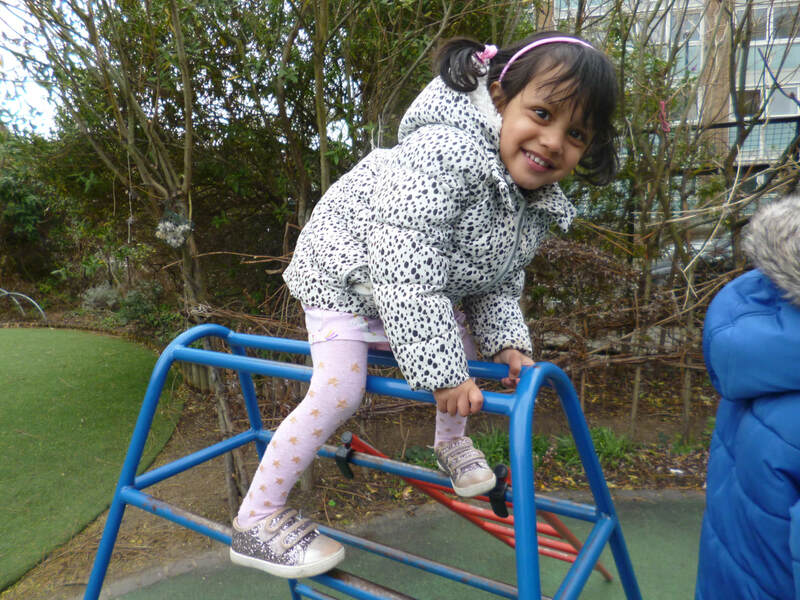 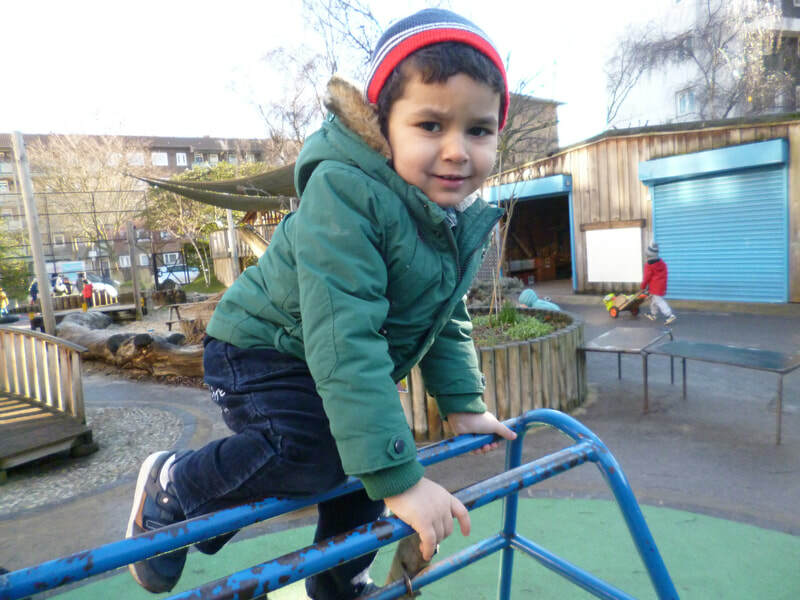 At Rachel Keeling we have a large garden where the children are encouraged to climb trees and cycle freely. 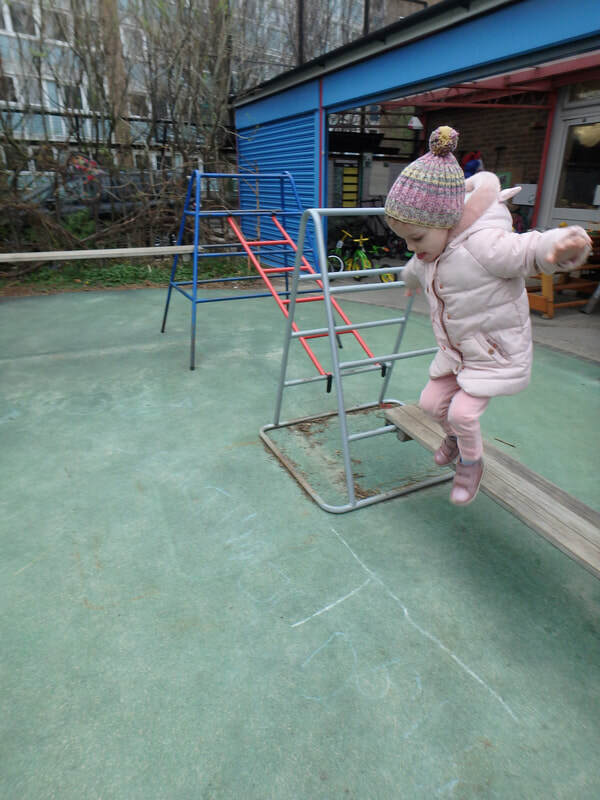 We also have our old favourite A-frames, ladders and planks which staff can position at different heights and gradients. 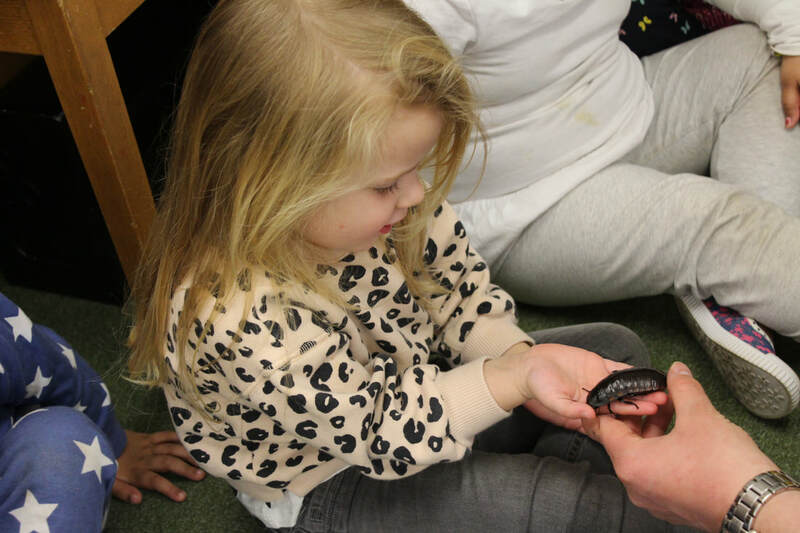 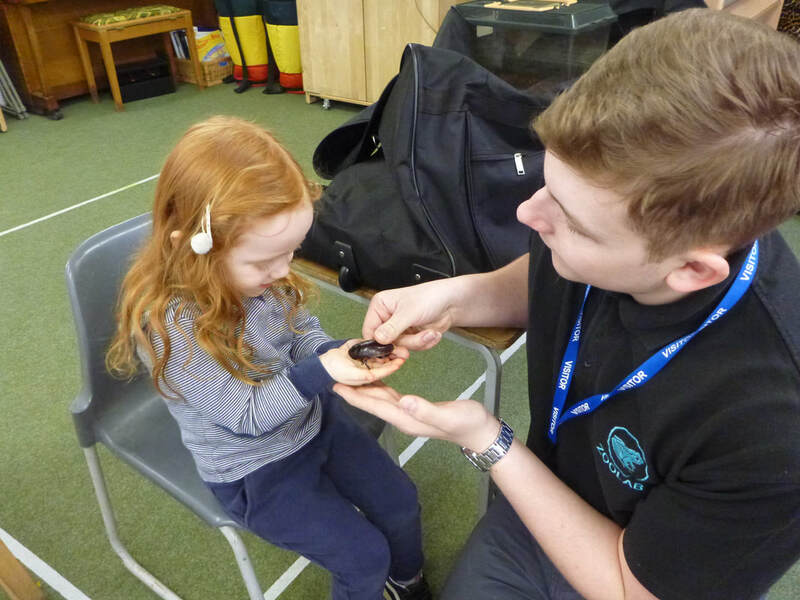 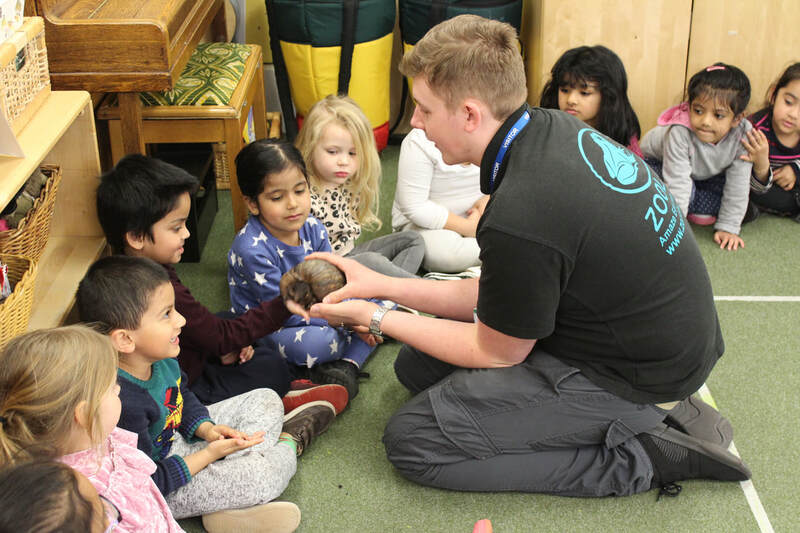 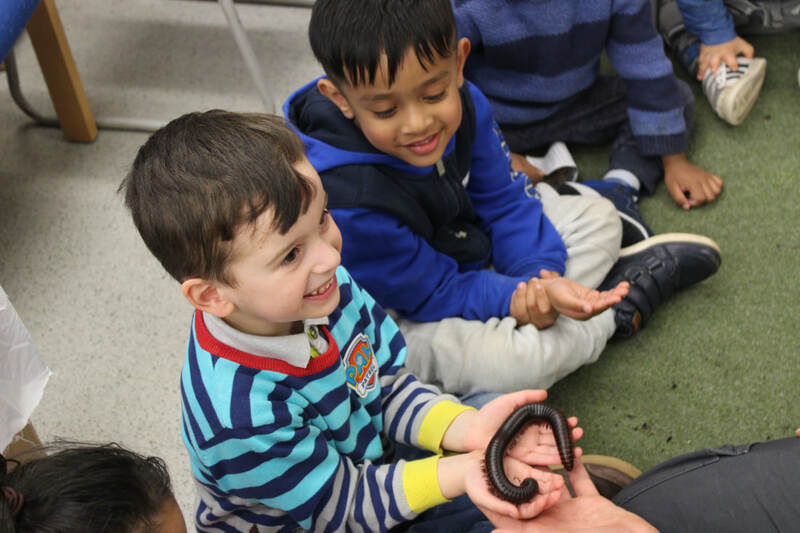 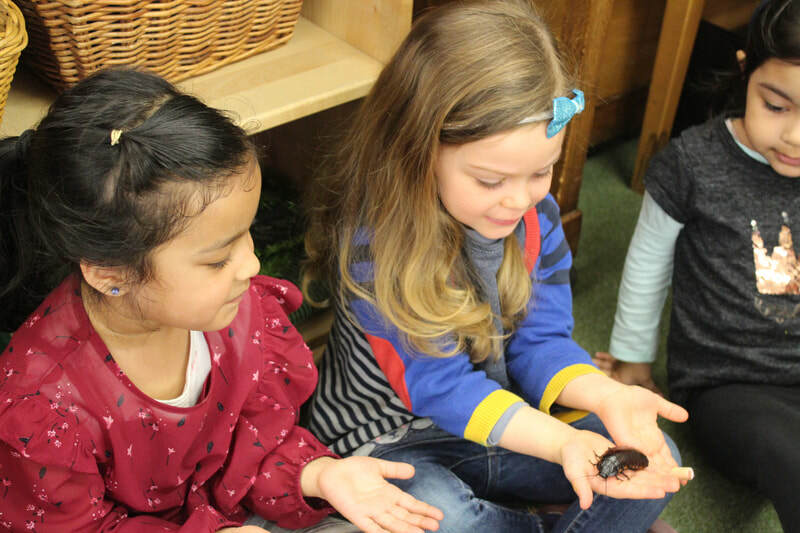 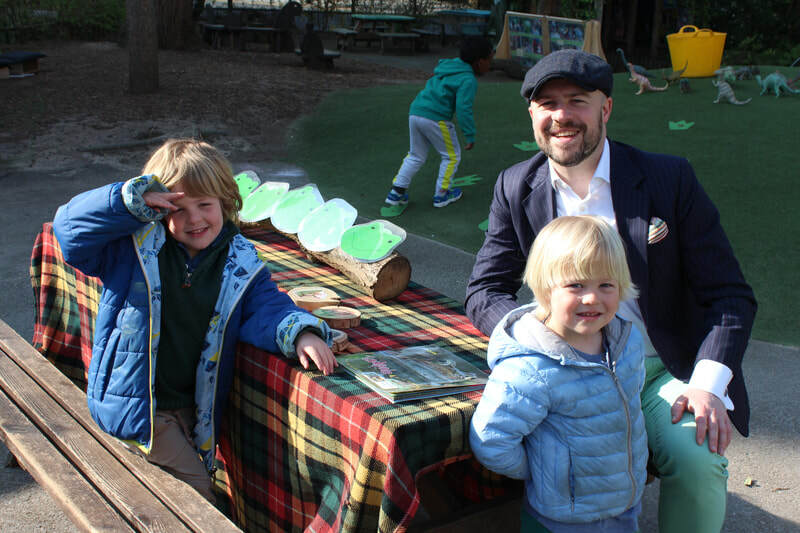 We enjoyed a visit from Zoo Lab's Tom with his colony of fabulous creepy crawlies. 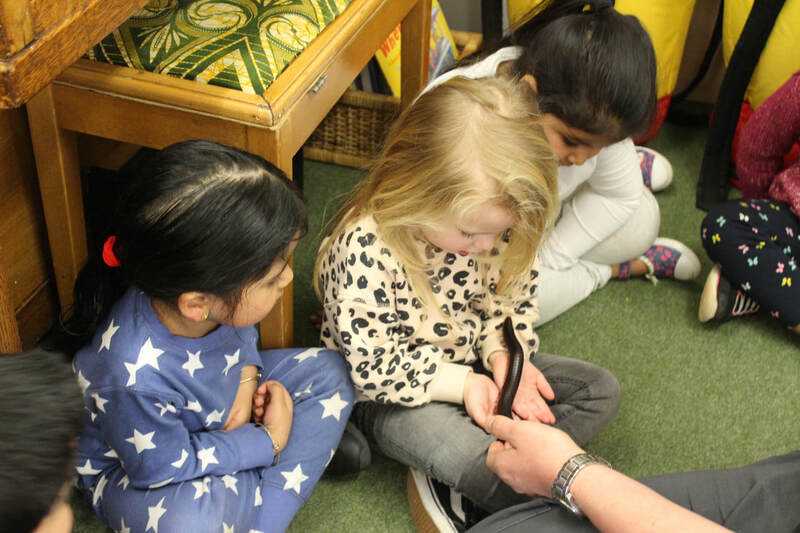 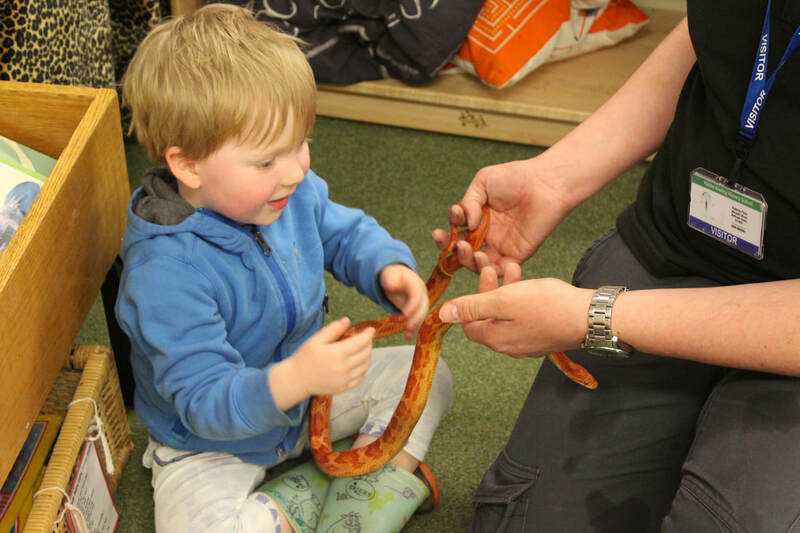 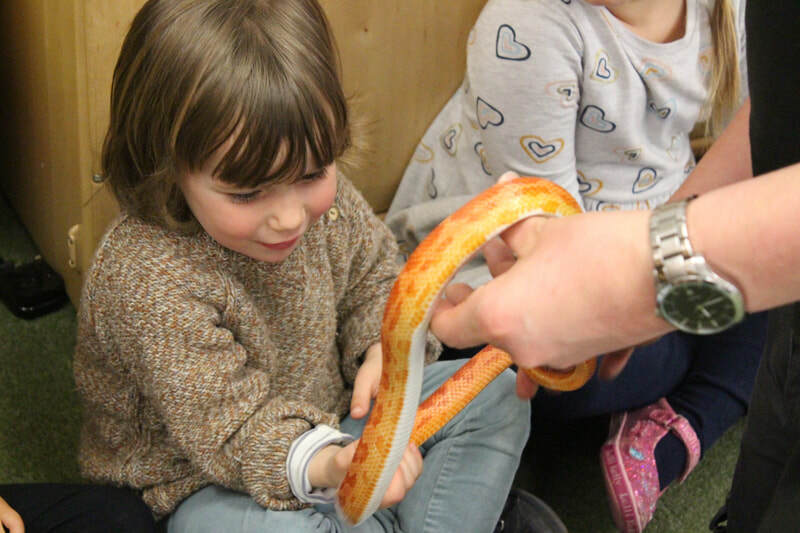 The children came face to face with a tree frog called Trevor, Susan the cockroach, George the corn snake, a giant millipede, Peter the giant African land snail and Lily the tarantula. 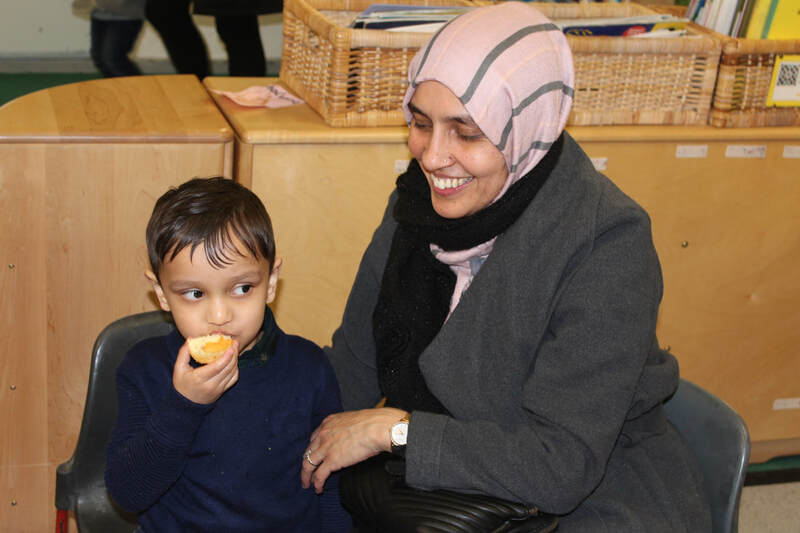 The children greeted the guests with curiosity, warmth and enthusiasm. 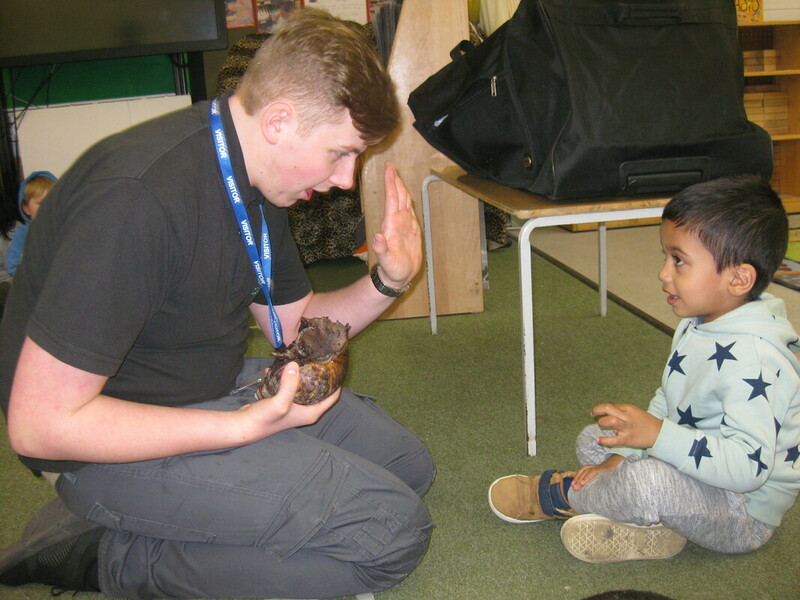 Tom's presentation style made the experience so accessible to our young children. 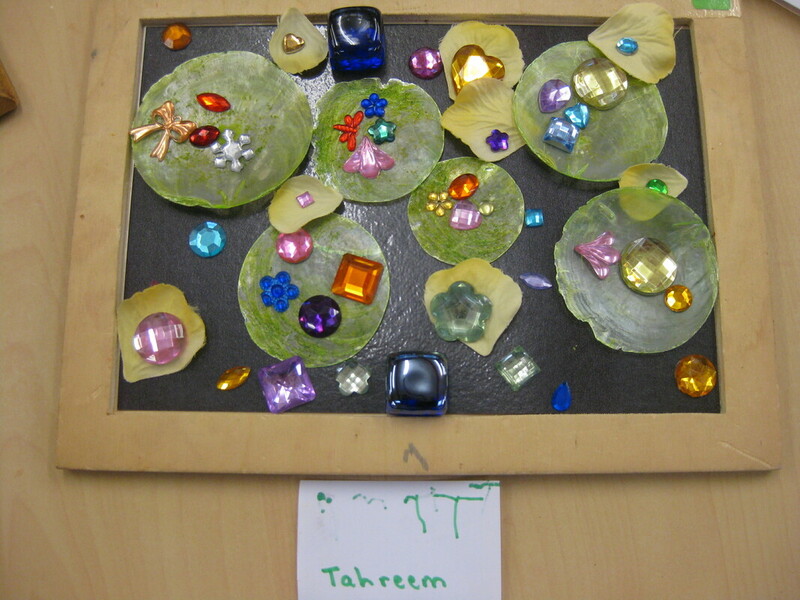 He shared information, allowed children to comment and share ideas as well as ask questions. 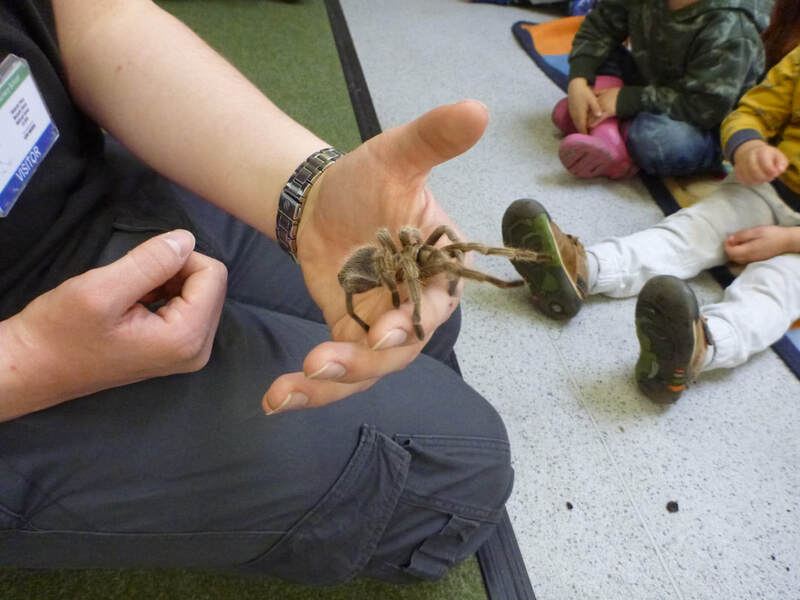 Children and staff were encouraged to handle the creatures gently or carefully observe them if they prefered. 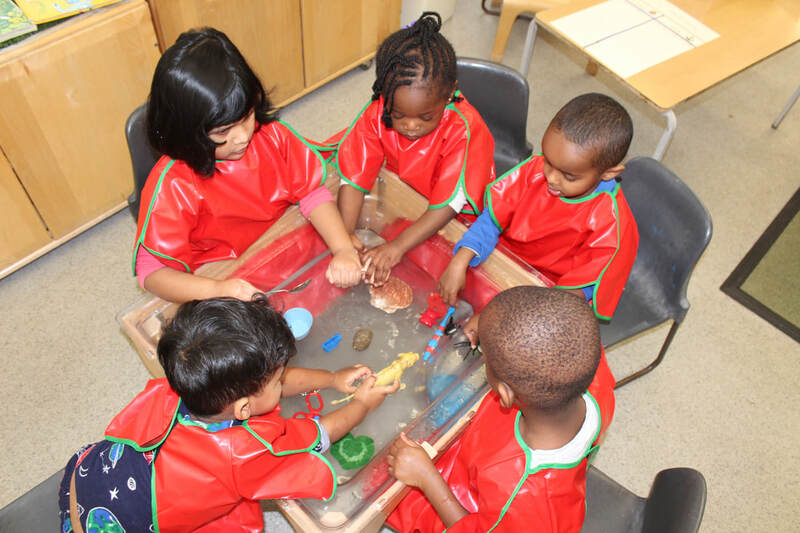 Everyone washed their hands afterwards. 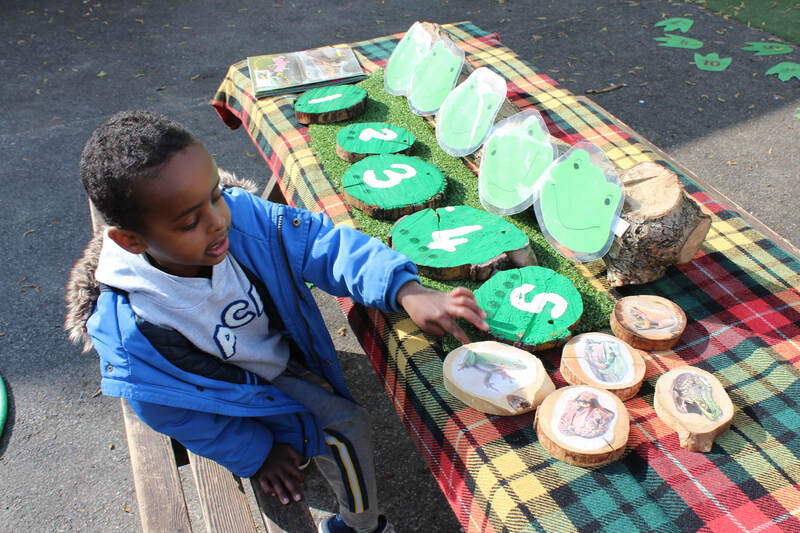 Interesting fact of the week: Trevor the tree frog turns brown when he is unhappy and green when he is happy! 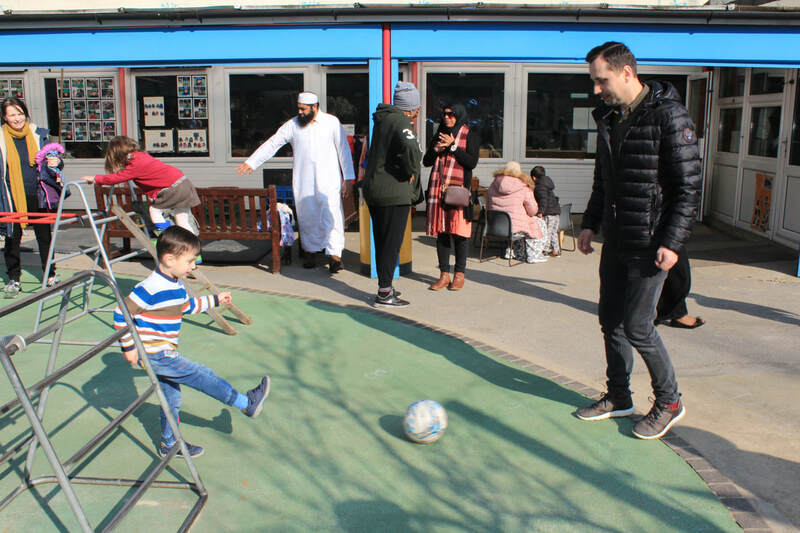 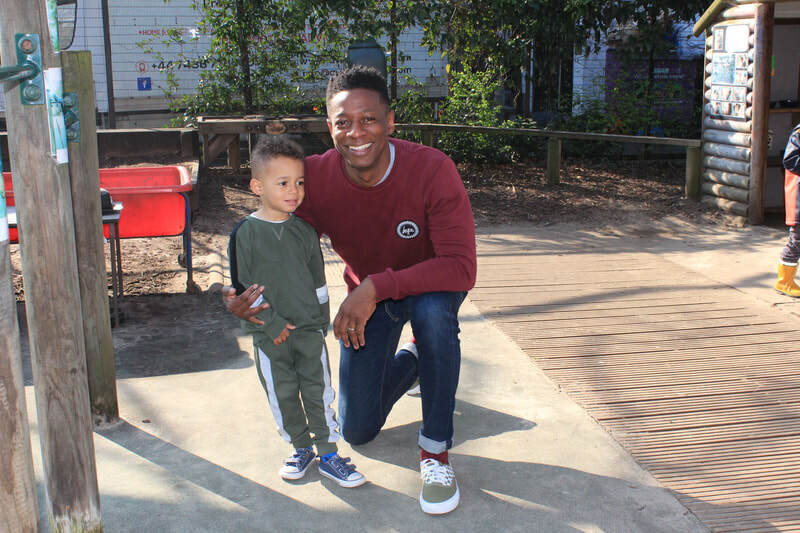 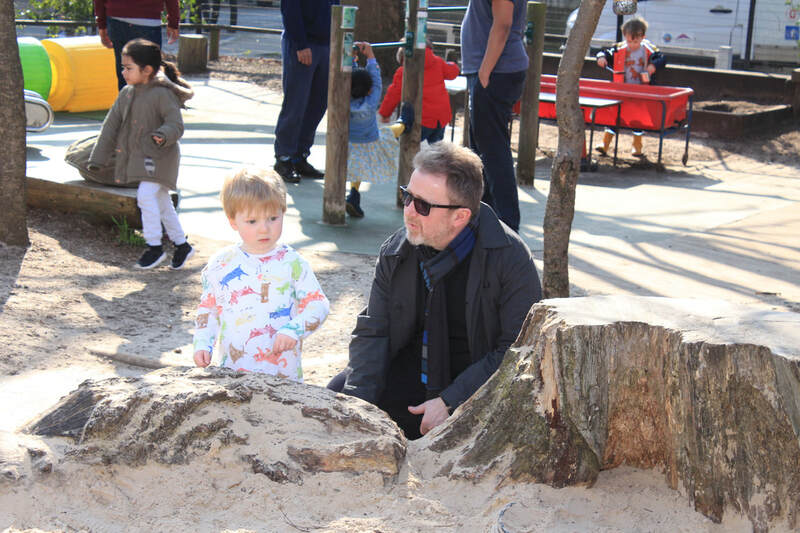 This morning we welcomed many dads, grandads, uncles, friends (and mums too) for our positive male role model stay and play. 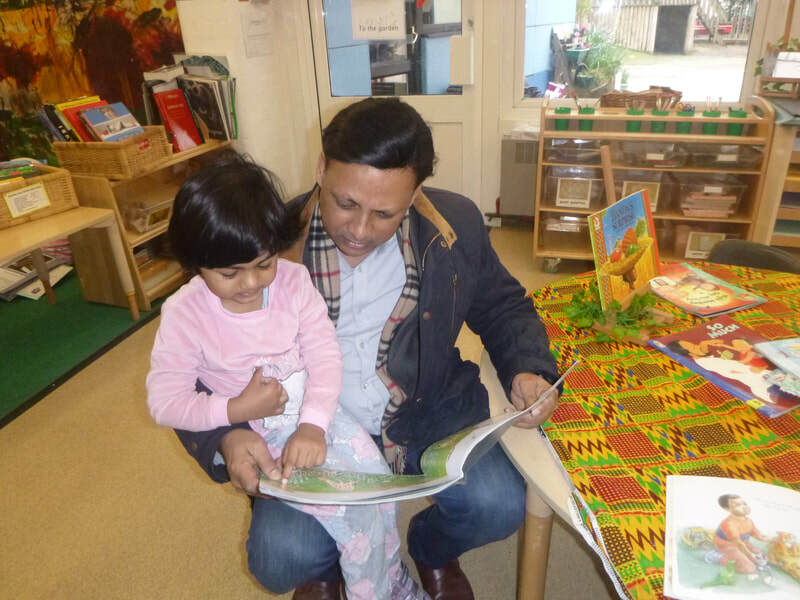 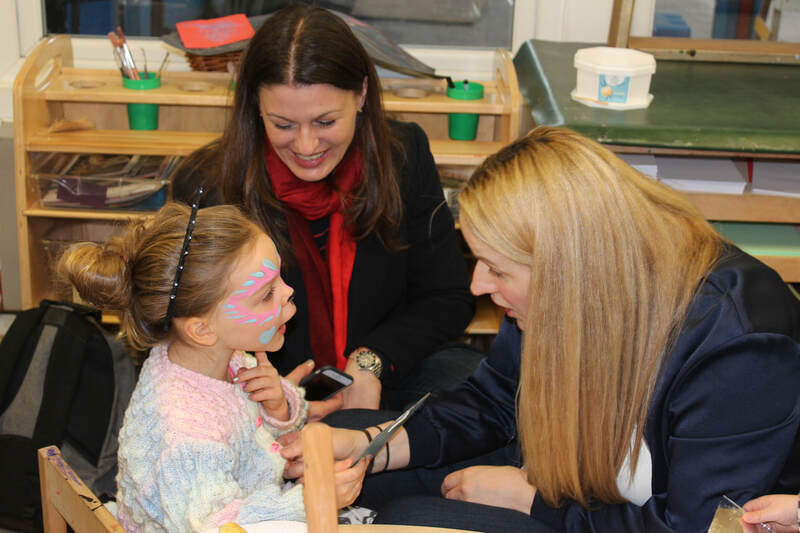 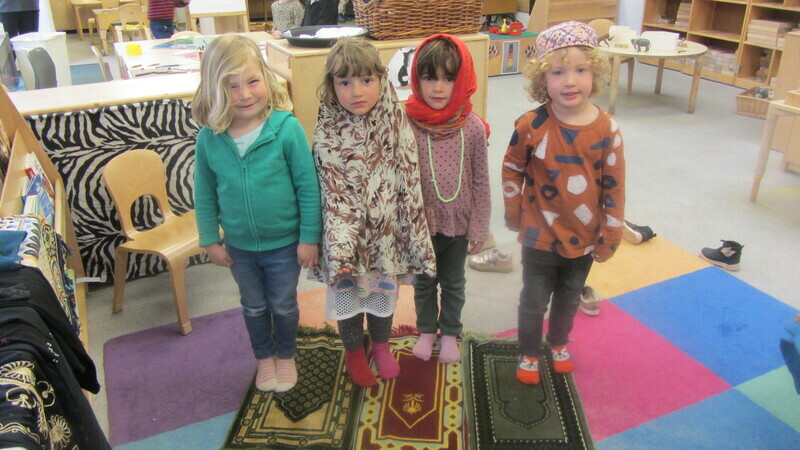 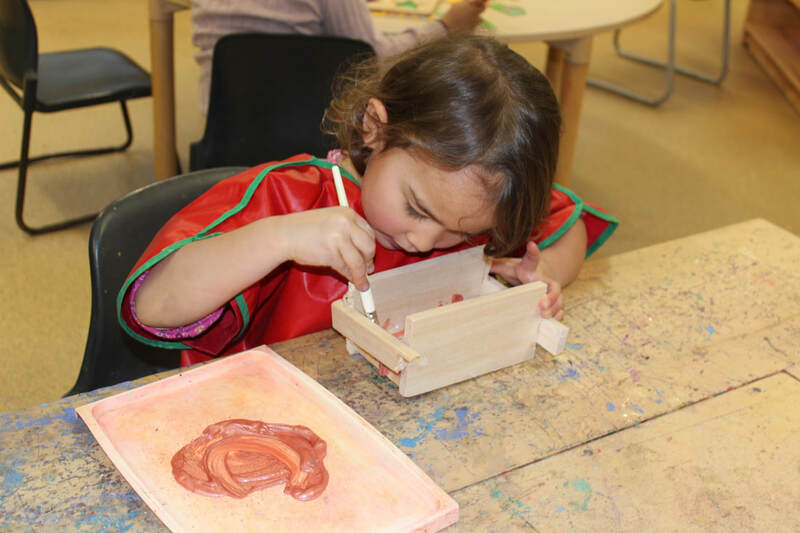 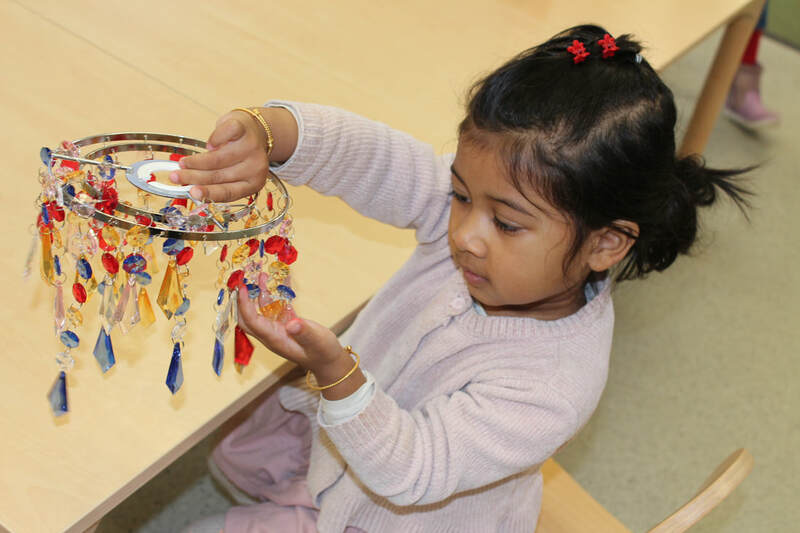 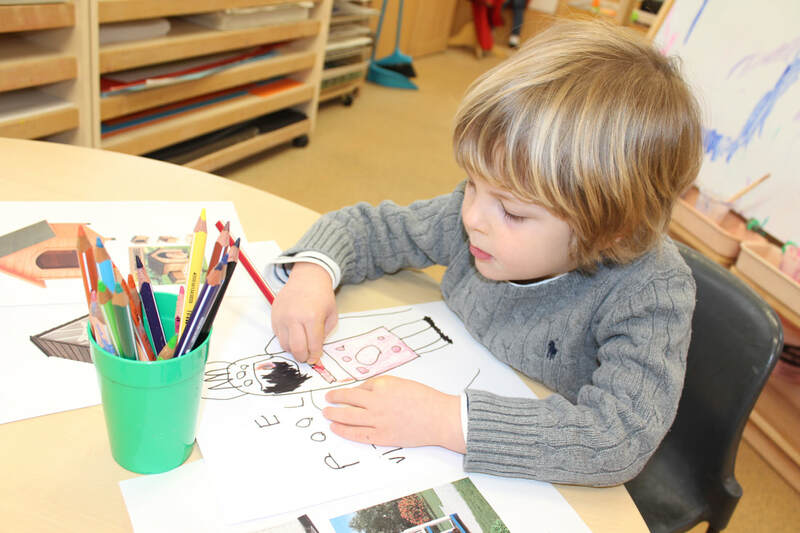 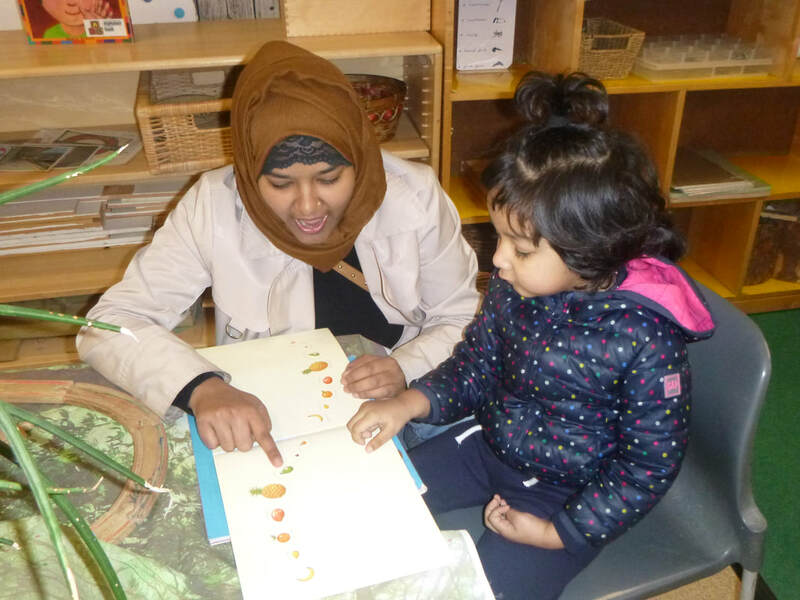 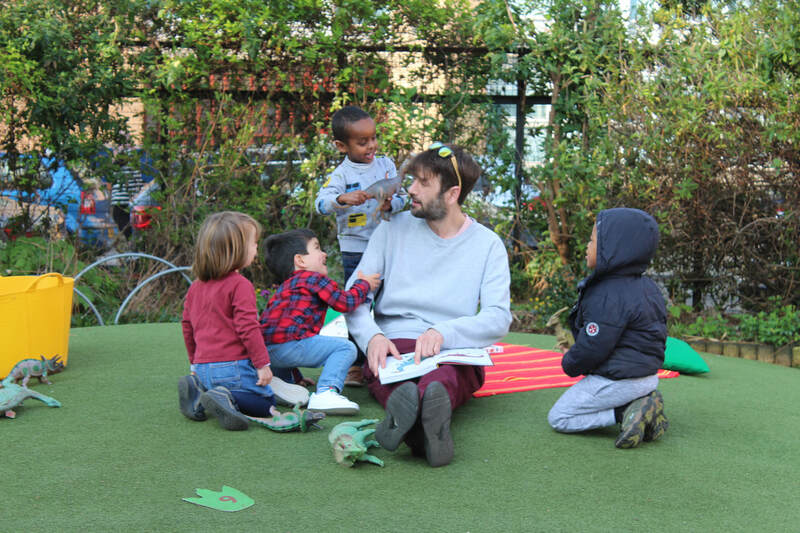 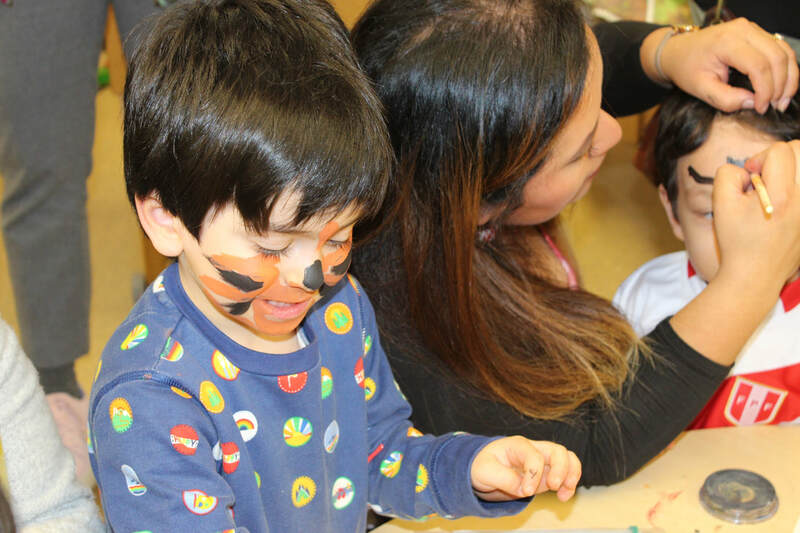 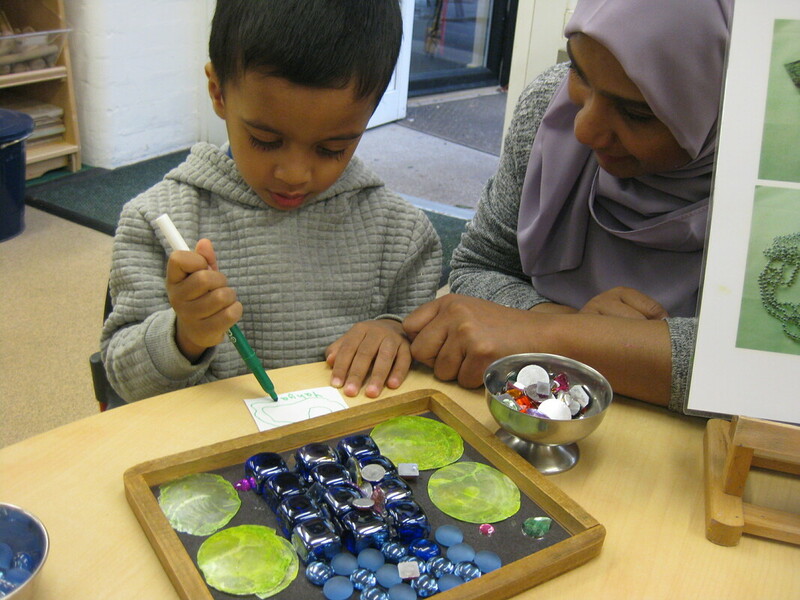 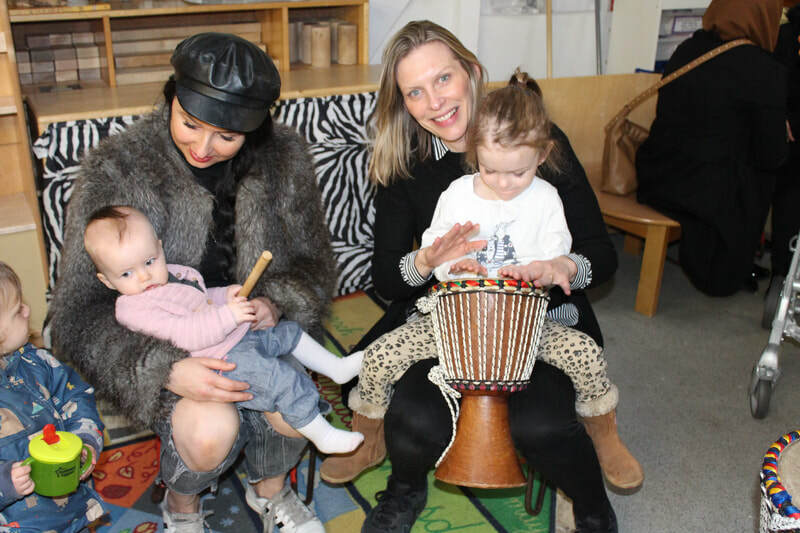 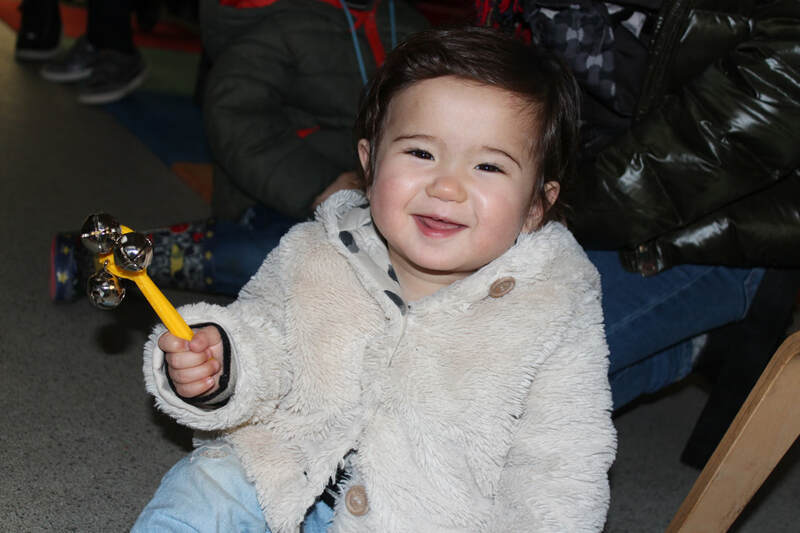 Families regularly join us in the nursery for workshops, play and to enjoy observing the children in their learning. 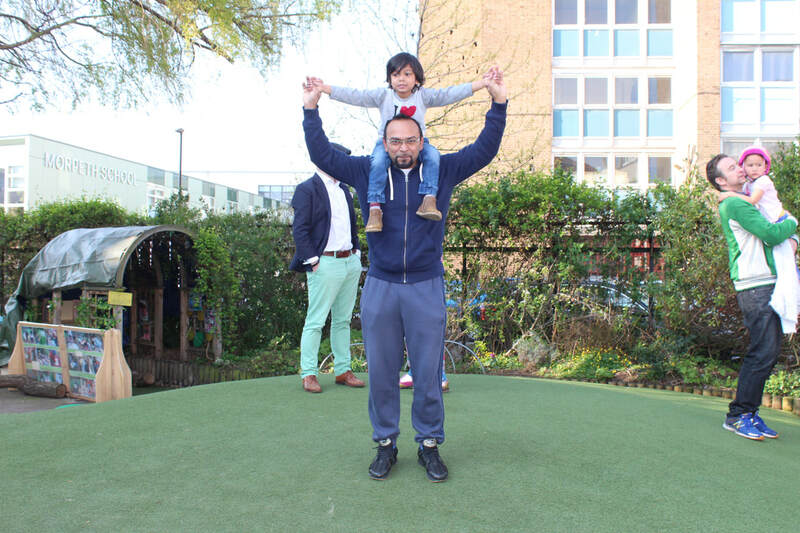 This morning we wanted to encourage men especially as they can appear to be underrepresented when standing at the garden gate. 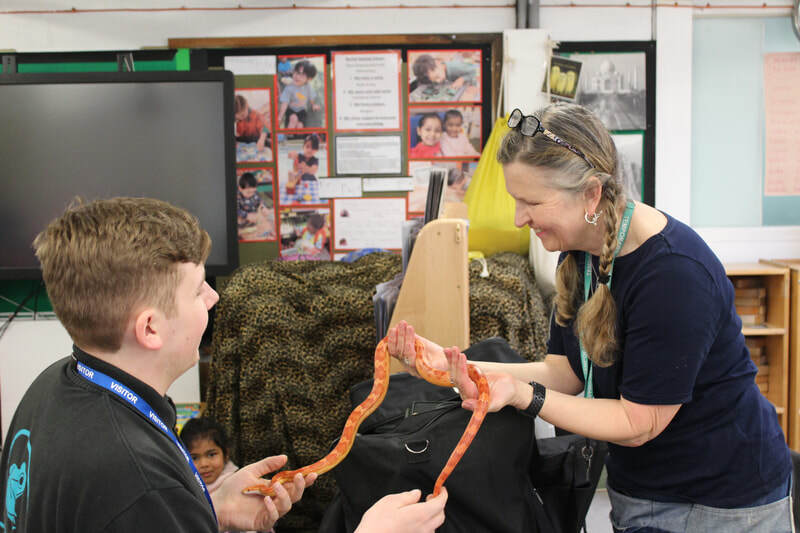 One of our Rachel Keeling Values is 'We have a voice' and we endeavour to ensure all members of our community are able to feel valued members of our school and face to face communication is an important part of that. 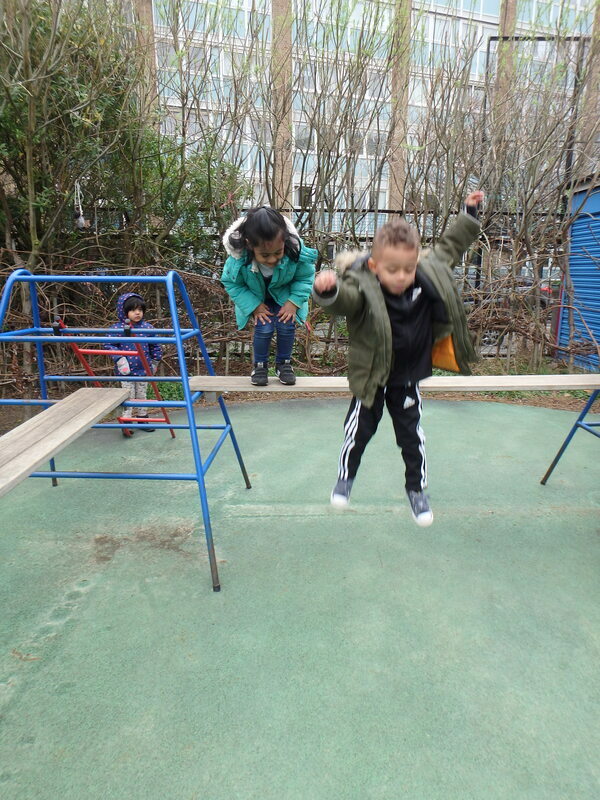 The sun shone and the morning was engaging with a real buzz of learning. 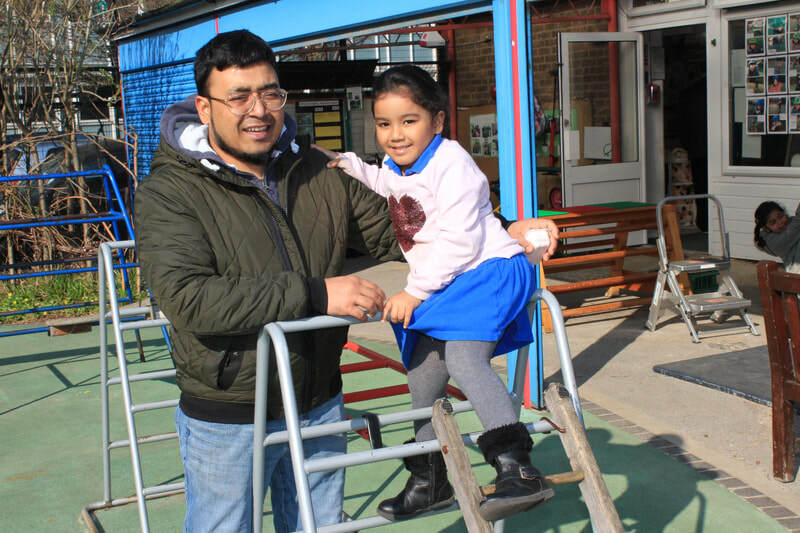 Thank you for your ongoing support to all our families. 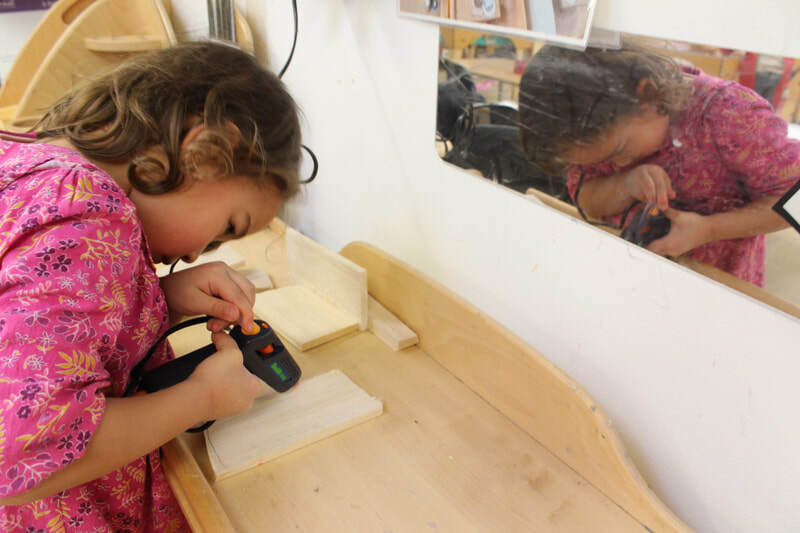 At Rachel Keeling we work in a process-led approach to learning. 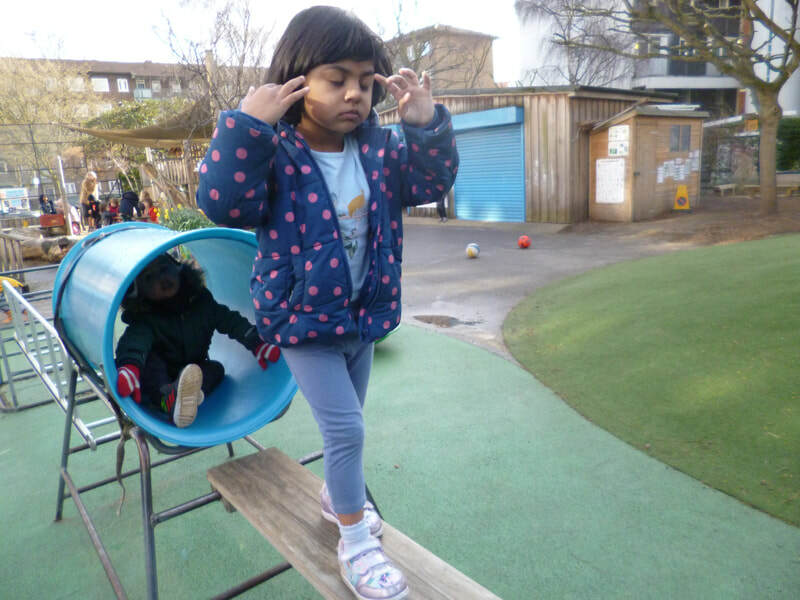 We focus on the journey and not the destination! 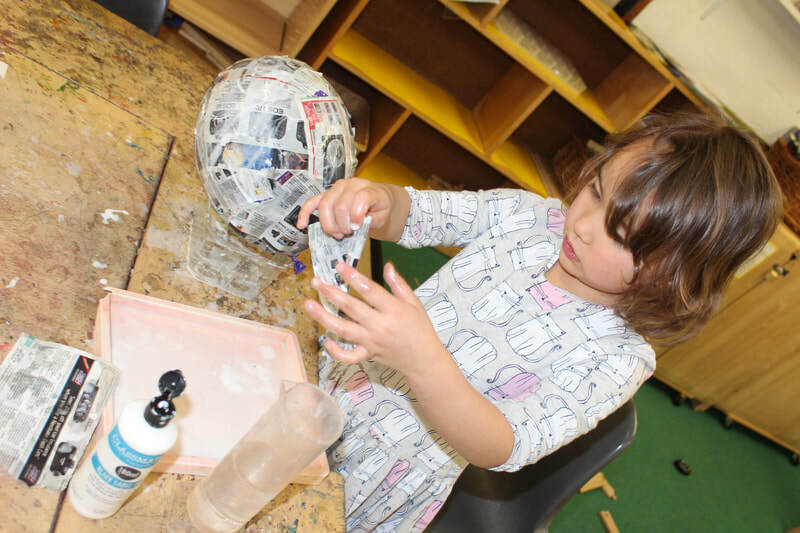 Over the past few weeks children have been given opportunities to engage in transient art. 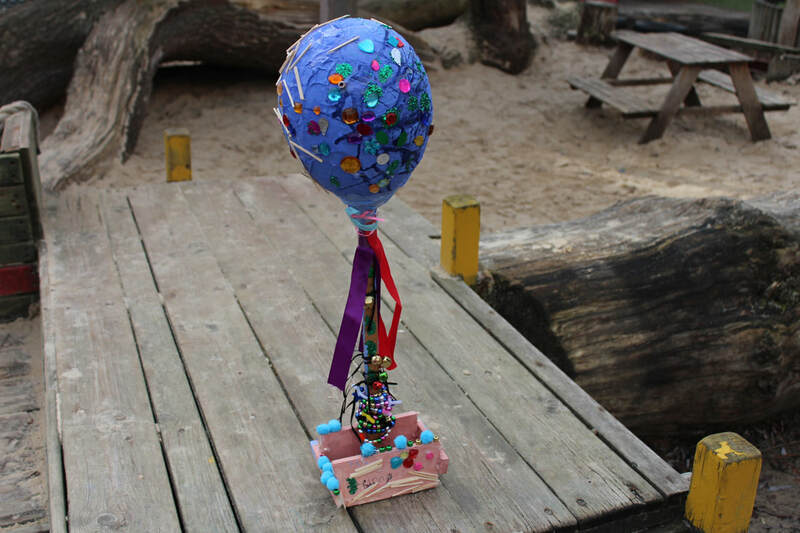 Transient art is non-permanent, constantly evolving and process orientated creativity in action. 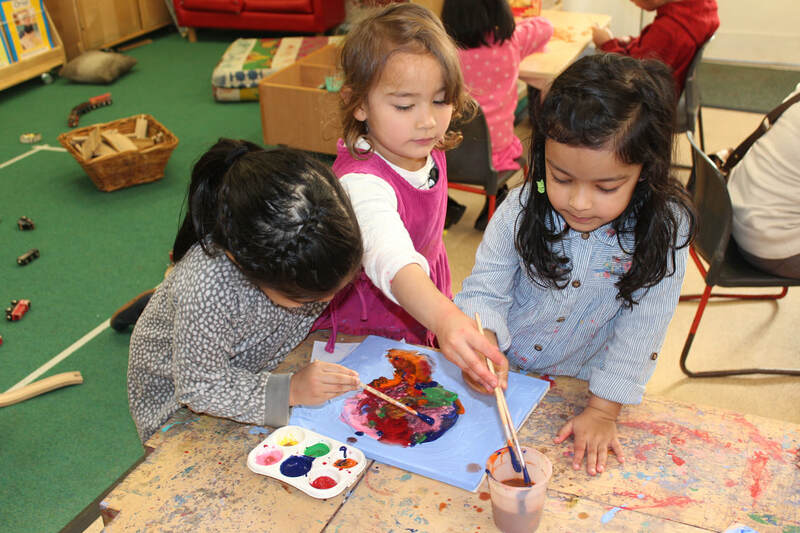 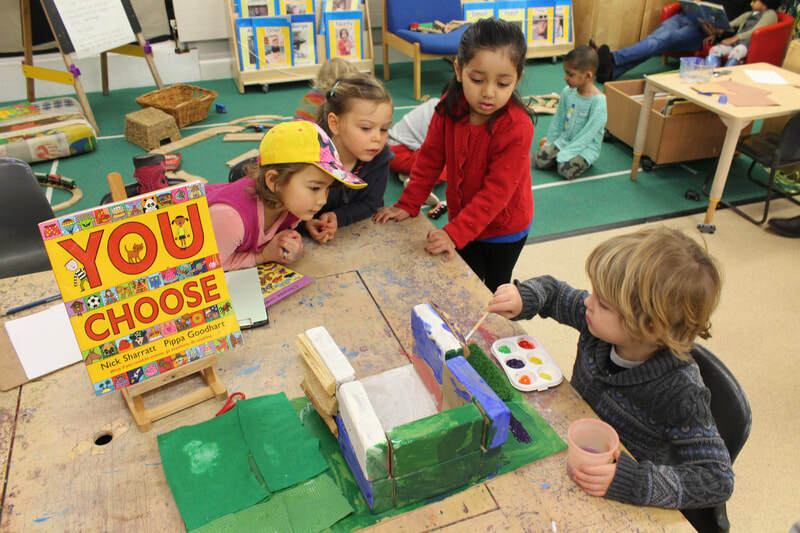 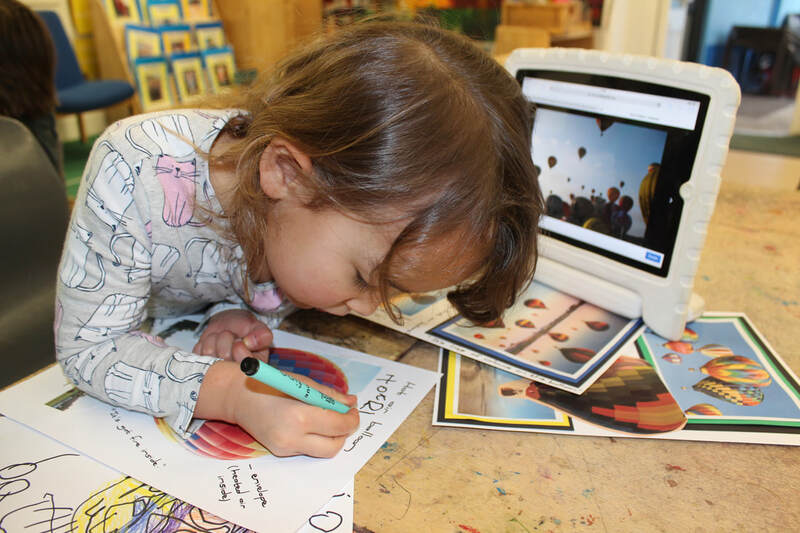 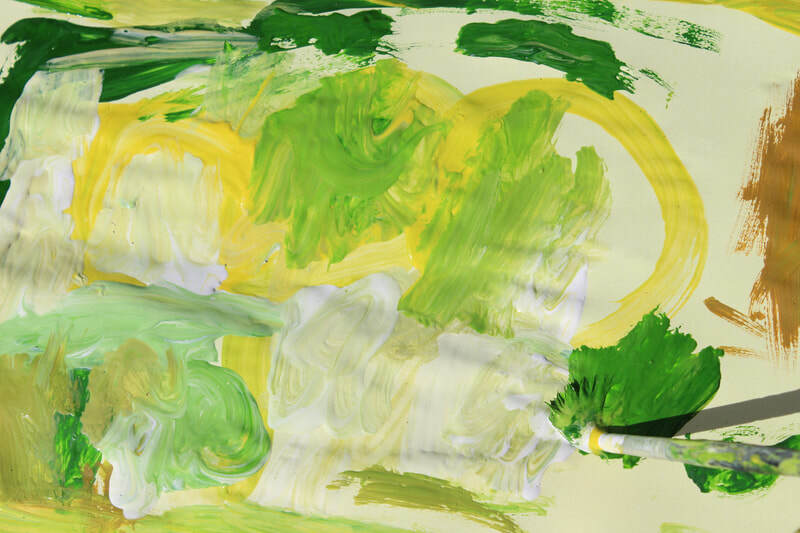 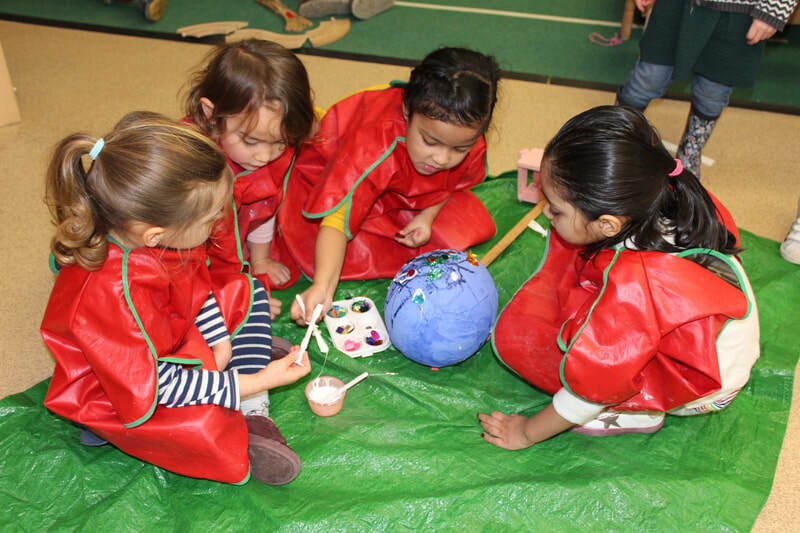 When children work on transient art projects they manipulate, explore and experiment as they work individually or collaboratively, on either large- or small- scale artworks. 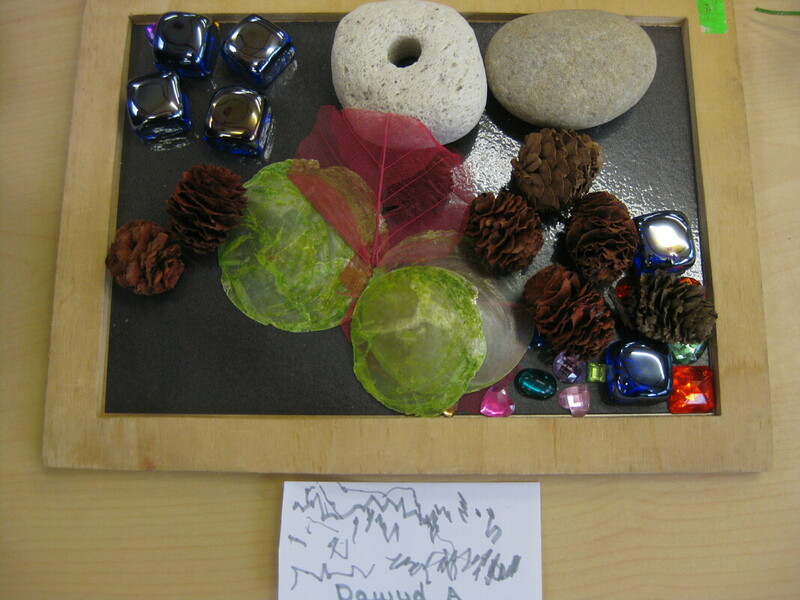 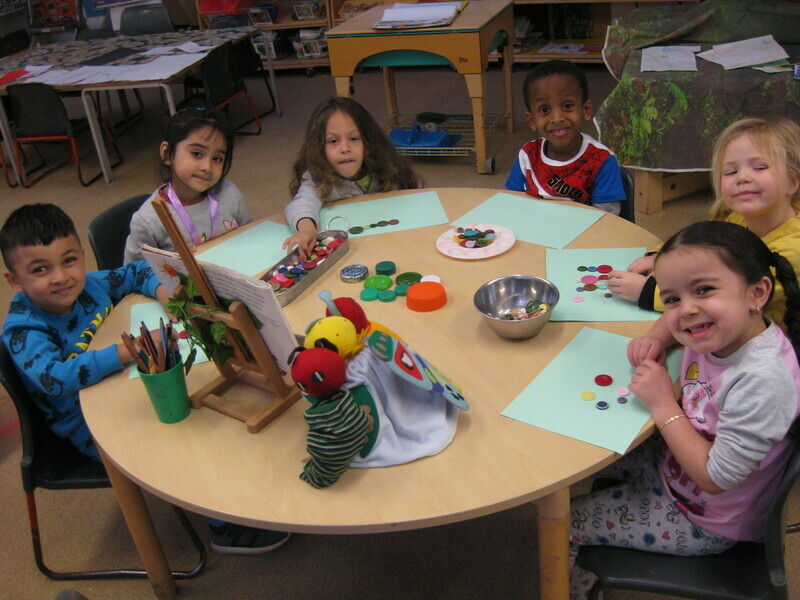 Children explored the resources, talking about them, handling them and arranging them. 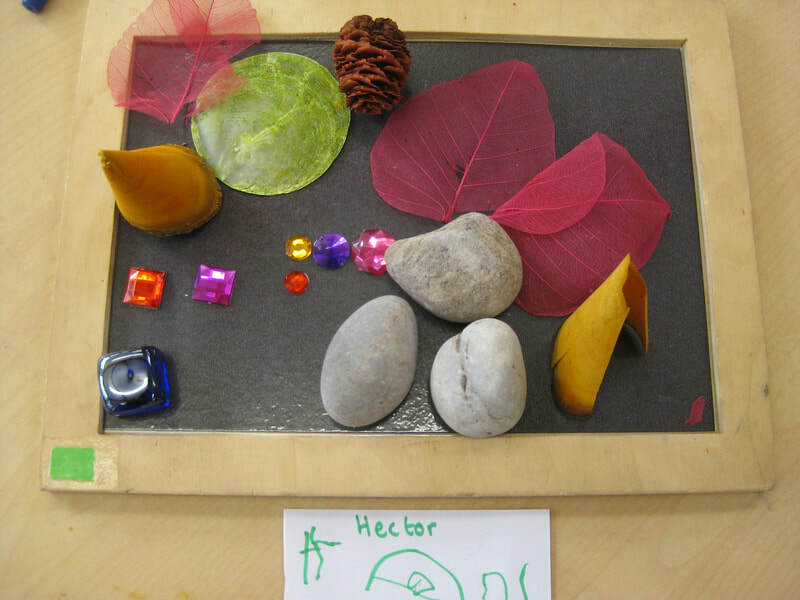 Reflective sessions like this encourage children to slow down, relax, share talk, make close observations and explore shape, pattern, texture and symmetry. 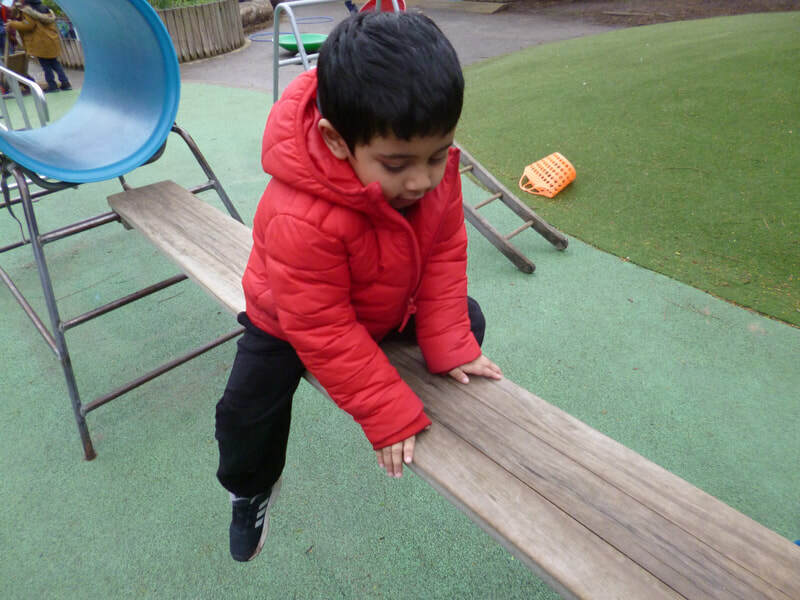 Children sustained concentration, working in pairs and individually. 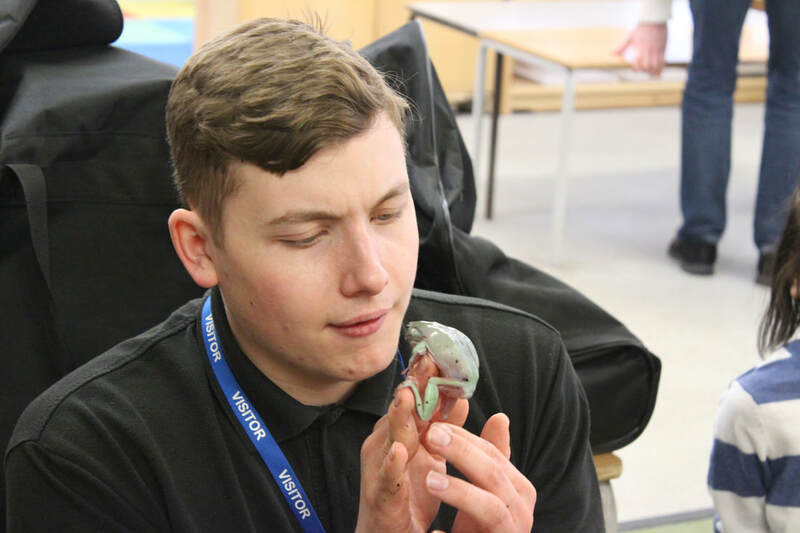 We think the learning outcomes and benefits to such an experience are incredible. 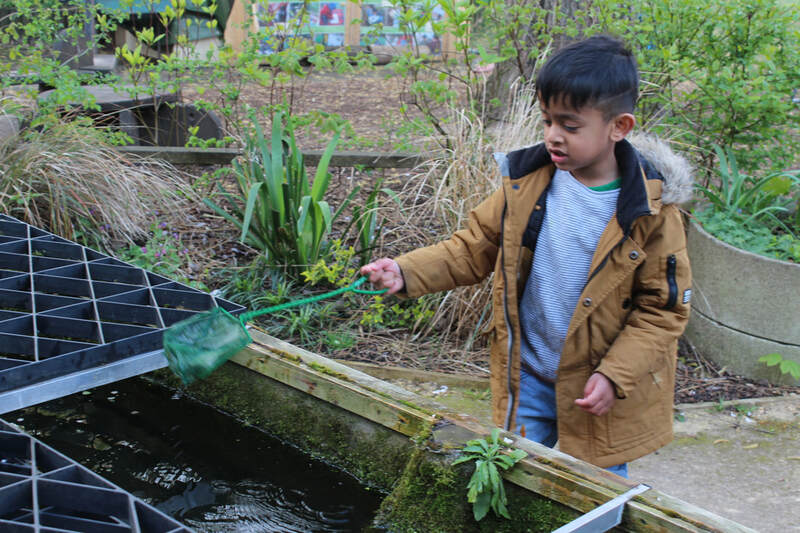 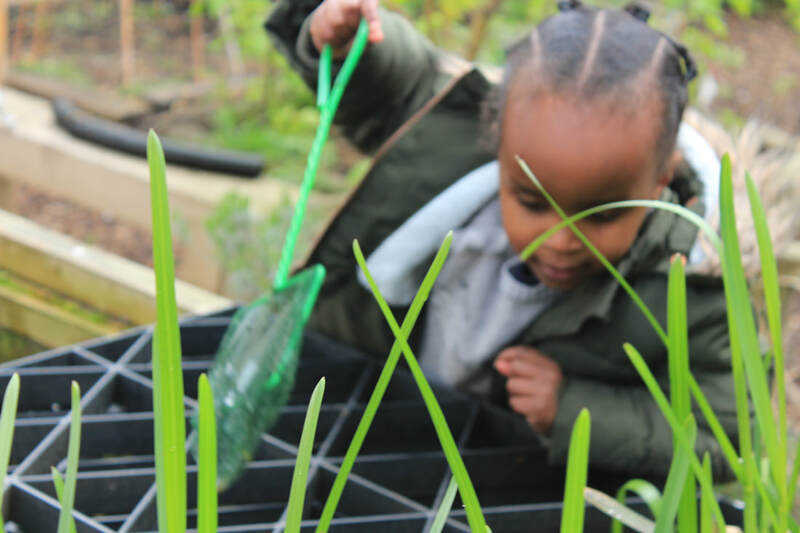 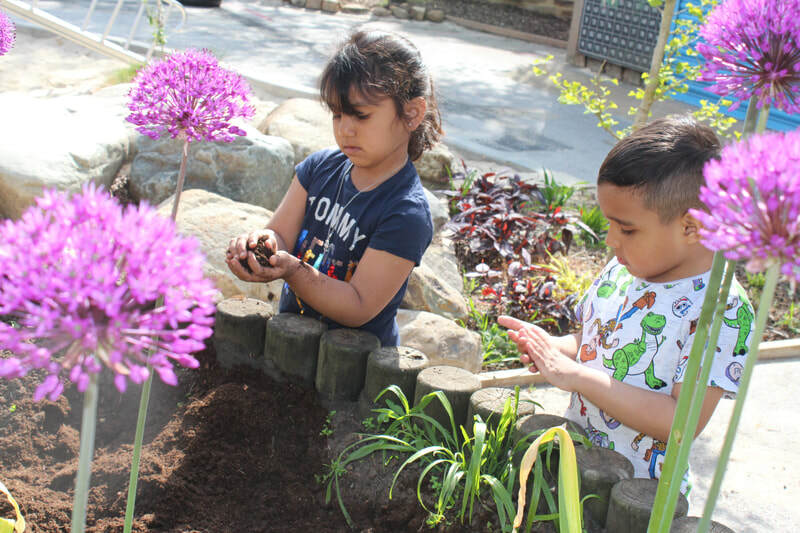 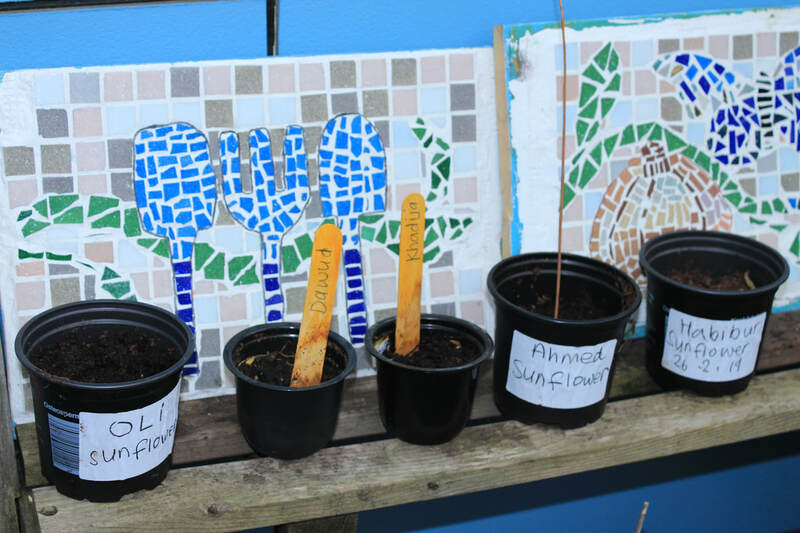 Children at Rachel Keeling Nursery School are really involved in the life of our school: they care for our environment, the garden, the aquarium, take responsibility for each other and themselves. 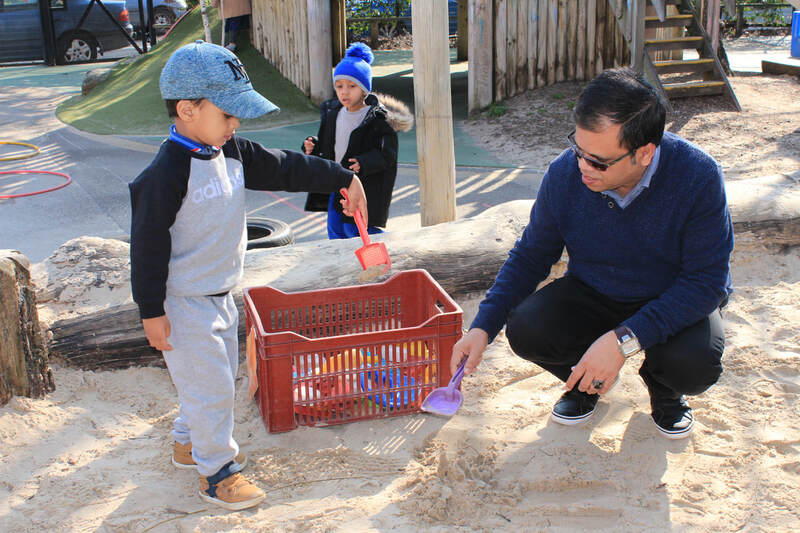 Staff will always make as many of the children's experiences meaningful and first hand, where possible. 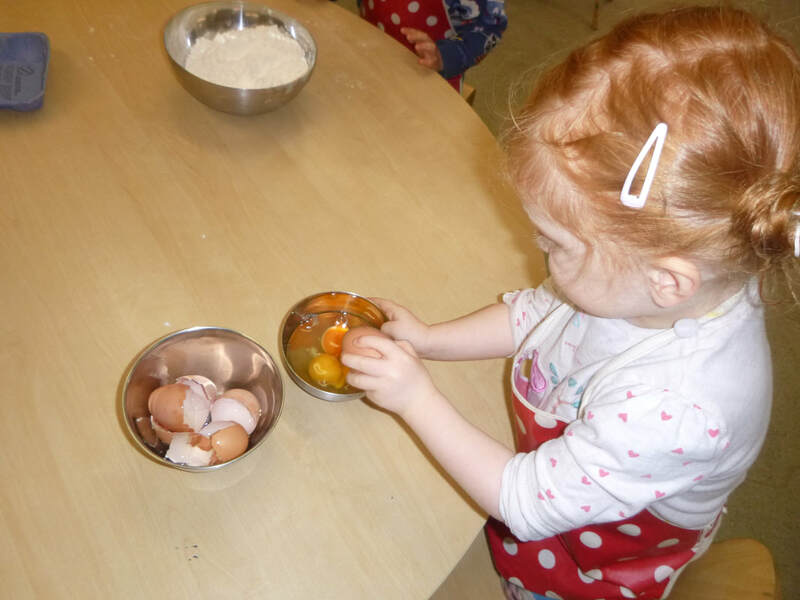 Regularly children will shop for the ingredients for our daily cooking experiences. 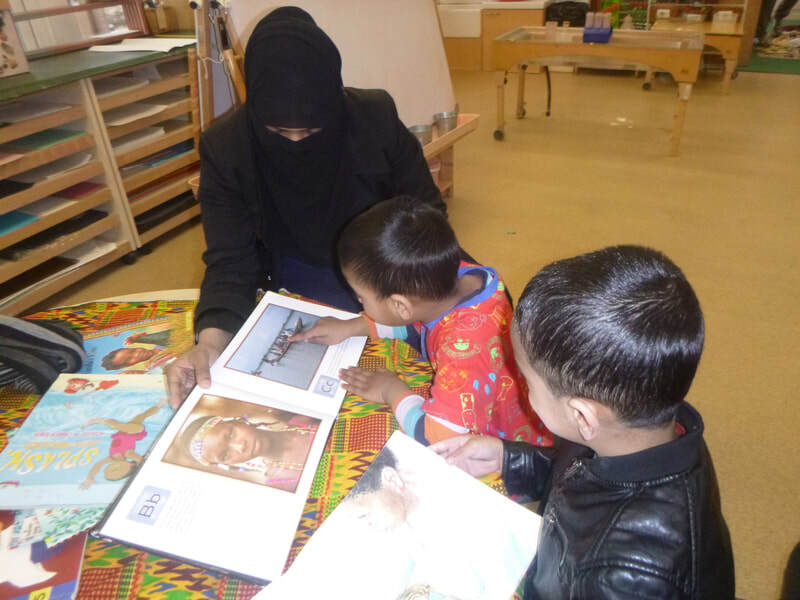 Last week children were making their own books and drawing pictures in them, ascribing meaning to their marks as they did. 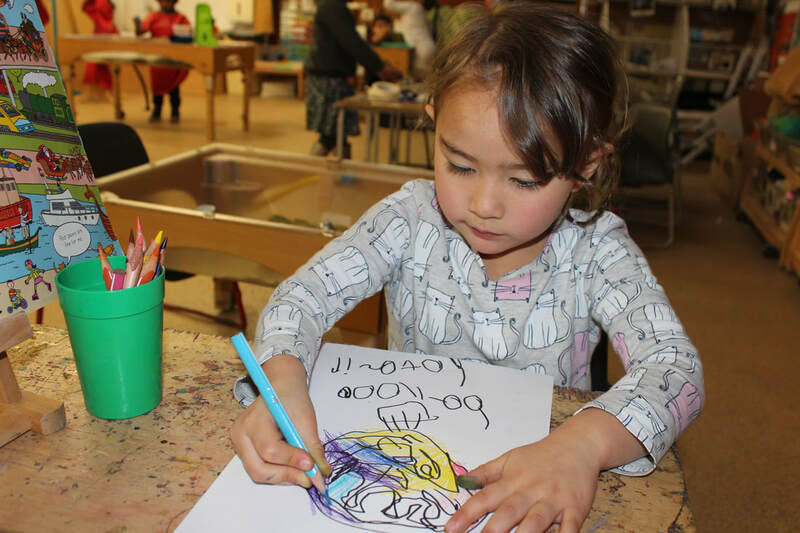 One child, who is part Italian shared her drawing where she talked about pasta she likes: this sparked much conversation about pasta. 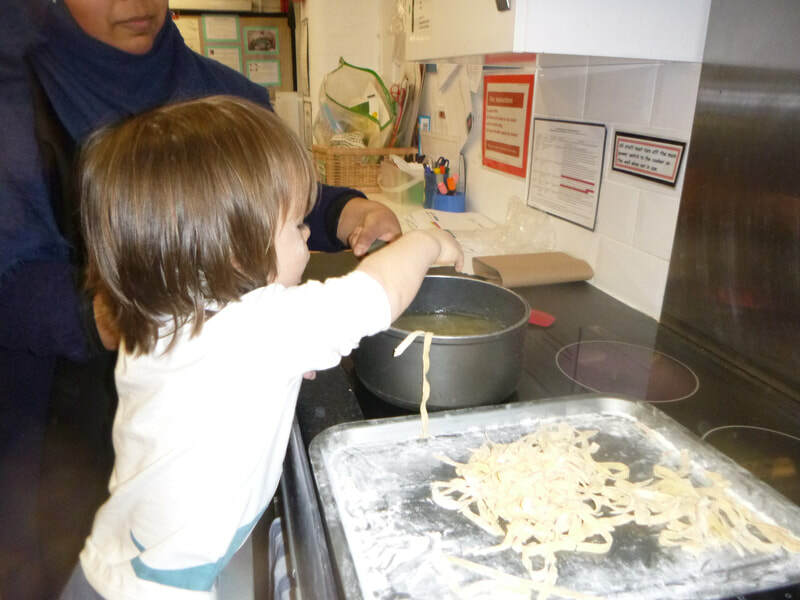 The children demonstrated they already knew lots of information and had formed opinions on pasta. 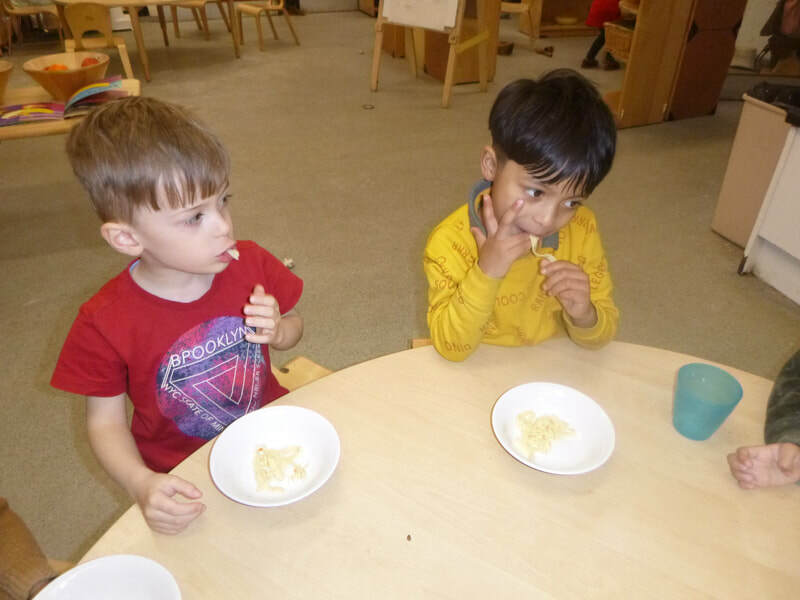 They decided to cook some pasta to share. 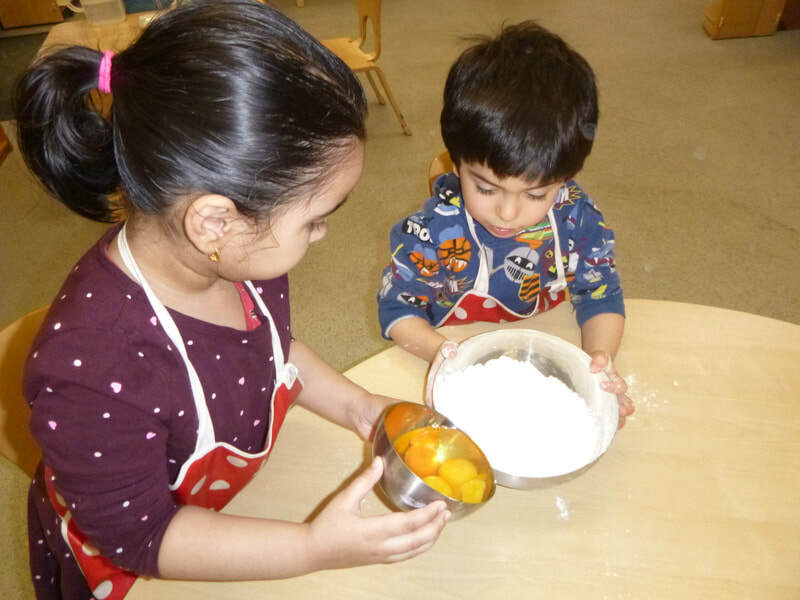 Children researched the ingredients needs, made their lists and estimated how much money they might need to buy the ingredients. 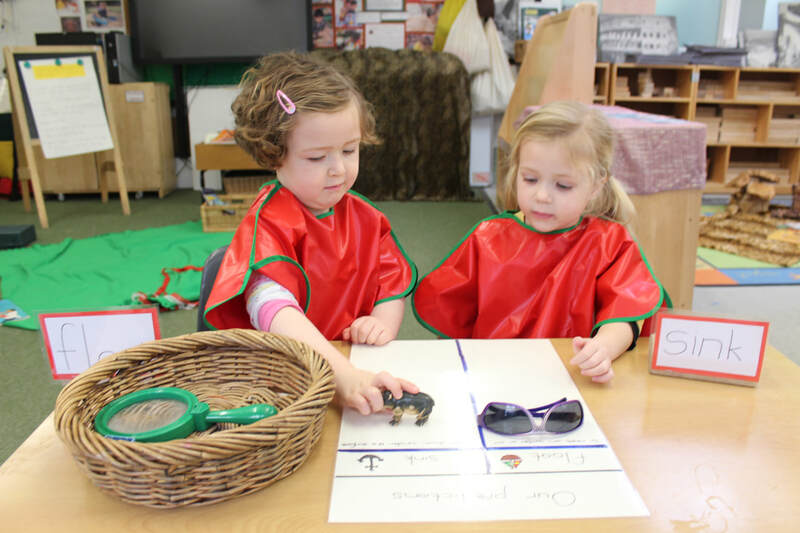 They then went to the office to collect their money and went out shopping. 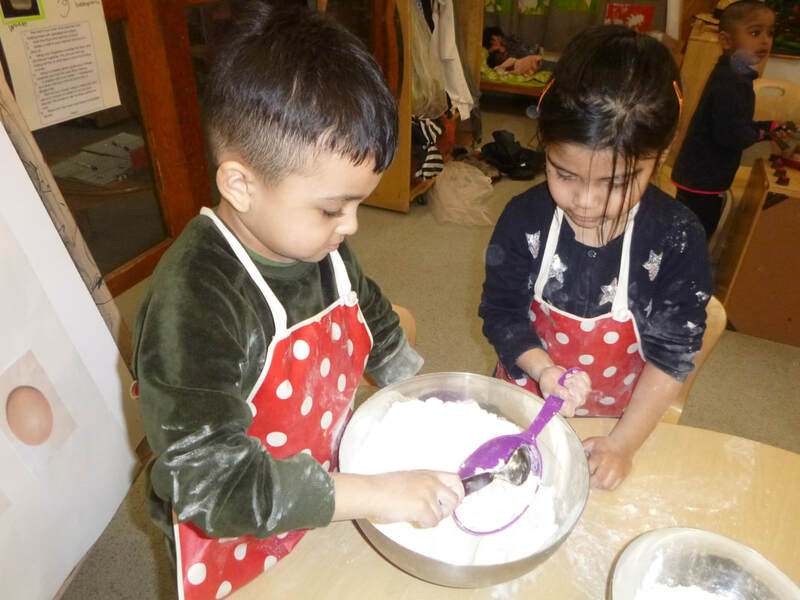 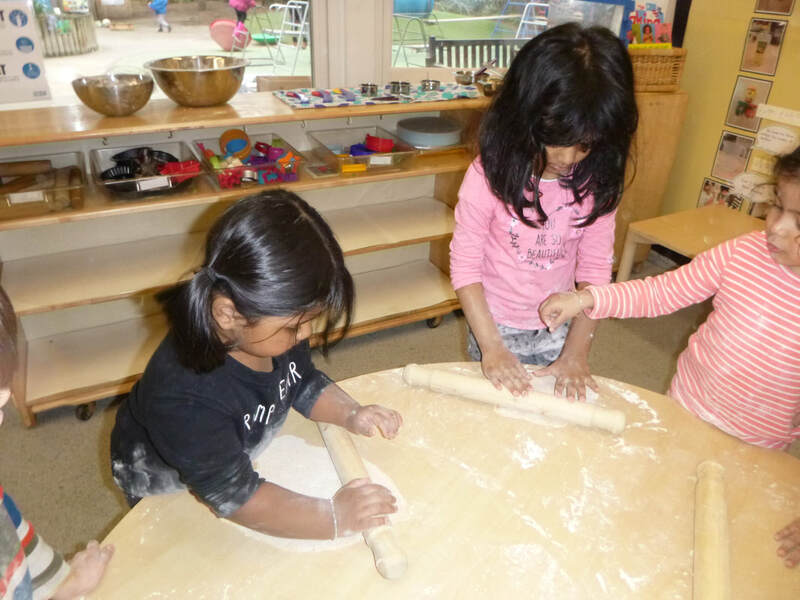 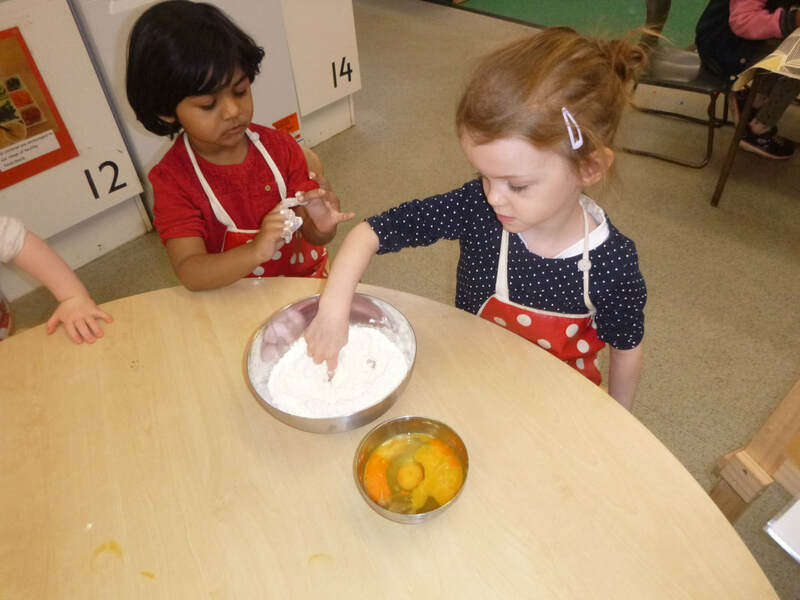 Linguine was the pasta of choice during the first week: children followed the recipe, cooperated and took turns in skillfully measuring and mixing the ingredients before sustaining for quite for time kneading the dough. 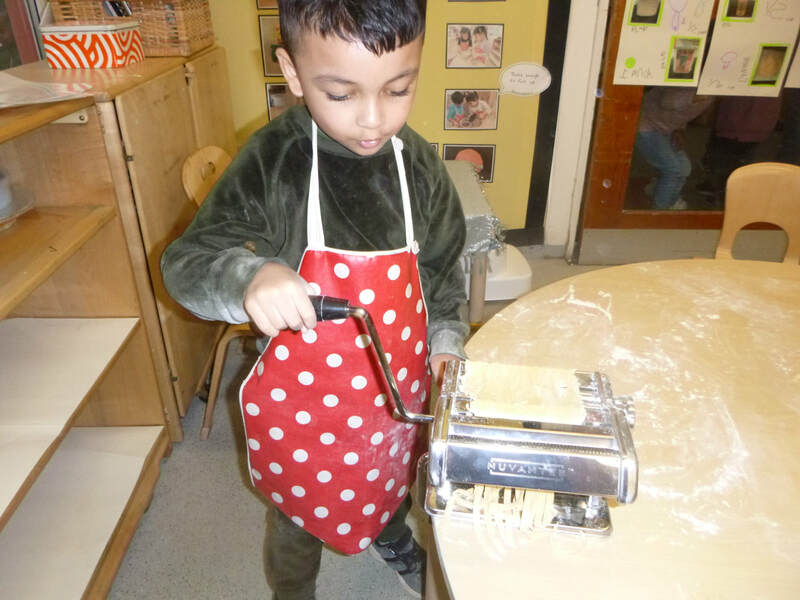 Children were introduced to the pasta machine and worked hard to turn the handle and extrude the pasta. Many children showed they have skills using one handed tools and their dexterity was good. 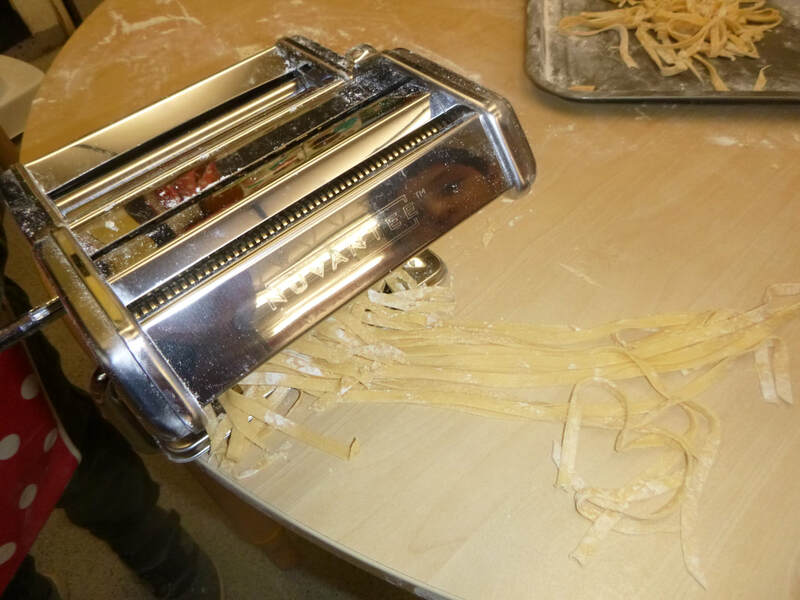 Finally they cooked the tagliatelle in some vegetable stock and enjoyed it together. 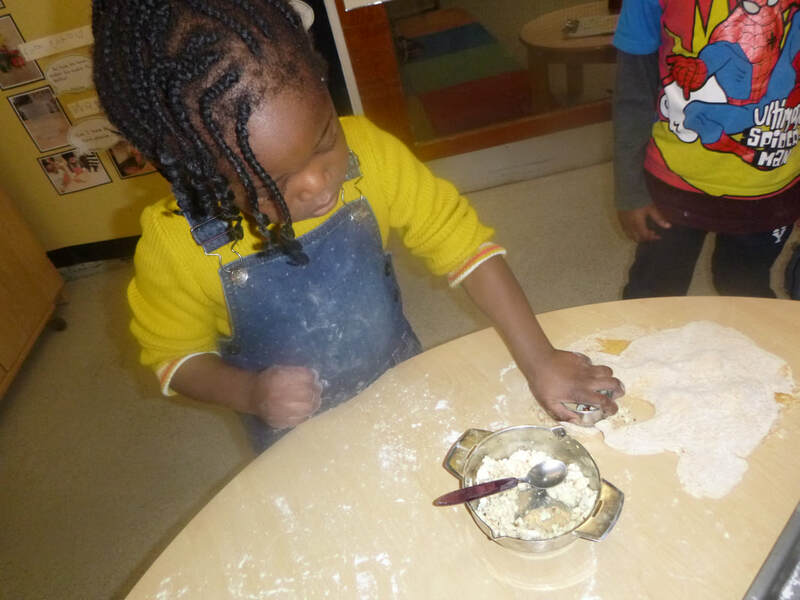 This week, the focus was ravioli: children created their pasta dough (after shopping for it) and cut out the ravioli shapes. They created the ricotta, sundried tomato and oregano filling, Like chefs, the children were encouraged to smell, handle and taste the ingredients first. 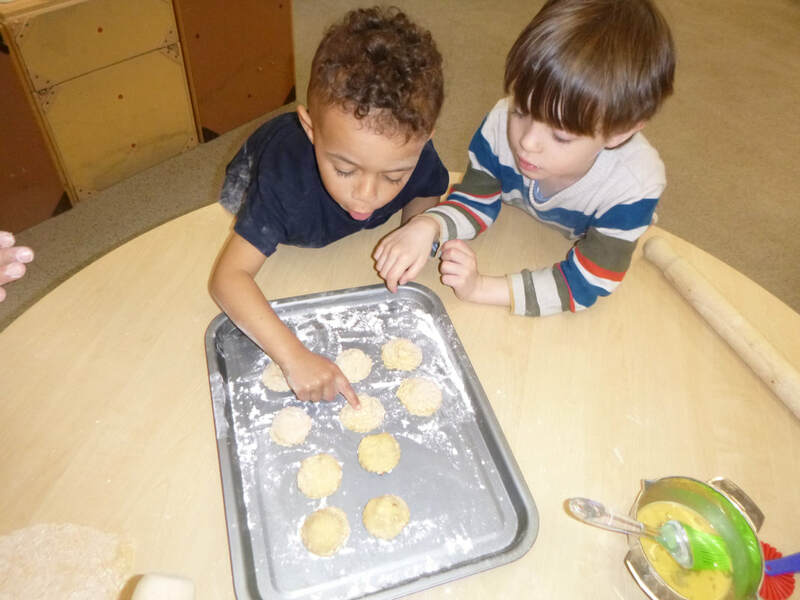 They made their ravioli packages and cooked them before sharing them with a large group! 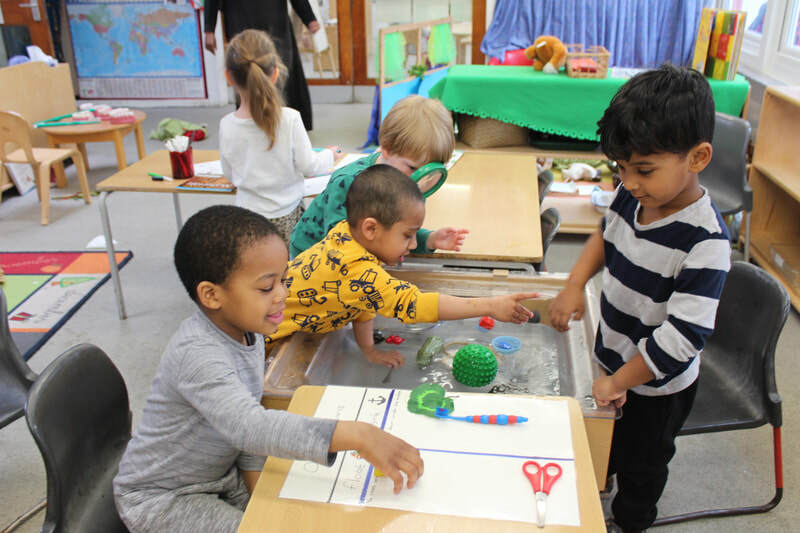 Over the past three weeks, children have been exploring different scientific concepts: floating and sinking, density and chemical reactions. 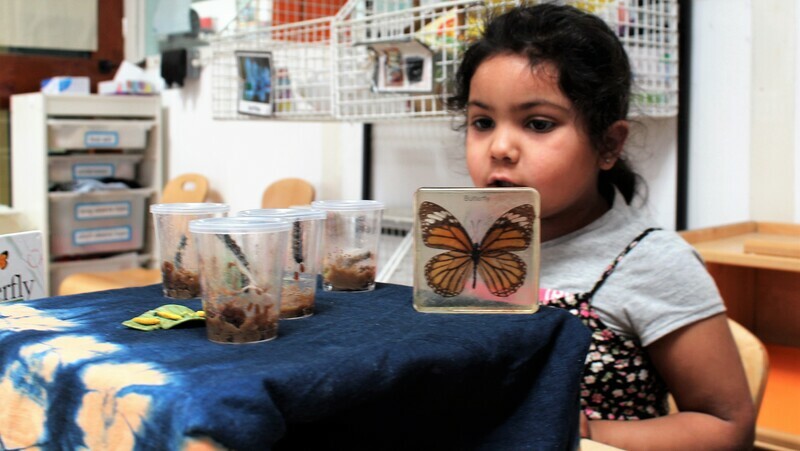 One of our baserooms was transformed into a science laboratory. 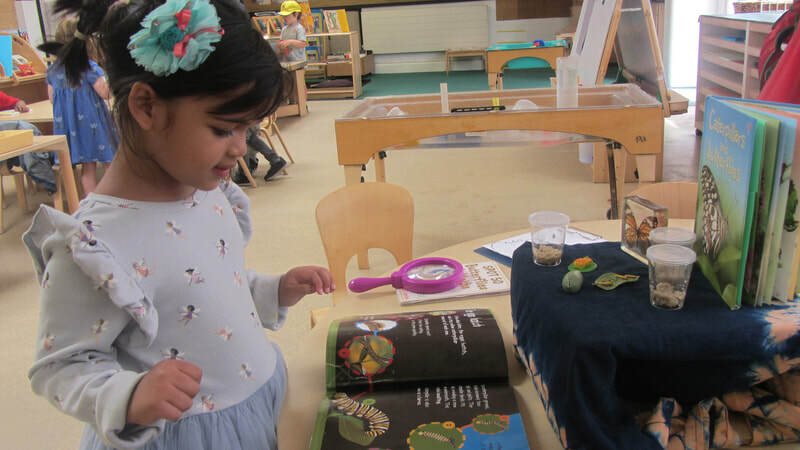 Books around science and famous scientists were on offer. 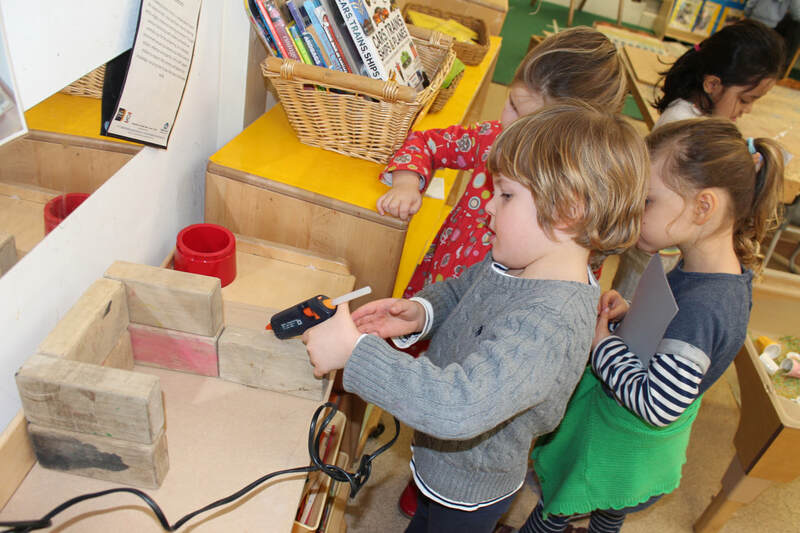 A dark space was created to explore light and dark using torches. 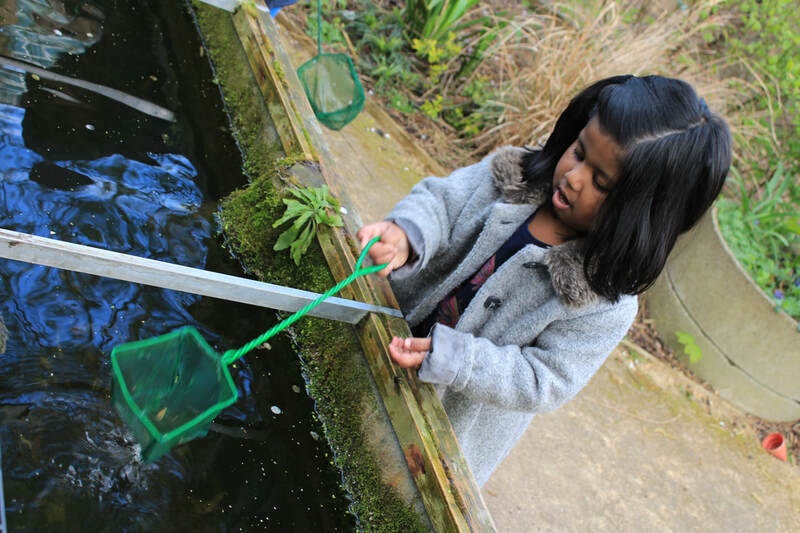 Firstly children were encouraged to share what they knew about floating and sinking. 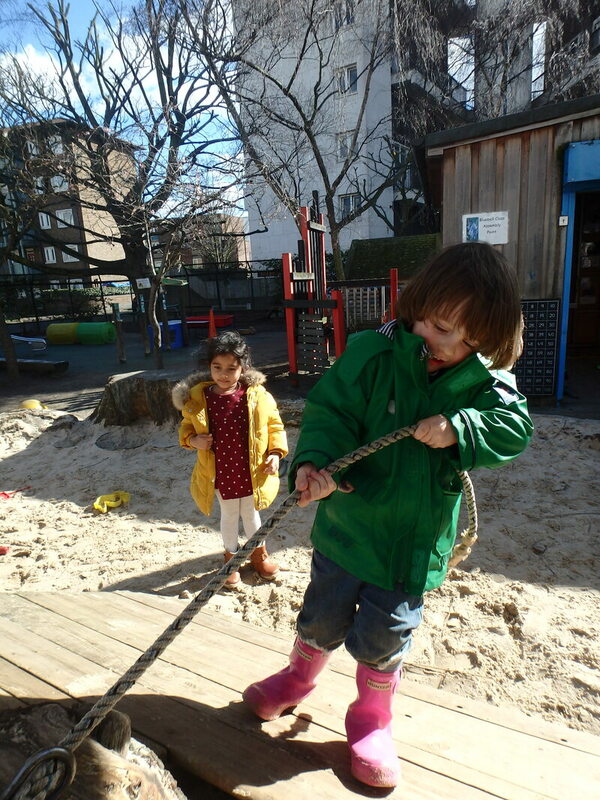 they handled a range of objects and predicted whether they thought they would float and sink. 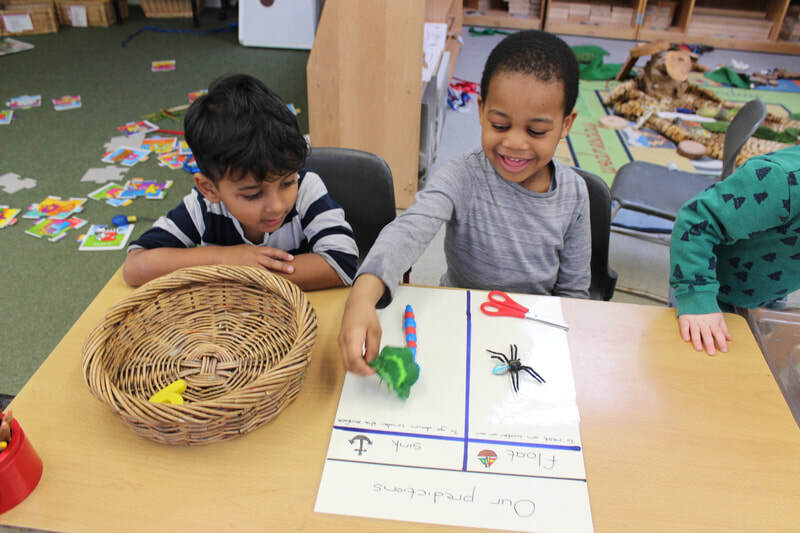 They worked in small groups to share their ideas. 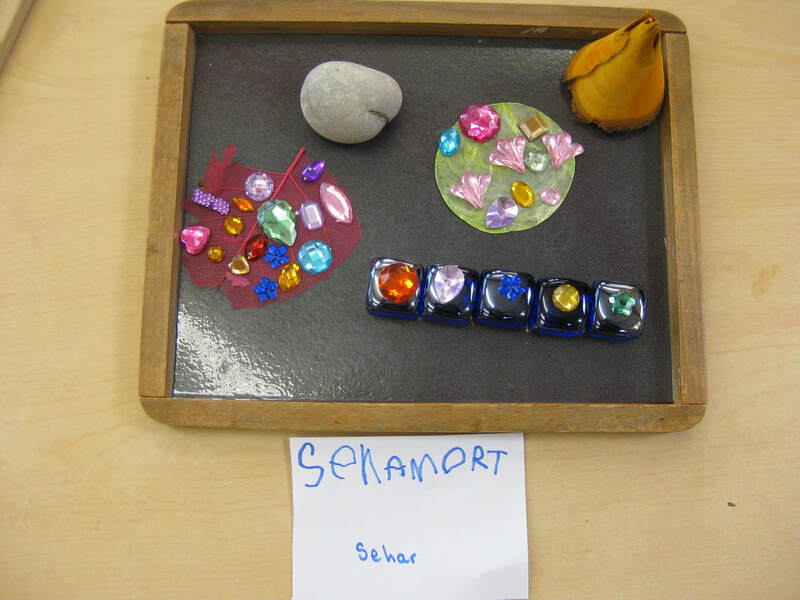 Then they tested the objects and recorded the results. 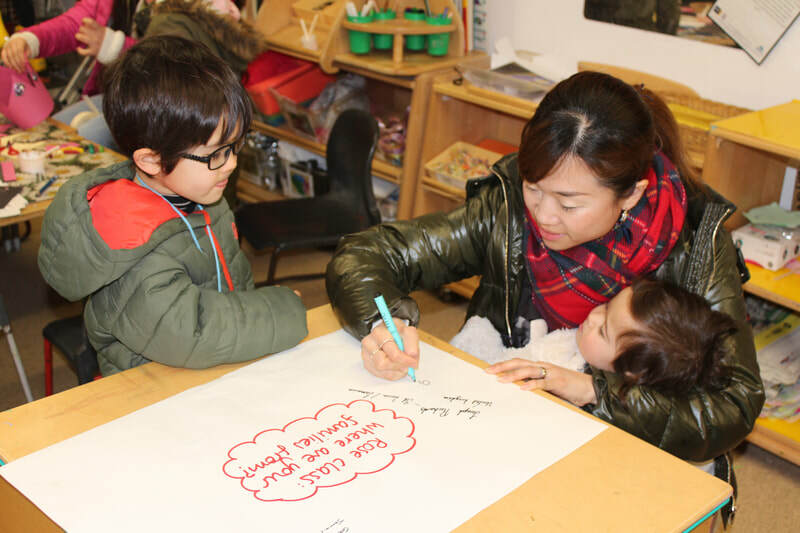 Children were very confident to share their ideas and hypothesise why they got the results they did. 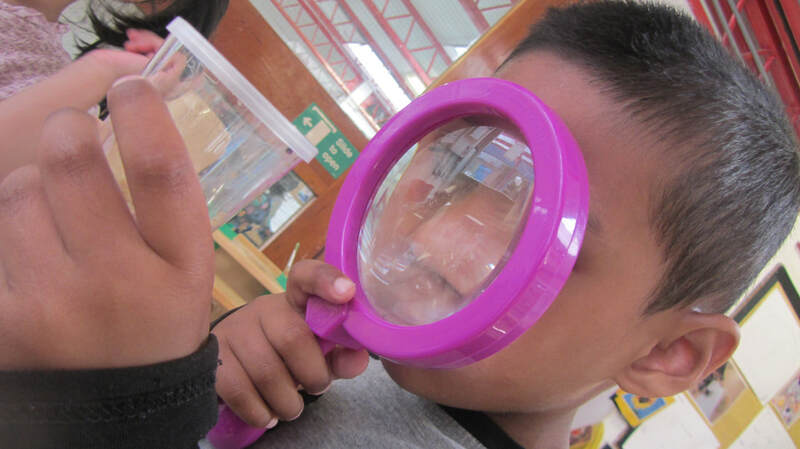 Next they investigated volcanoes: again, sharing their knowledge and thoughts and using books and images to inspire them. 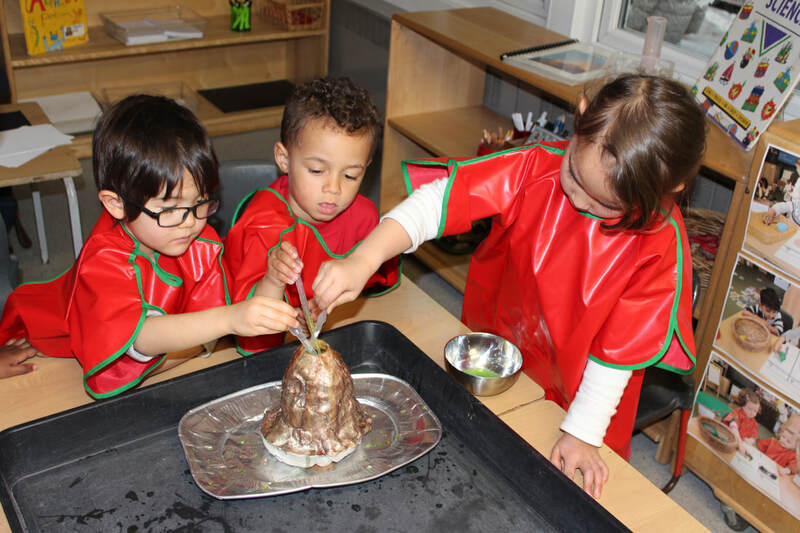 They created a volcano and set about using chemicals to create a reaction. 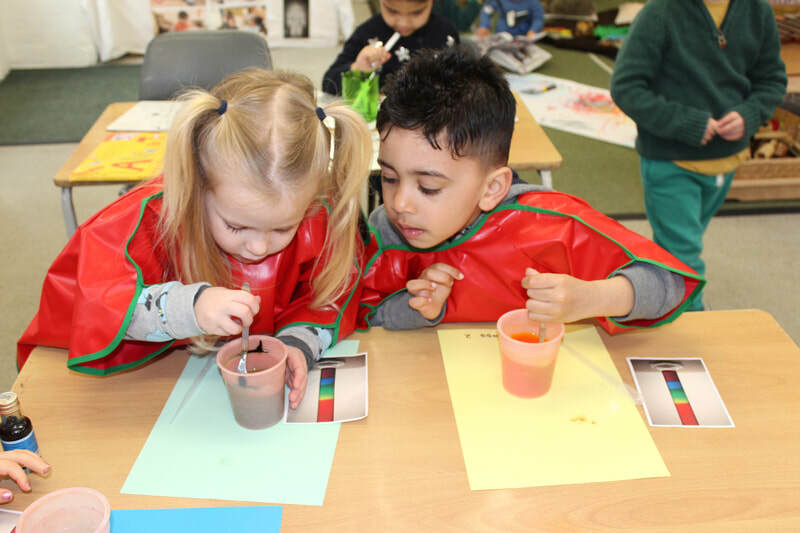 It was very exciting when the eruption occurred and children used language to describe the reaction. 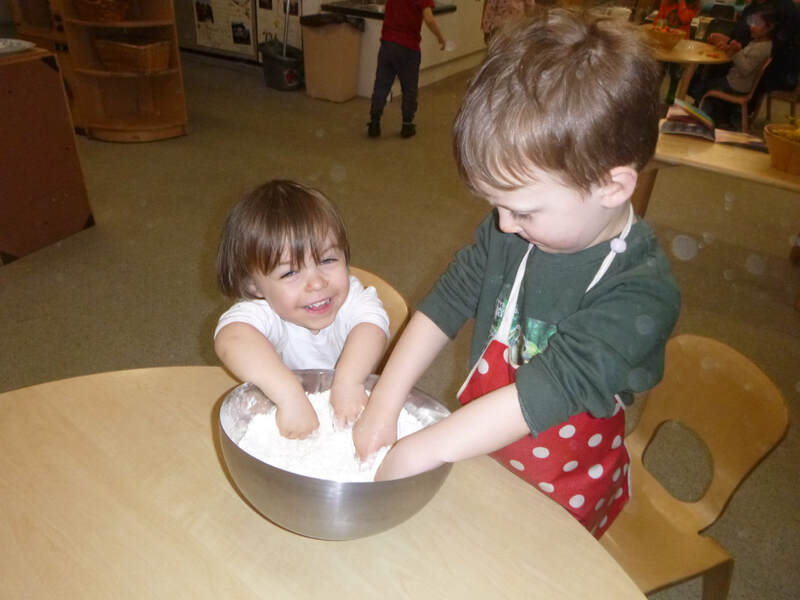 "It flowed everywhere" and "It smelt quite a lot". 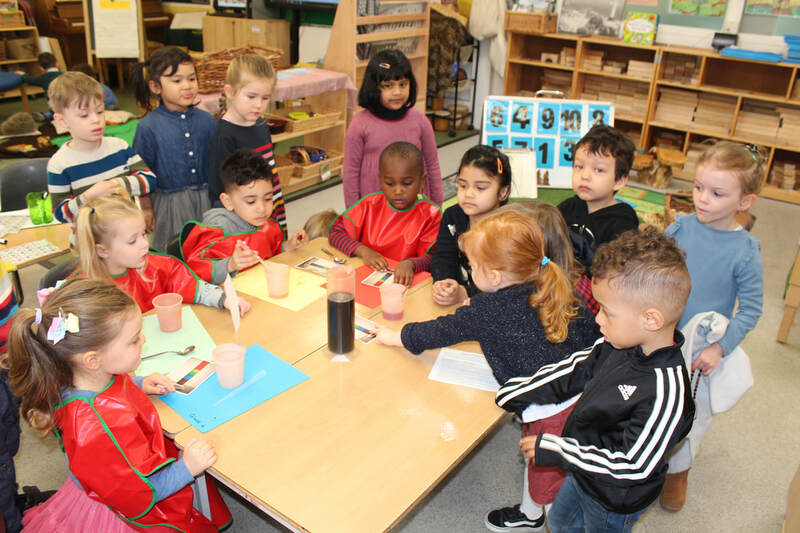 Finally density was explored with different "liquids" with food colouring being used to create layer of colour in a tube. 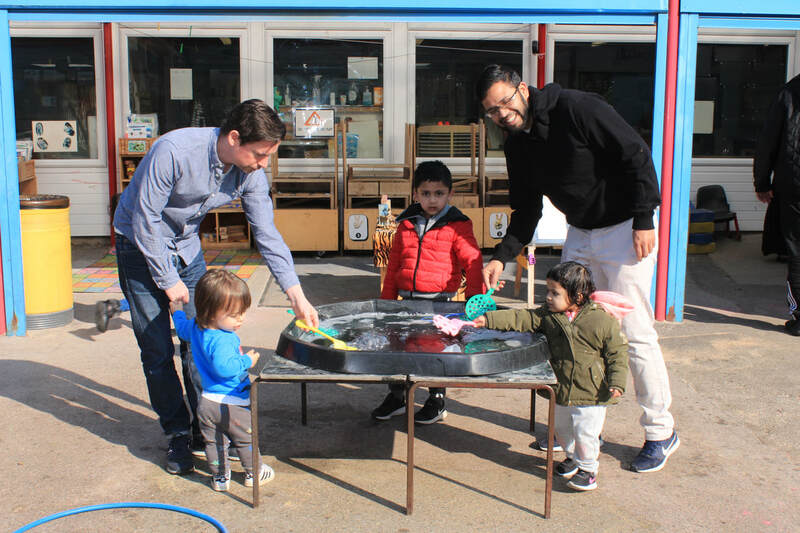 This was not a success and some children ended up with a black mixture rather than the rainbow we had predicted! 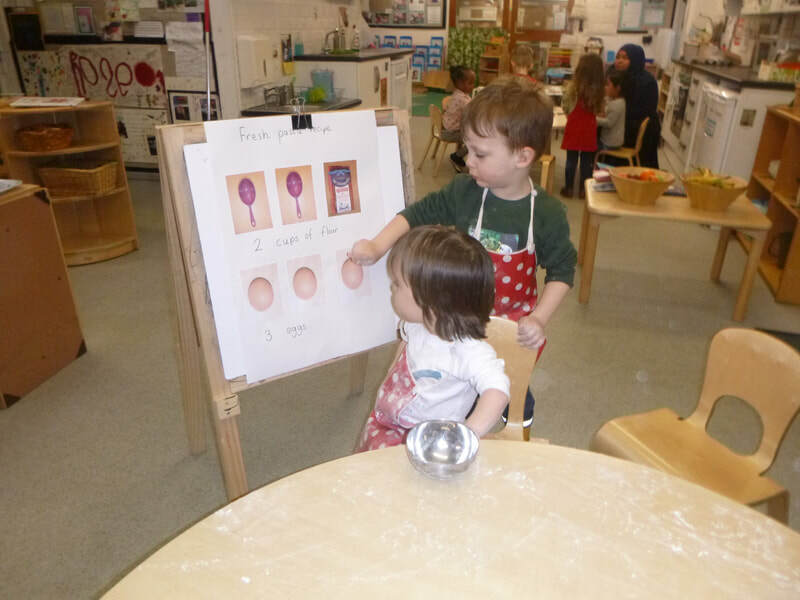 However, the subsequent research and discussion was very valuable and children repeated the experiment with more success. 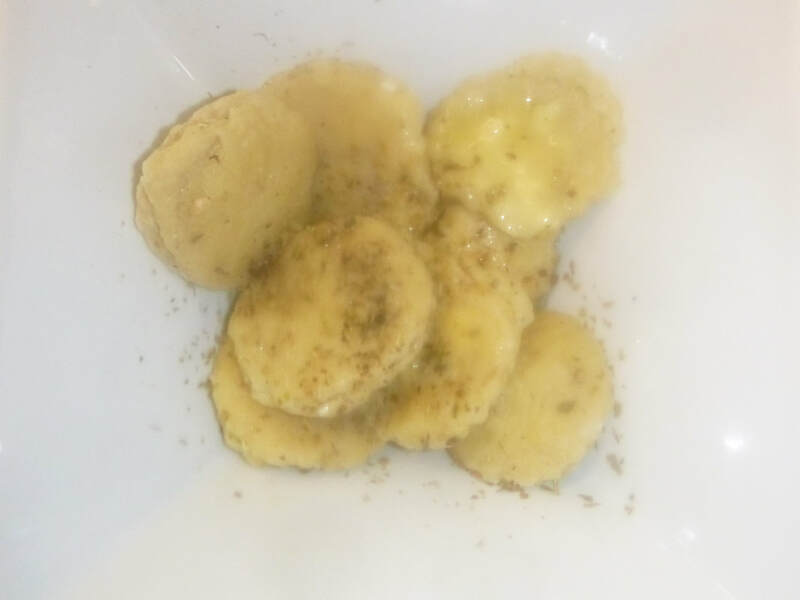 I will include the website below tomorrow so you can do some kitchen science at home!!! 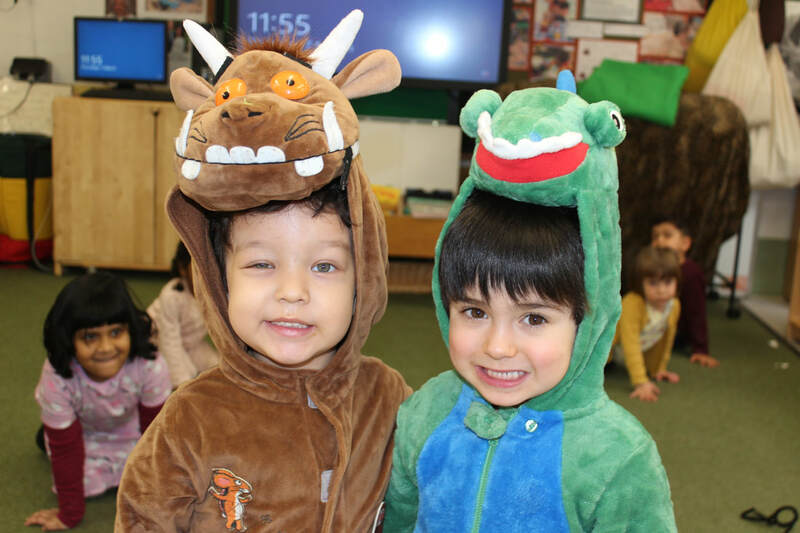 Straight after the success of our International Evening, we embraced World Book Day (with International Women's Day still to come on Friday). 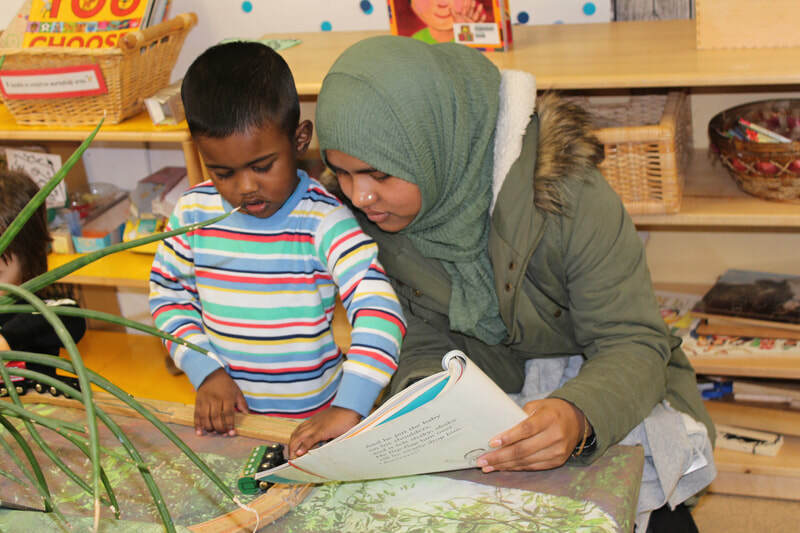 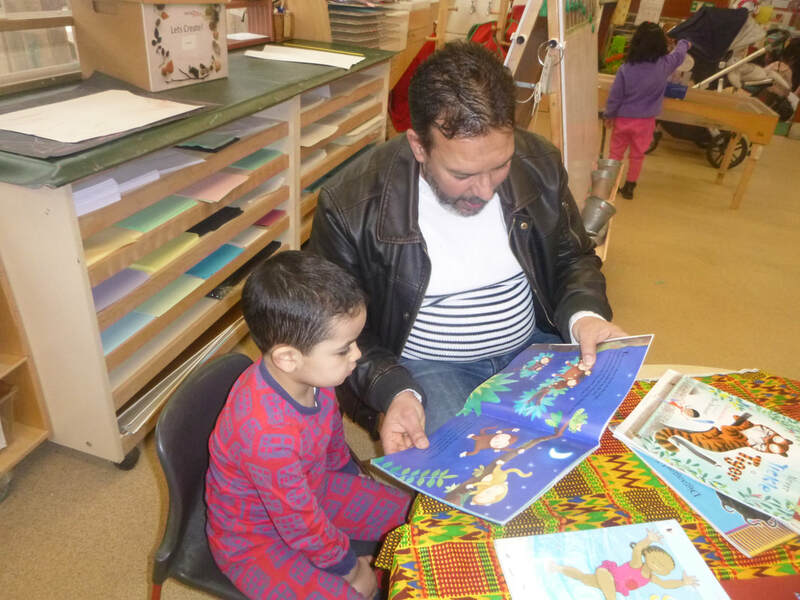 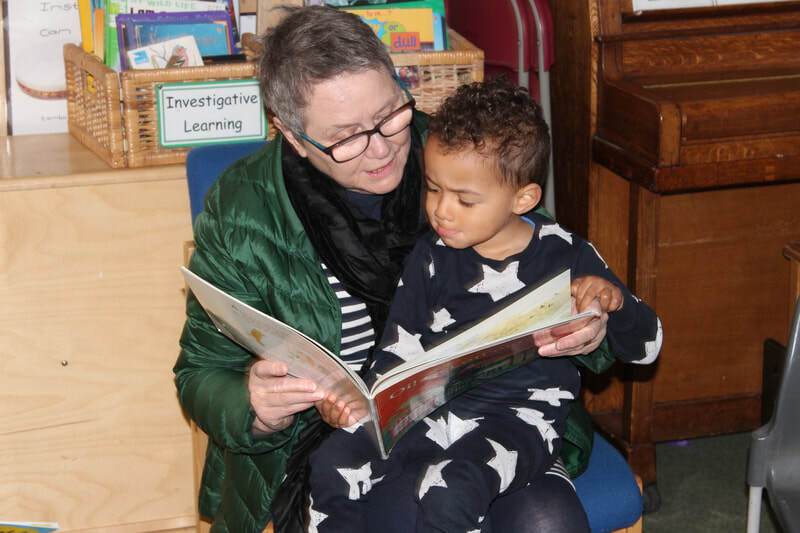 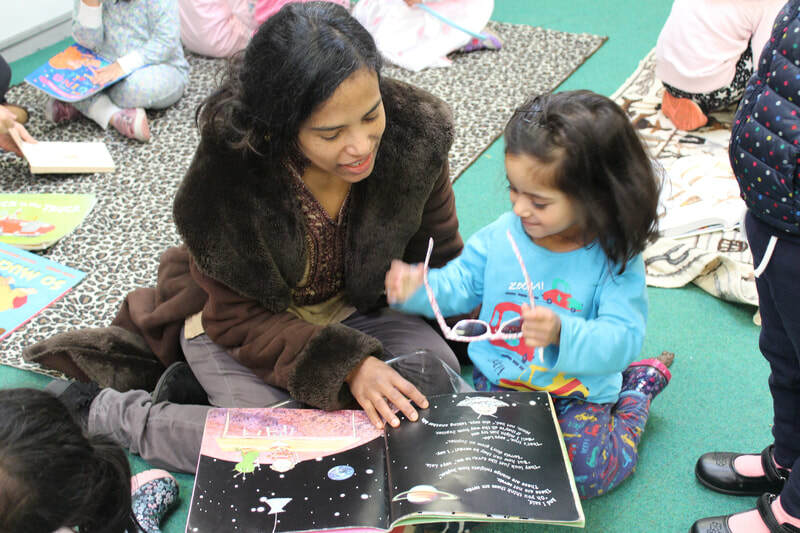 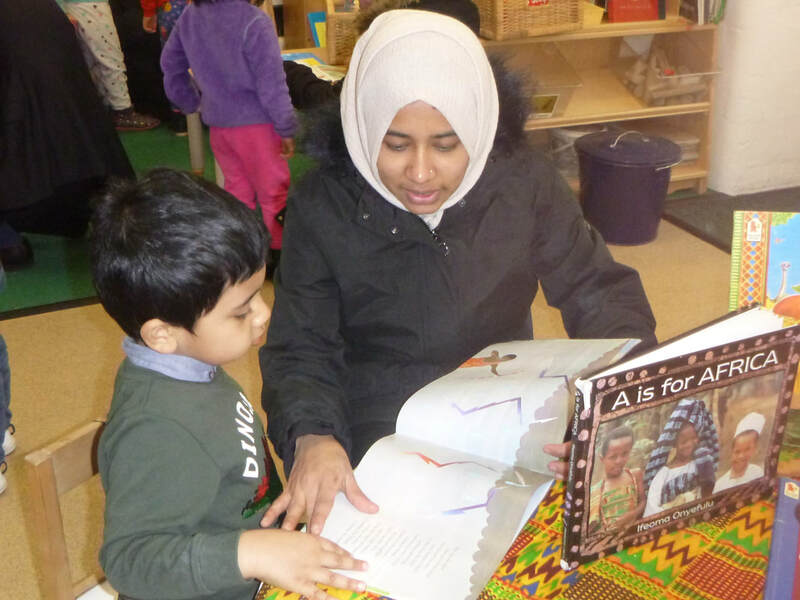 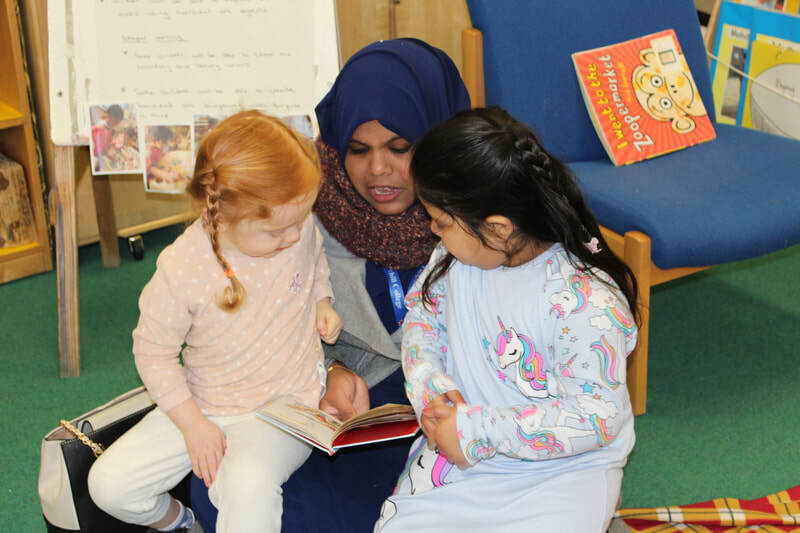 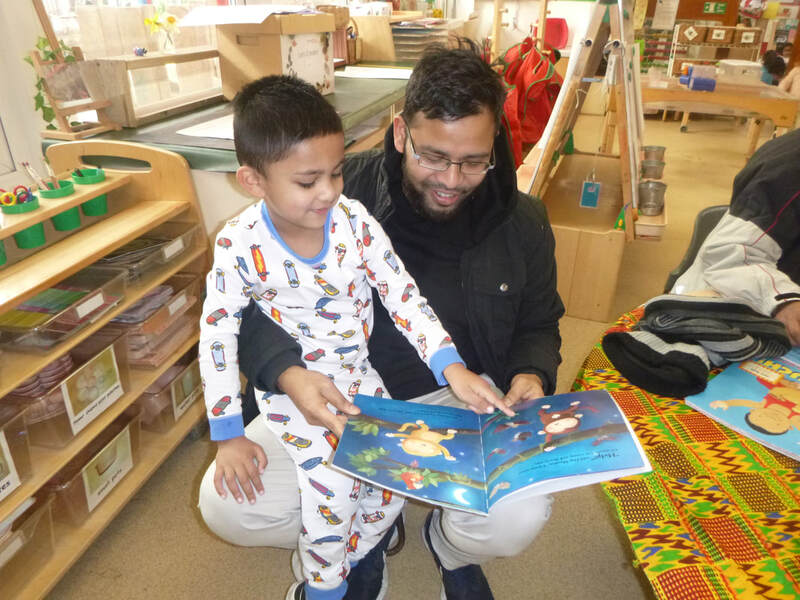 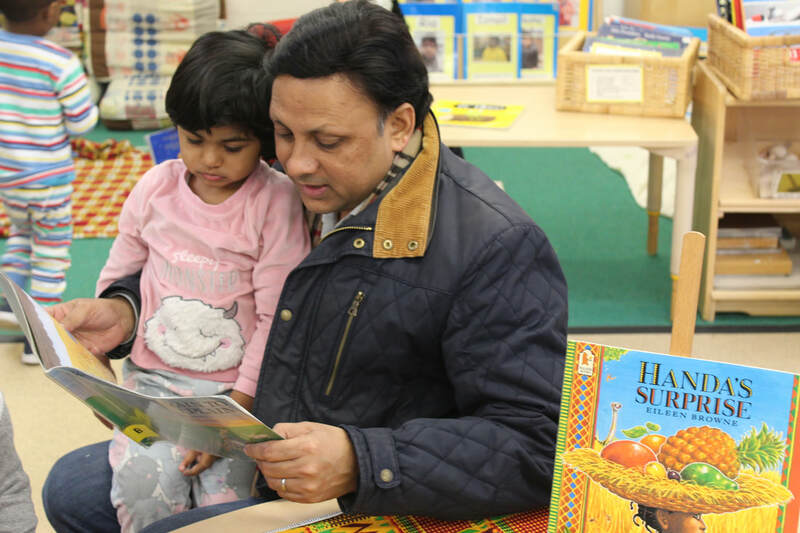 Children and staff wore their pyjamas to school to enjoy a lovely bedtime story. 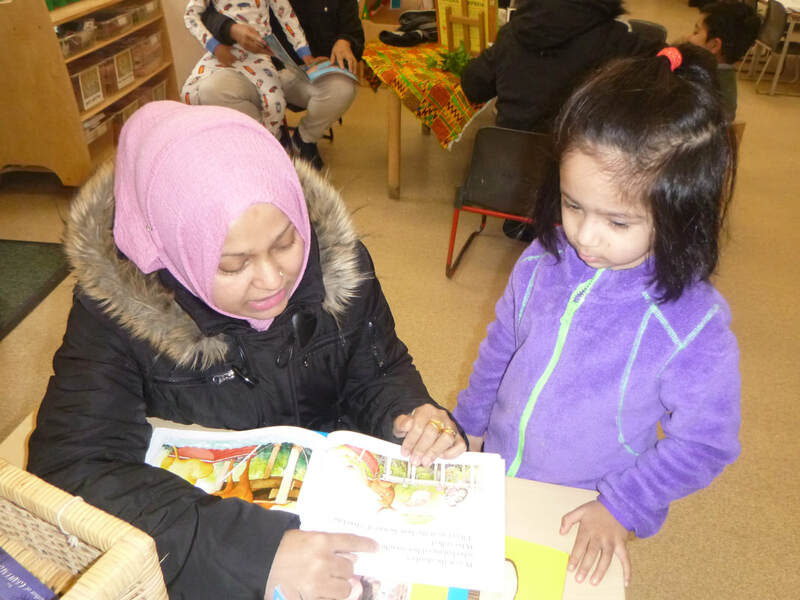 Some families stayed to share stories and books. 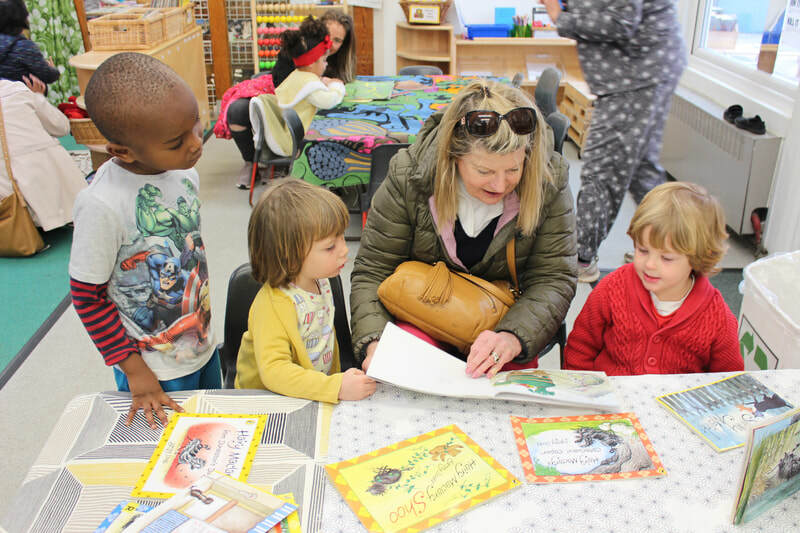 Books are so important at Rachel Keeling: from each child's own personal learning journey, their own Special Book, to books we use every day: cookery books, information books, receipt books, story books, class books and display books. 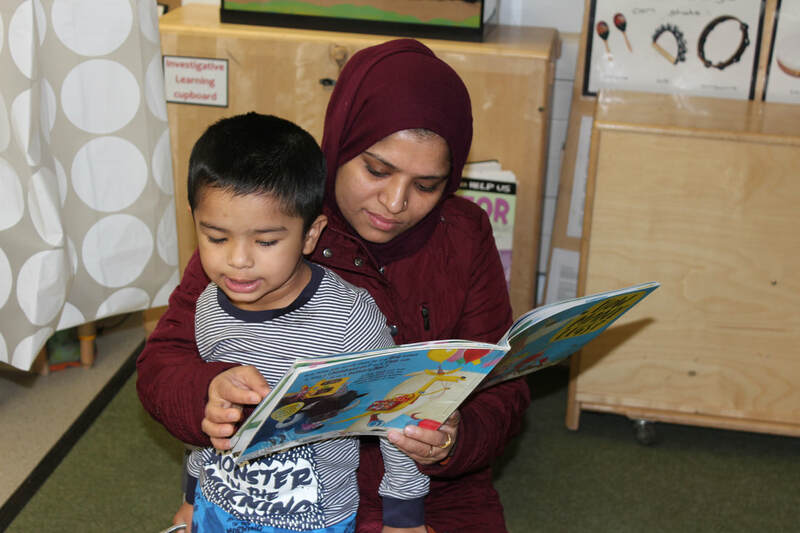 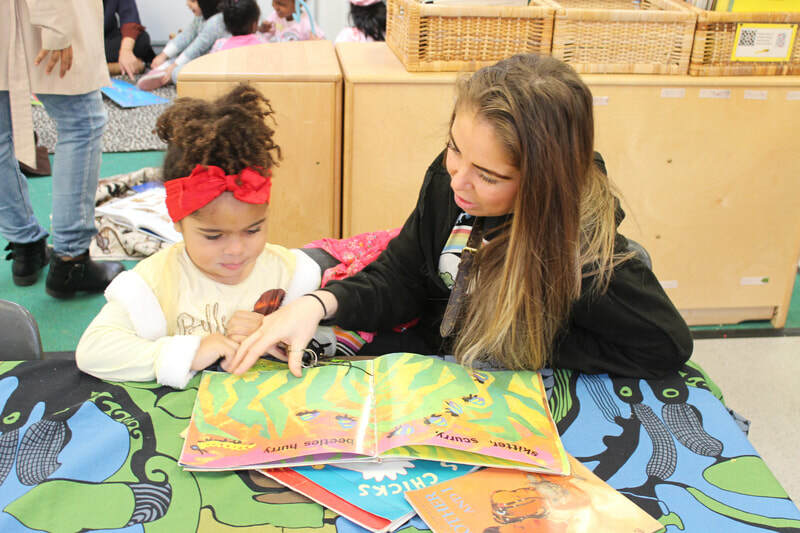 Children and staff use books to move learning on, to develop and enhance vocabulary, to complete a task (making pancakes), to increase wellbeing (who doesn't love a cuddle and a story?) 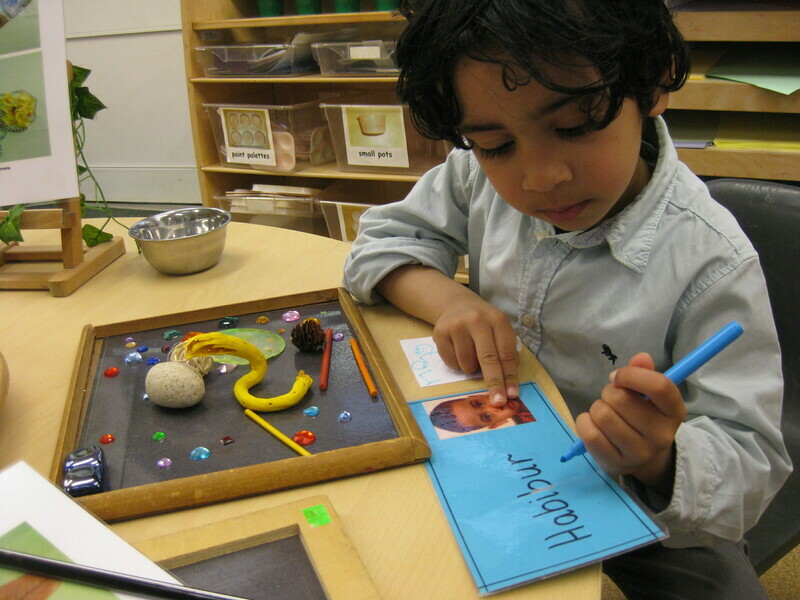 and to reflect on learning and inspire mark making. 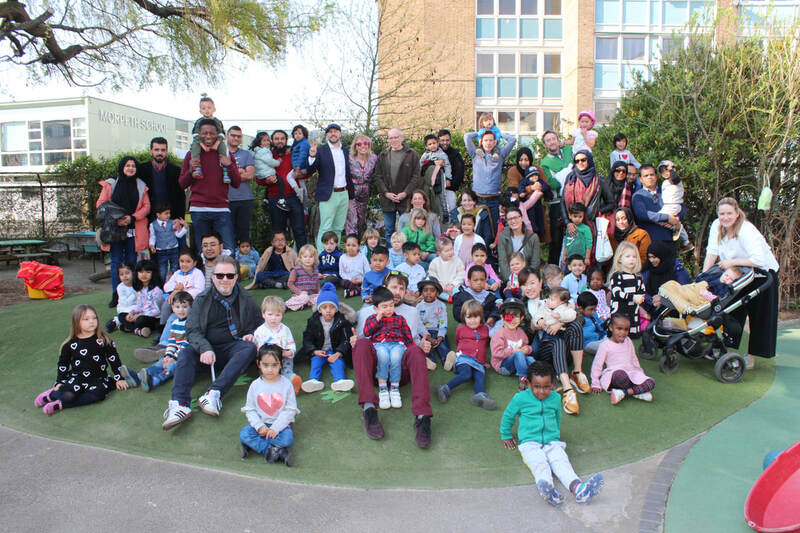 Thank you to all our families and staff. 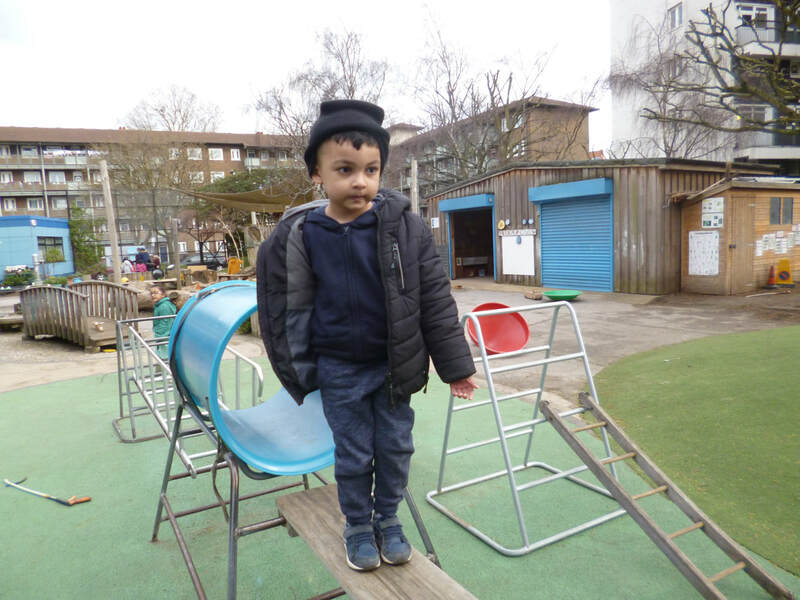 It feels strange being in civvies today! 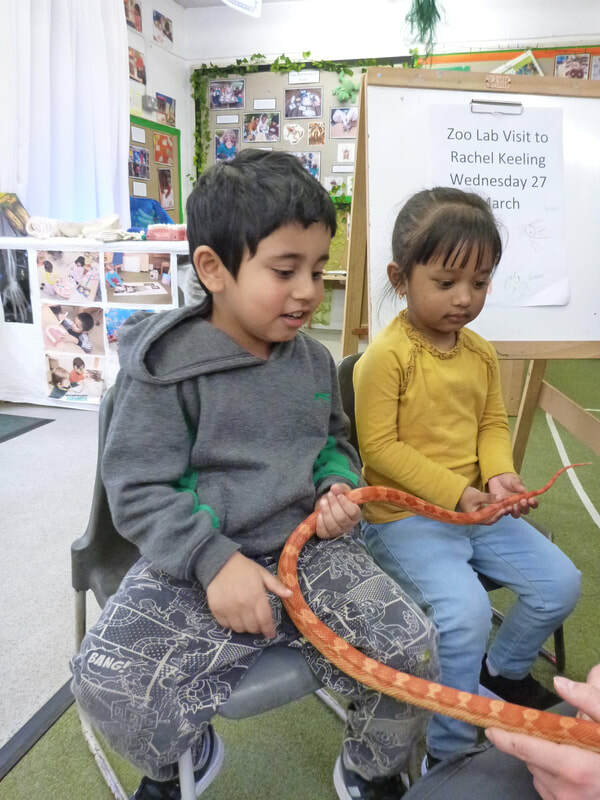 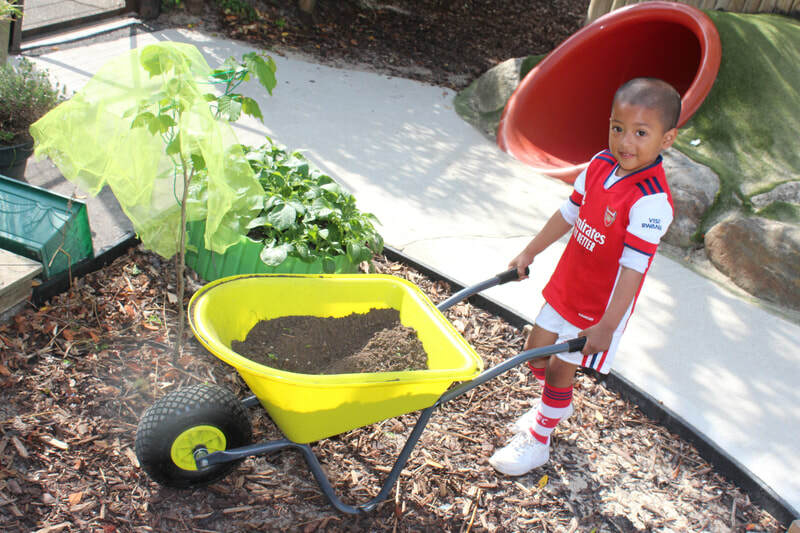 Wow, what a community the Rachel Keeling Nursery School has! 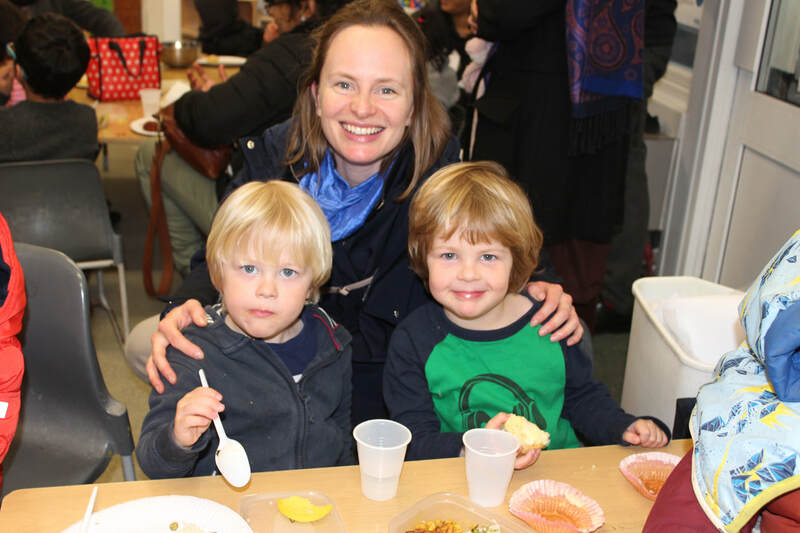 On Wednesday evening we threw open our doors to welcome families, past, present and future to our Annual Rachel Keeling International Evening. 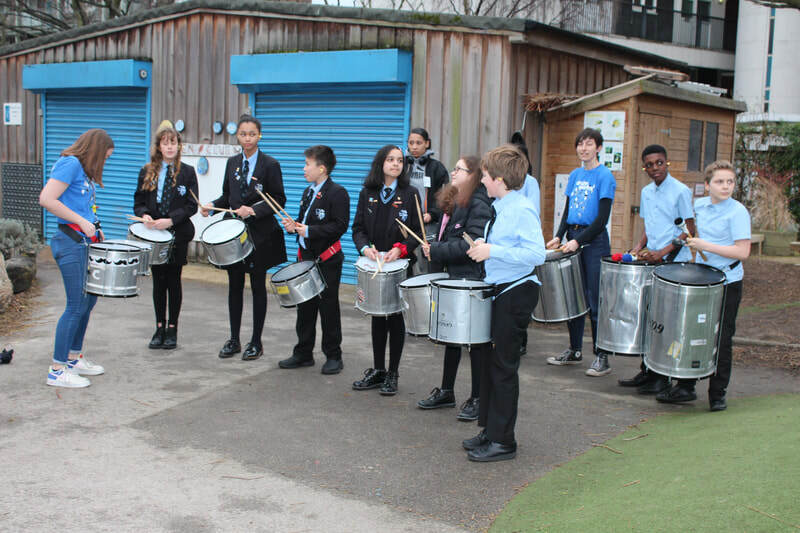 Kicking off with Morpeth School's Drummers who brought a real carnival feel to proceedings (and who knew drums alone could make you feel quite emotional?) 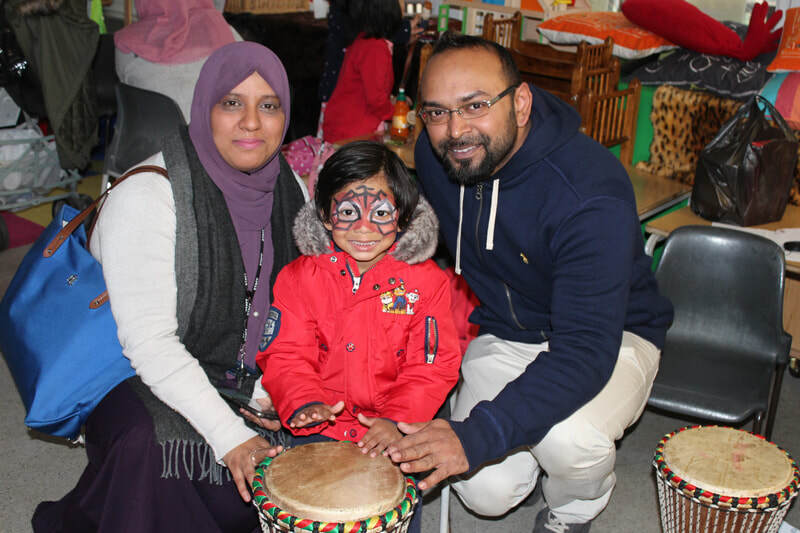 The rain abated and families gathered in the garden to dance and enjoy the rhythms. 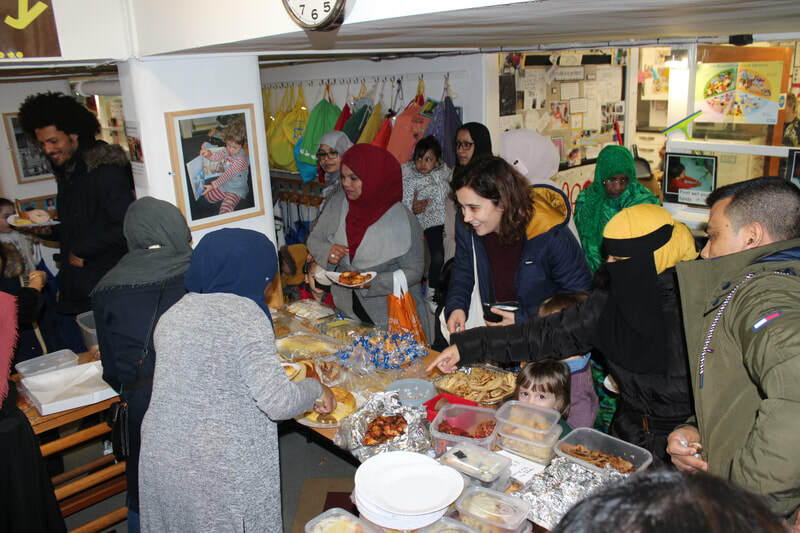 The generosity shown by your support by attending and donating the most incredible array of foods from almost every corner of the globe (certainly every continent was represented in the spread). 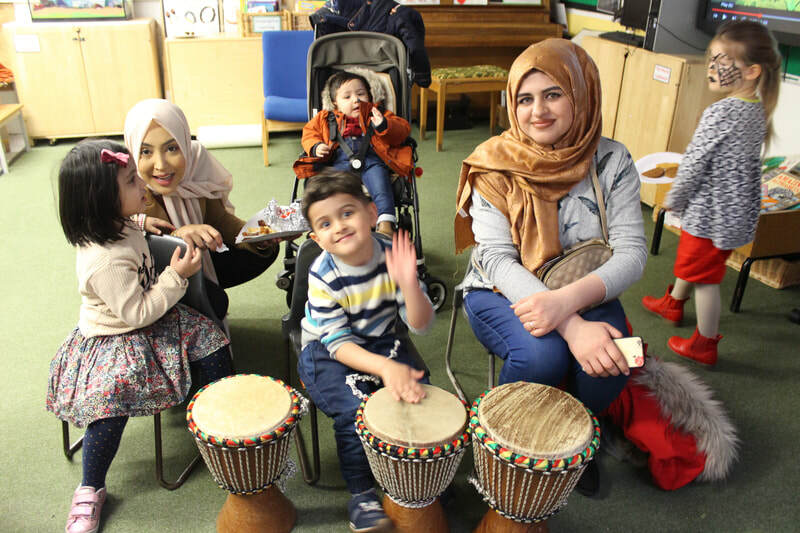 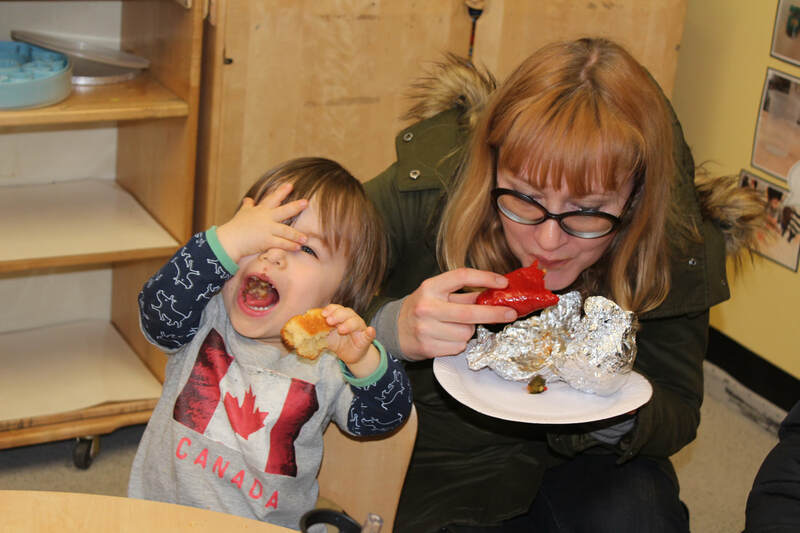 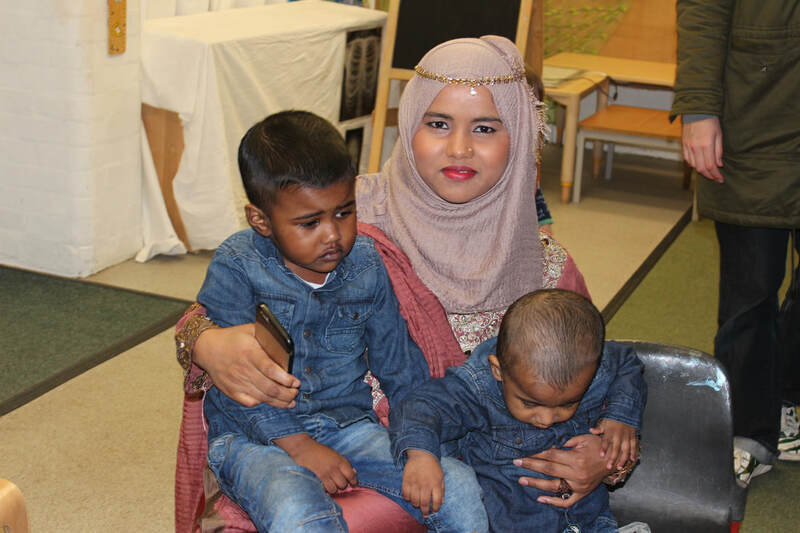 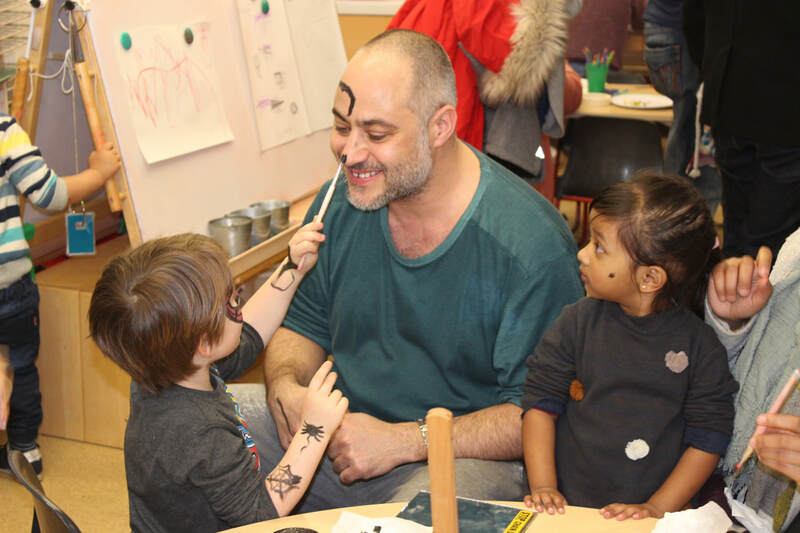 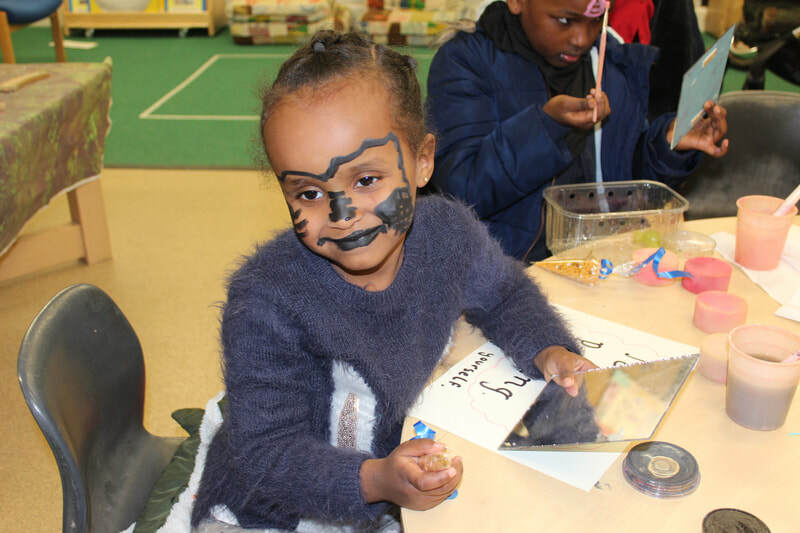 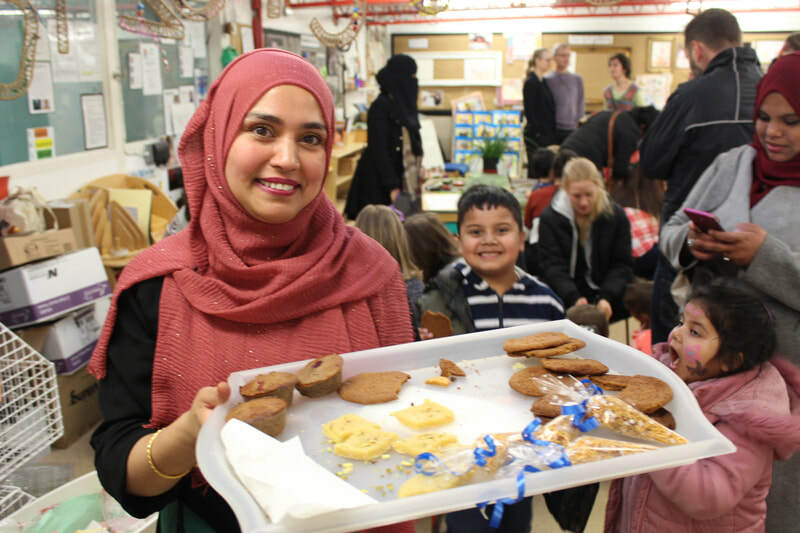 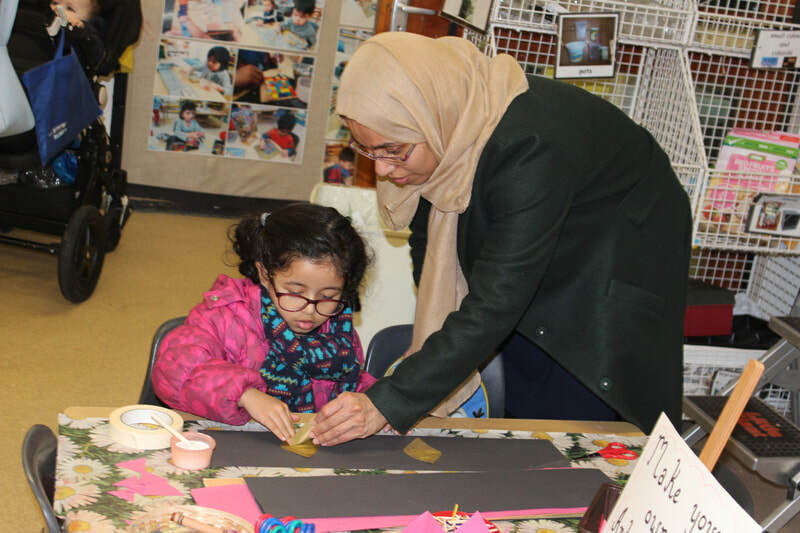 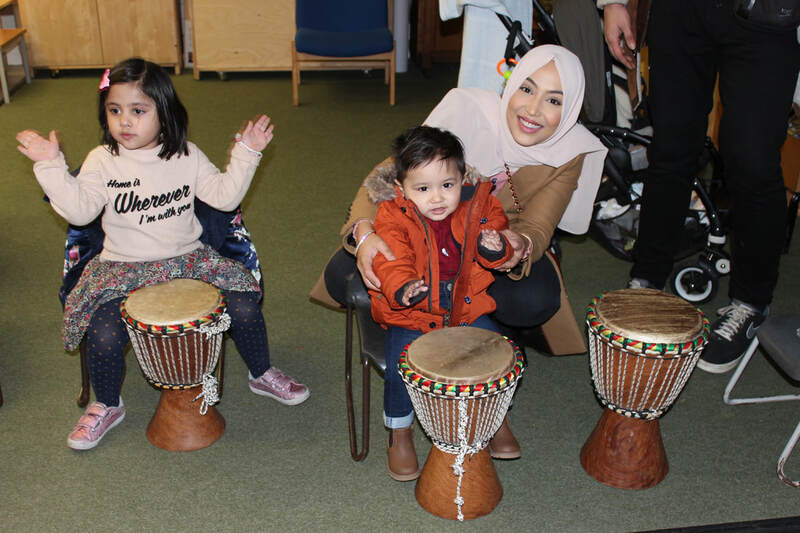 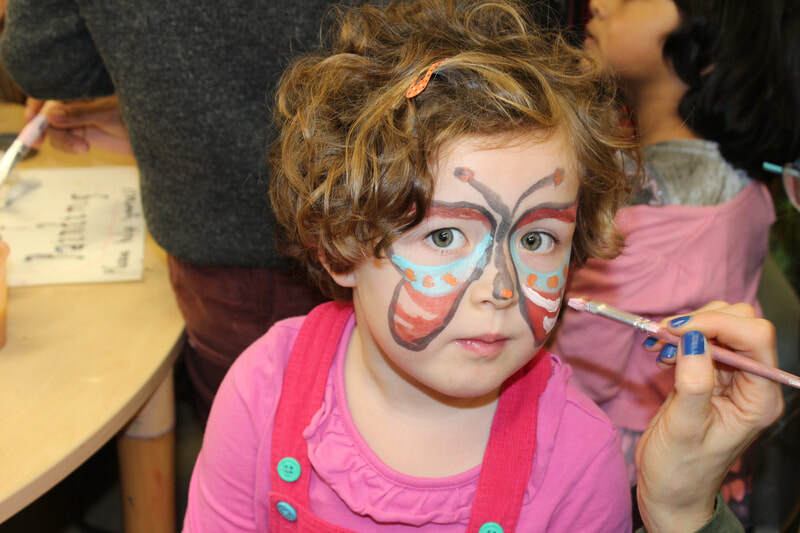 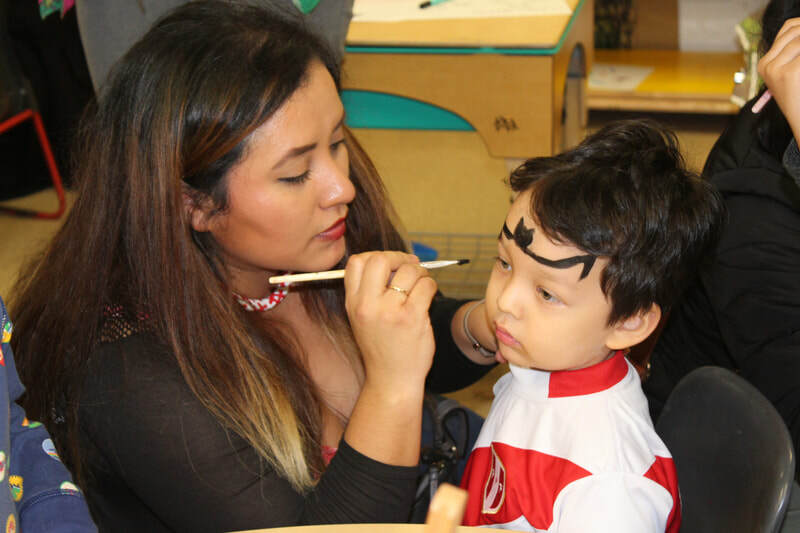 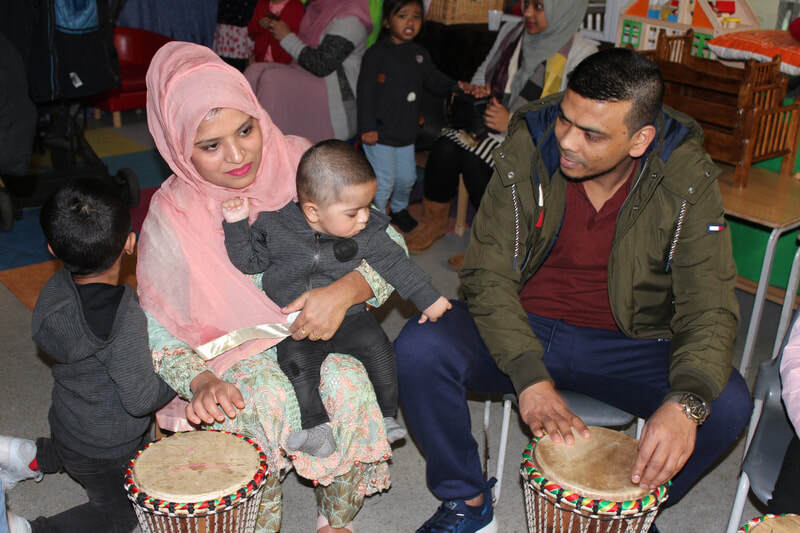 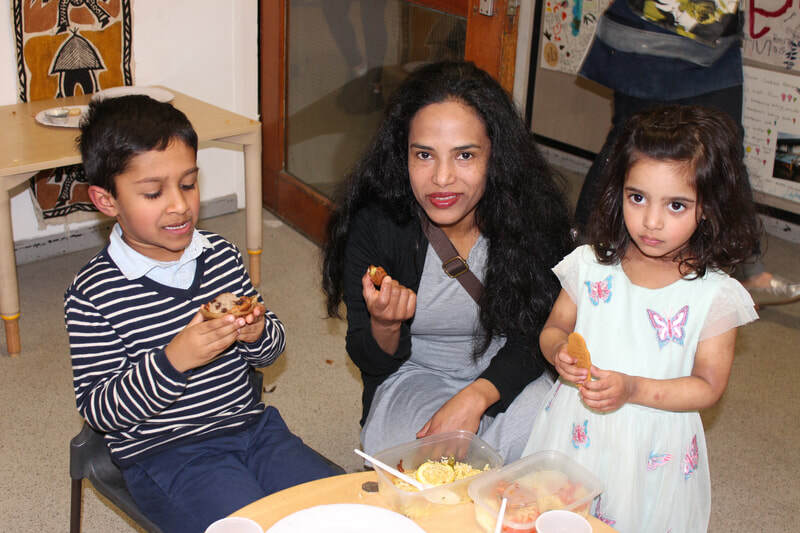 Families and staff enjoyed the food, crafts and music indoors and there really was a sense of love and togetherness. At a time when we are on the brink of Brexit, we put the UNITED into KINGDOM! 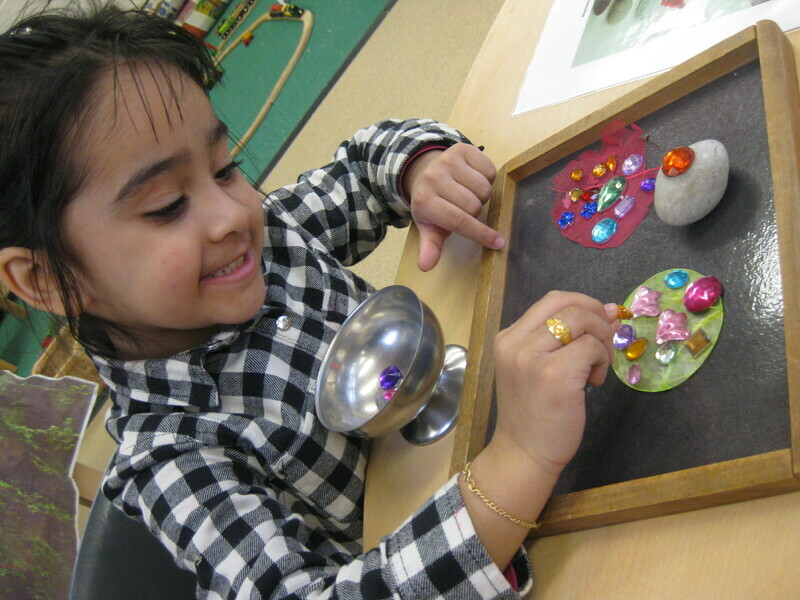 At Rachel Keeling we are always reflecting on the dispositions we want children to develop. 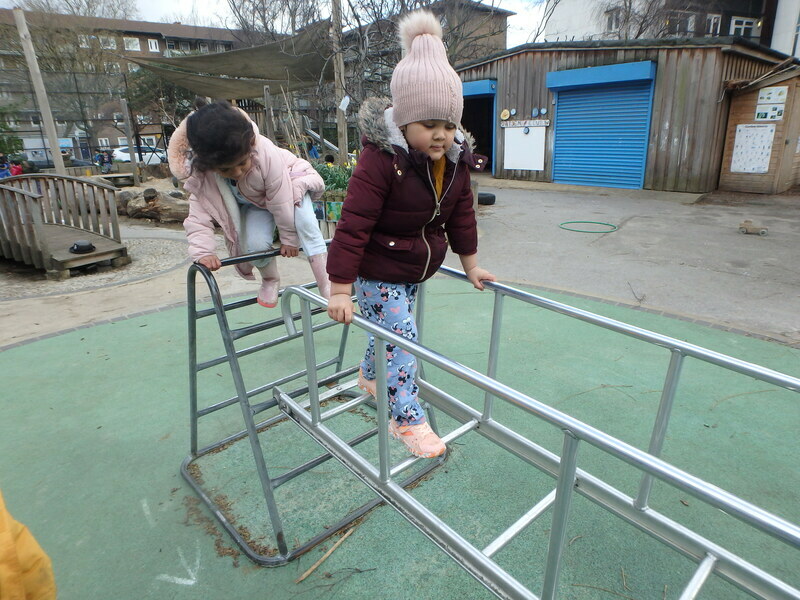 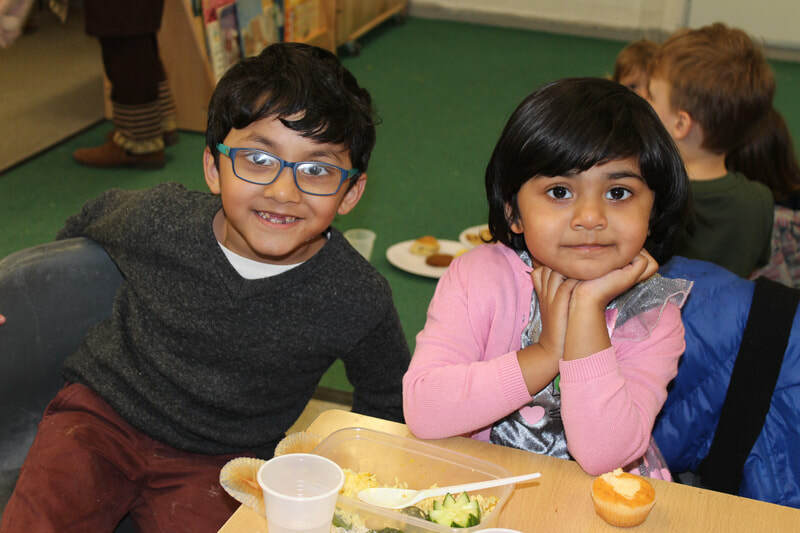 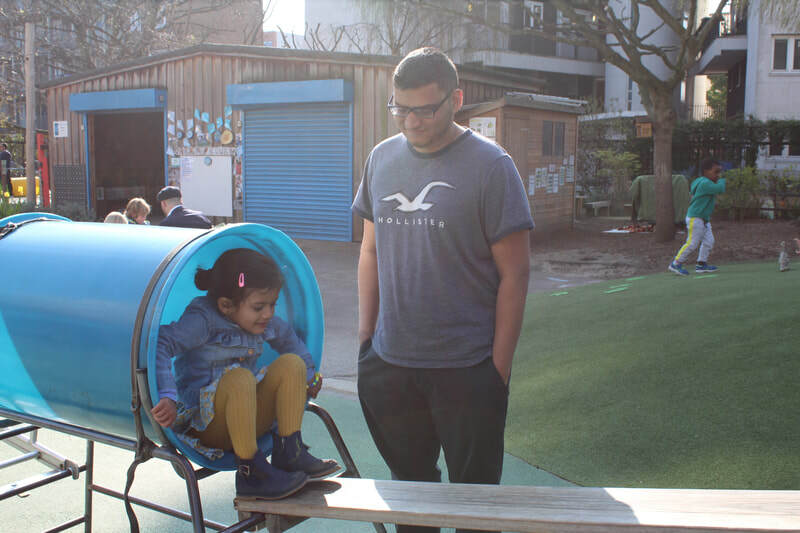 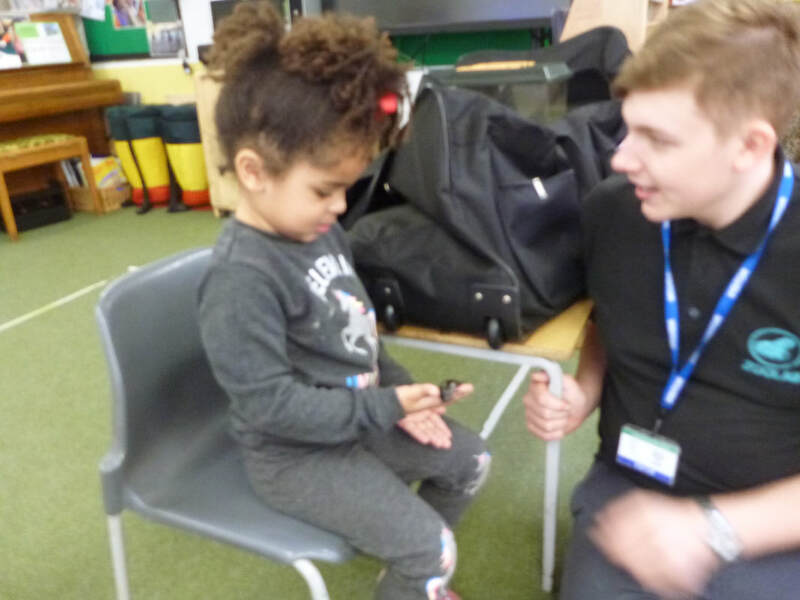 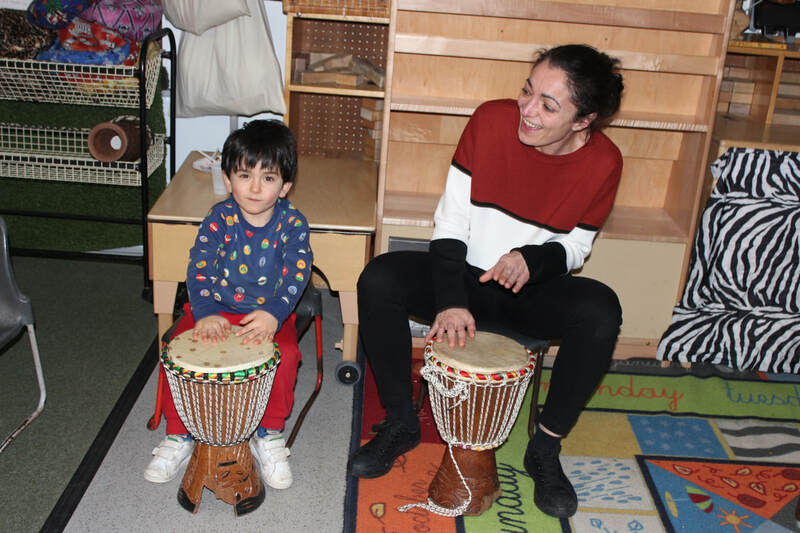 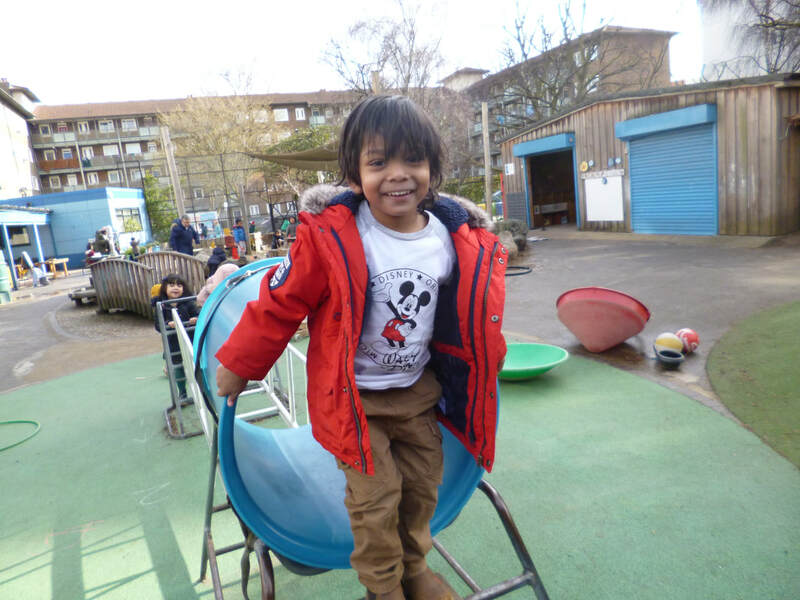 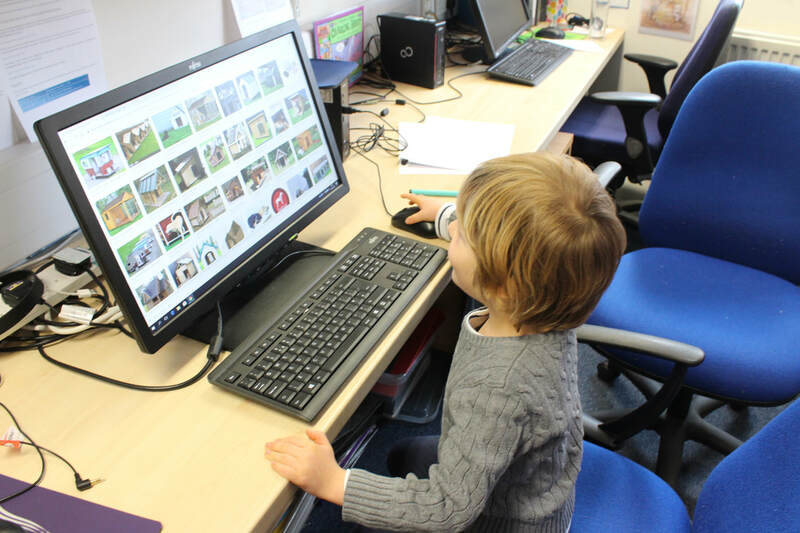 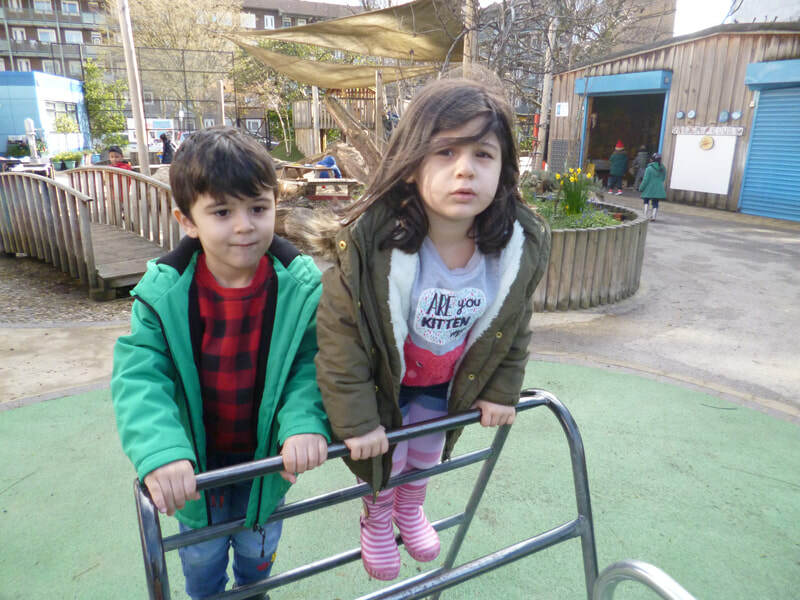 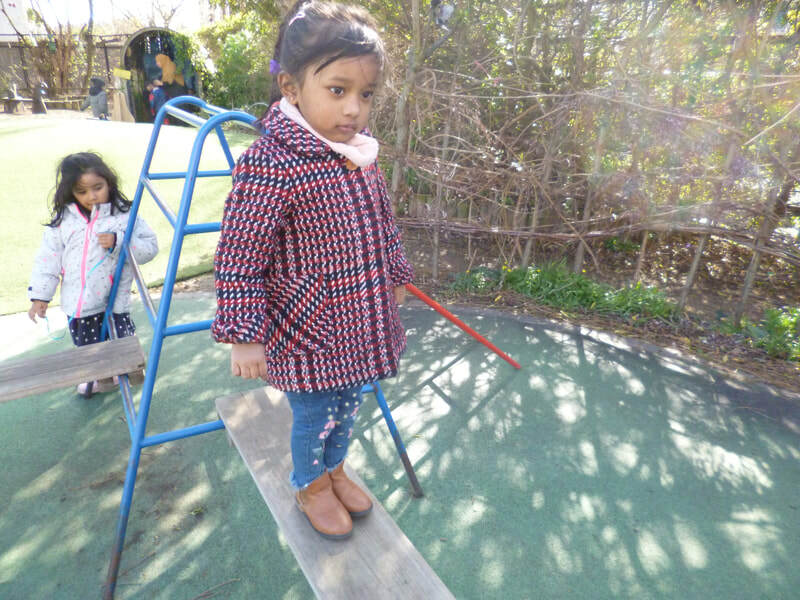 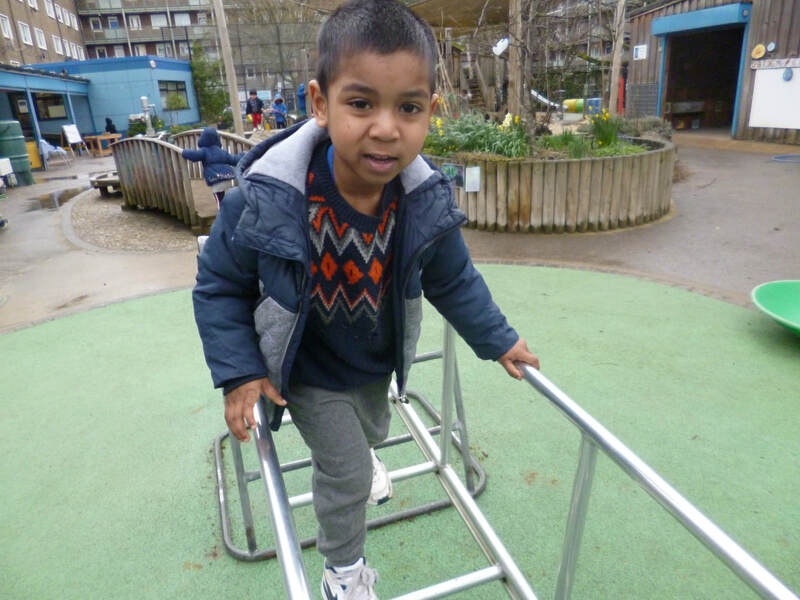 We ensure our environment, provision and interactions support the effective development of independence, confidence, communication, resilience, empathy and joy for learning. 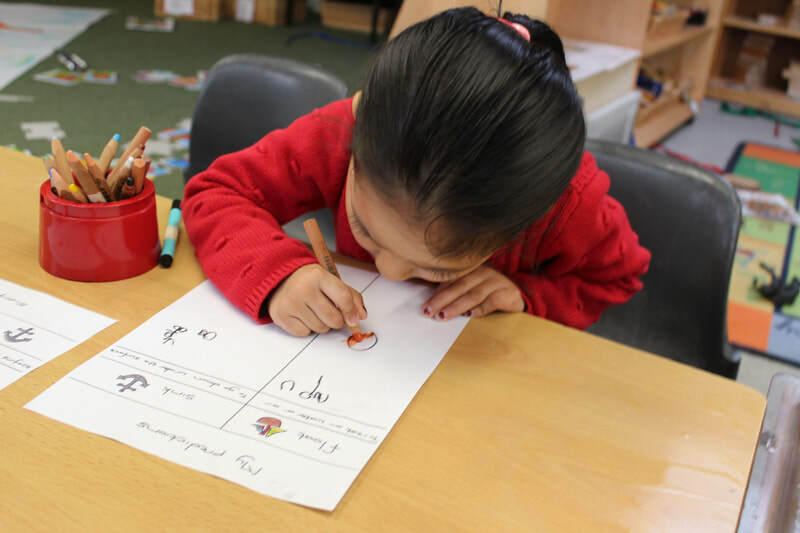 Over the past two weeks one practitioner has led a small group of children on a journey to develop these dispositions on their own research projects. 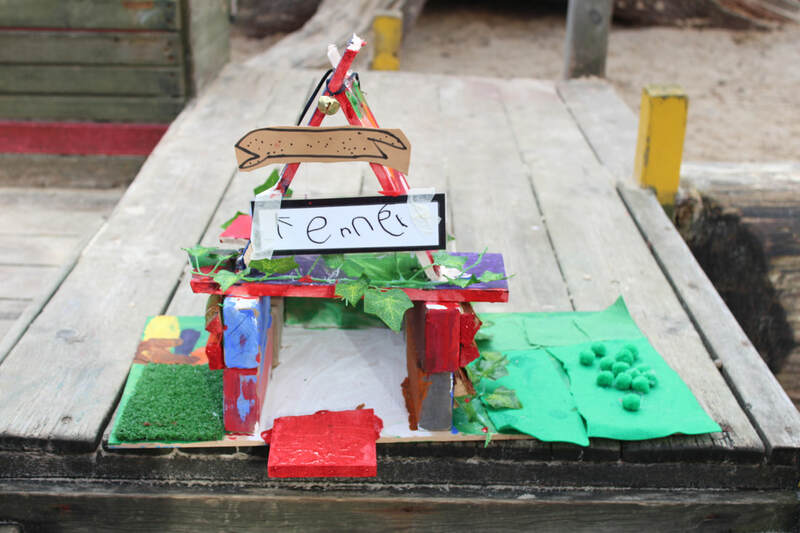 I have shared two examples above but others were also involved in their own projects and indeed other children were inspired to set about designing and making without any adult support! 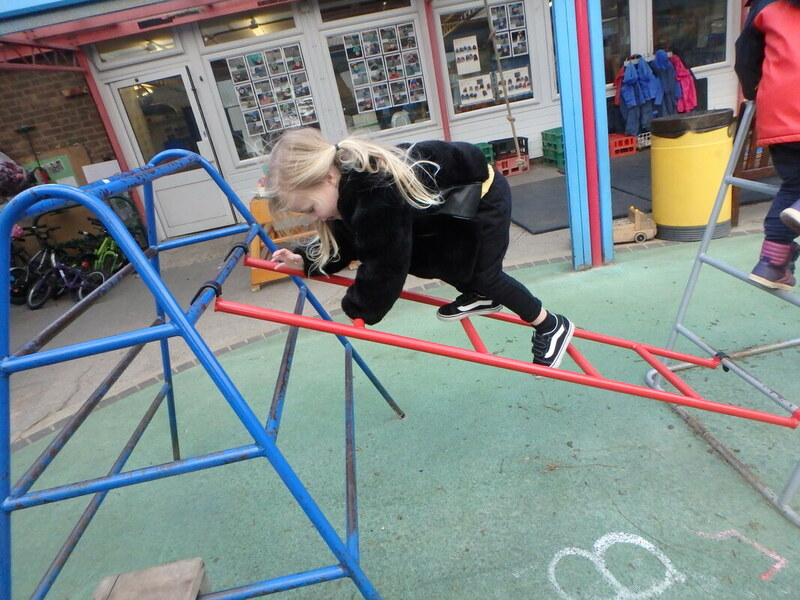 Children returned to this on a daily basis as they chose to and really took the lead in their learning. 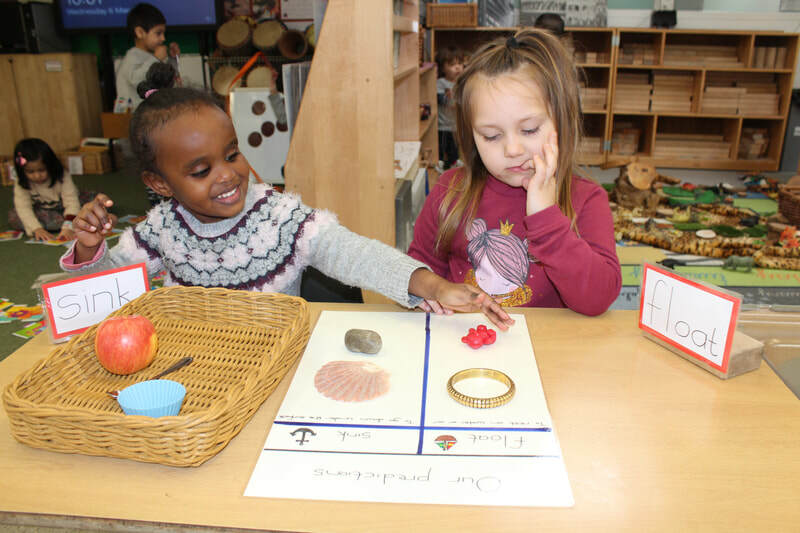 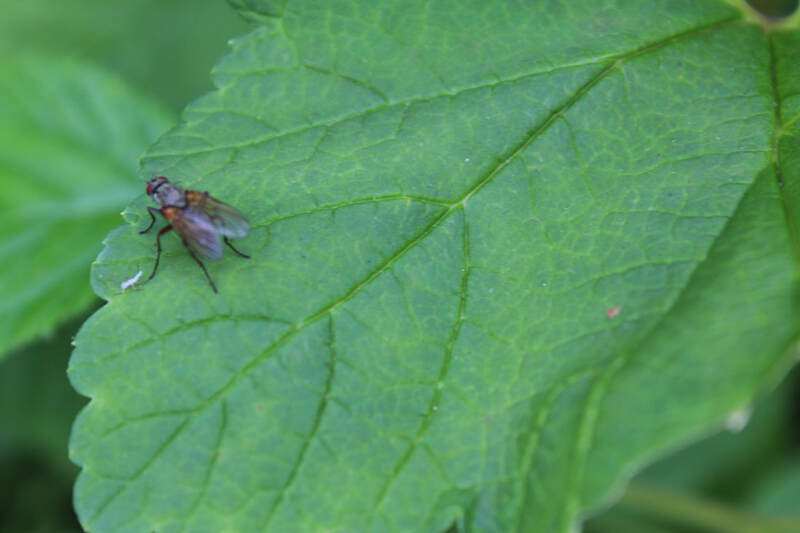 A practitioner was on hand to be co-collaborator and support the children's thinking. 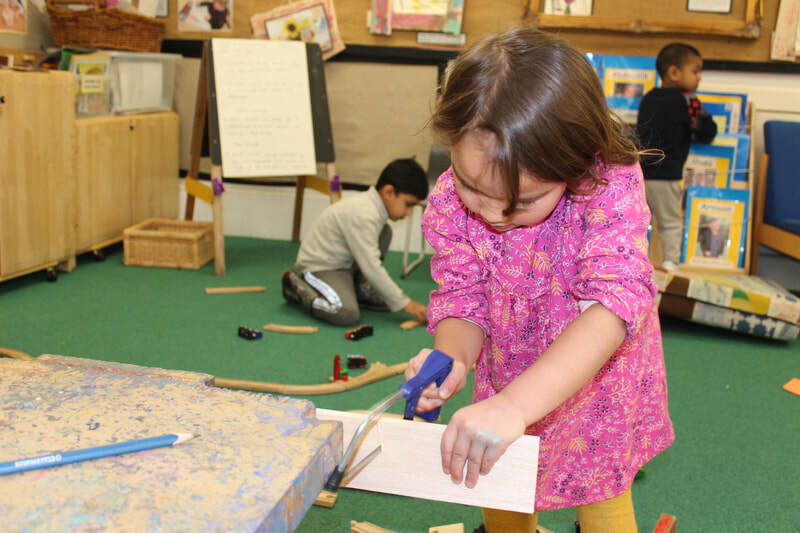 What was incredible was the process-led learning that took place. 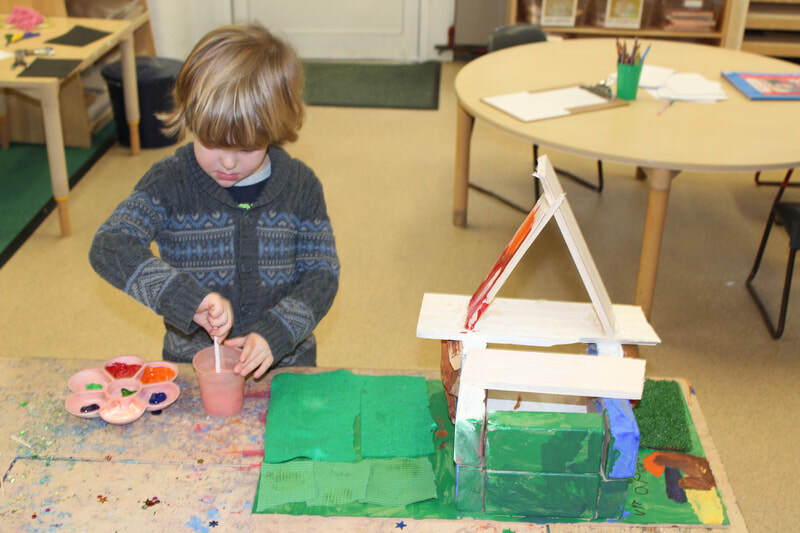 The children had a vision but they remained open-minded as they worked alone and alongside others. 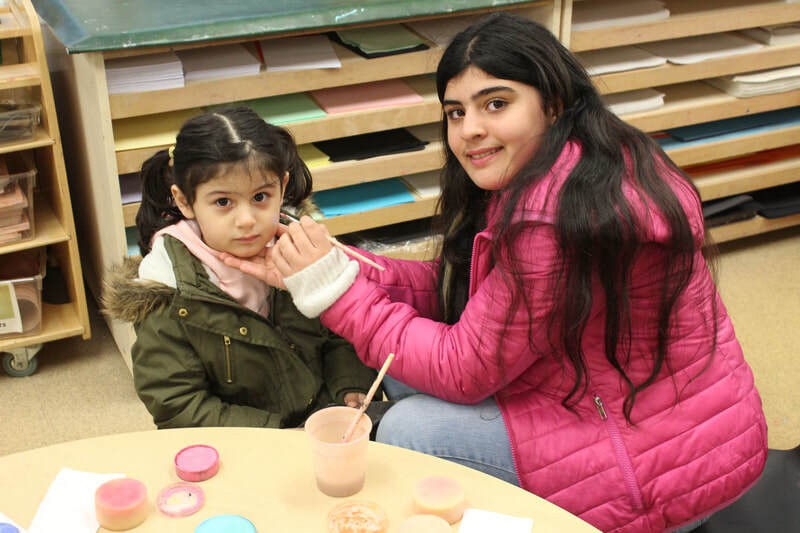 They really included other children in the process, asking them to help paint and fix parts. 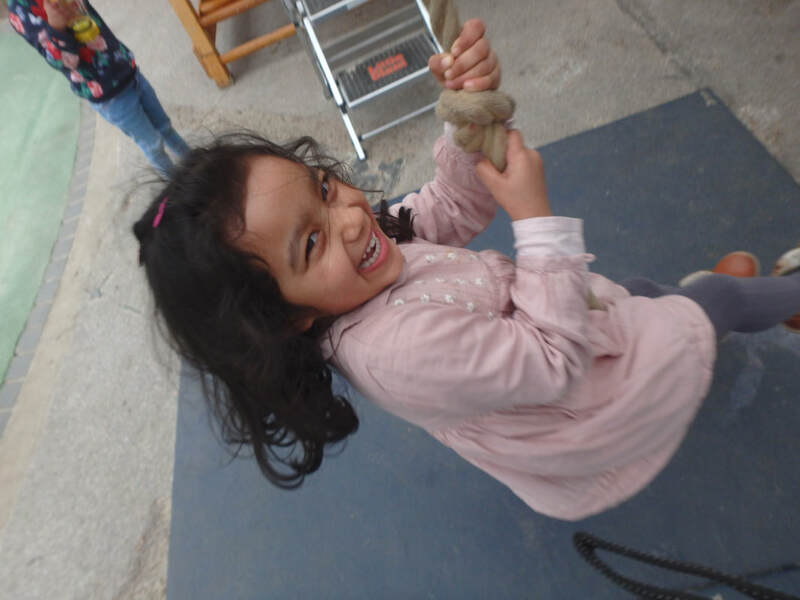 On days when some adults can lack agency, our children really demonstrated they had bags of it!